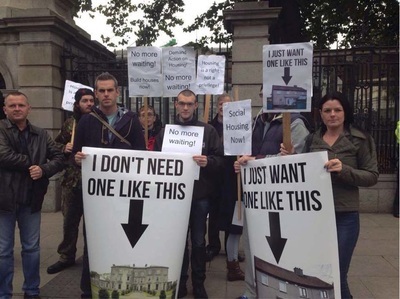 Democracy at work - Ceann Comhairle says NO! 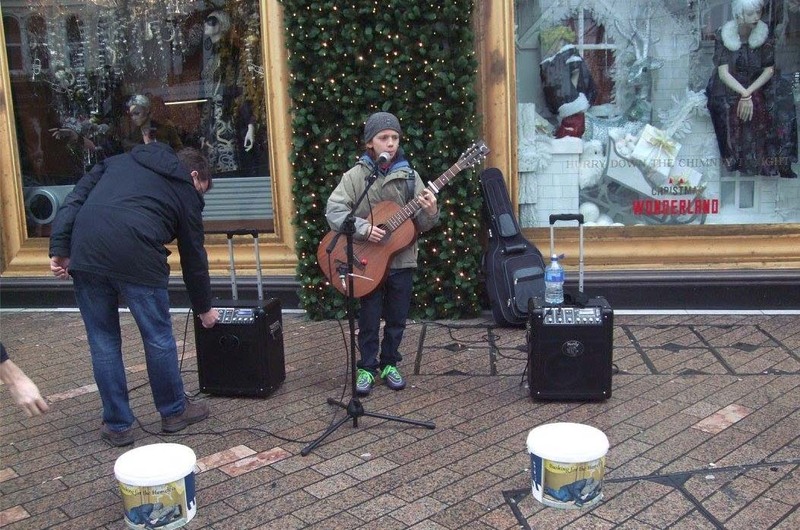 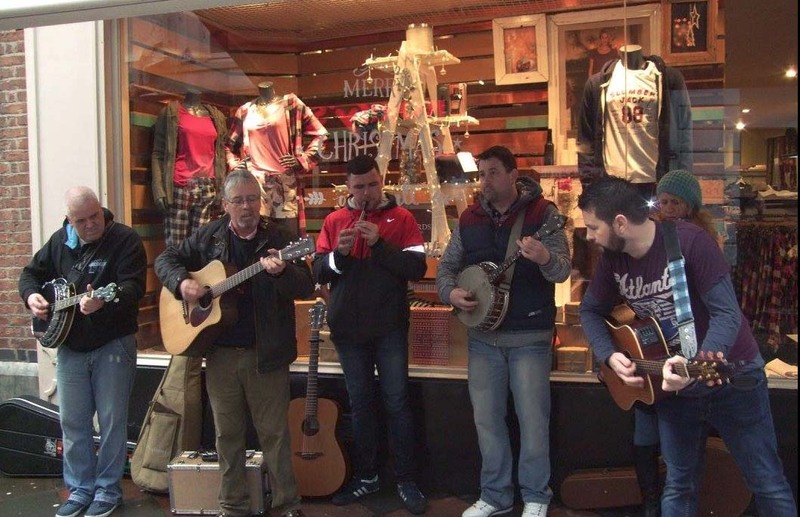 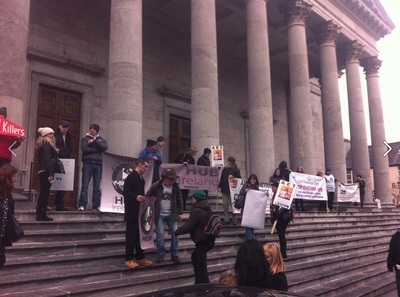 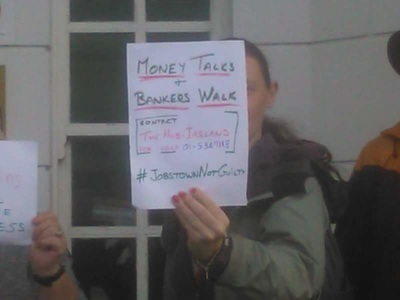 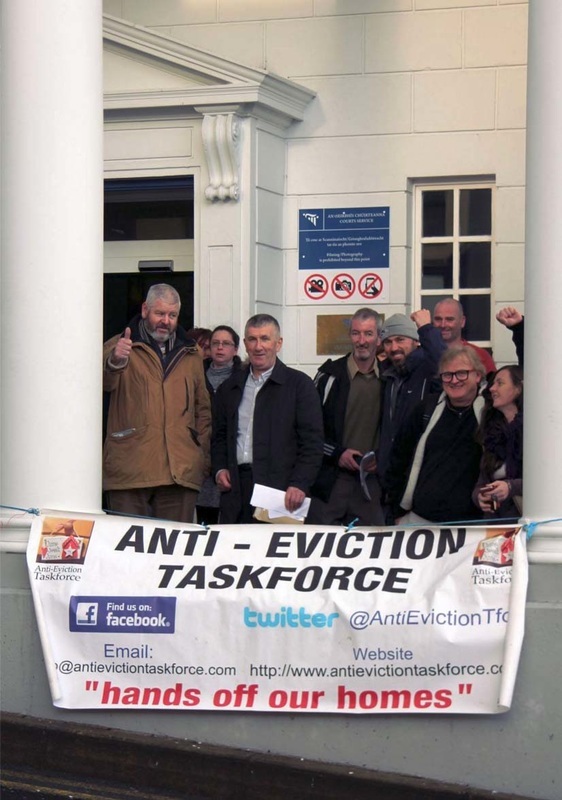 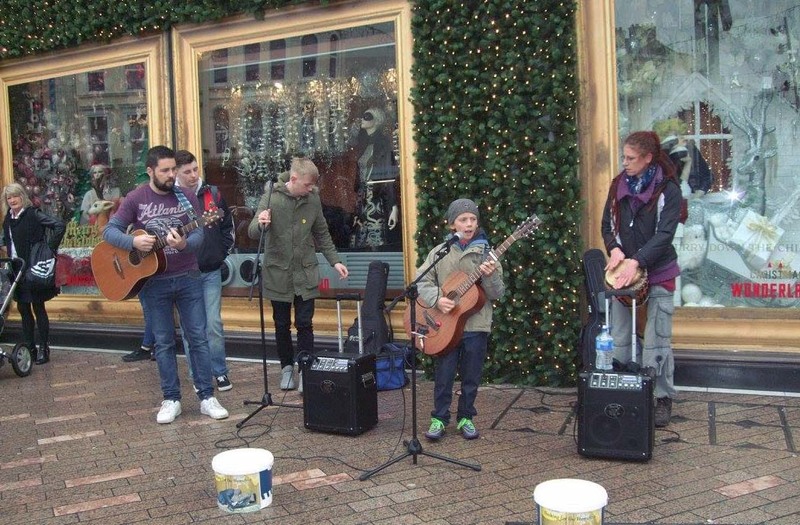 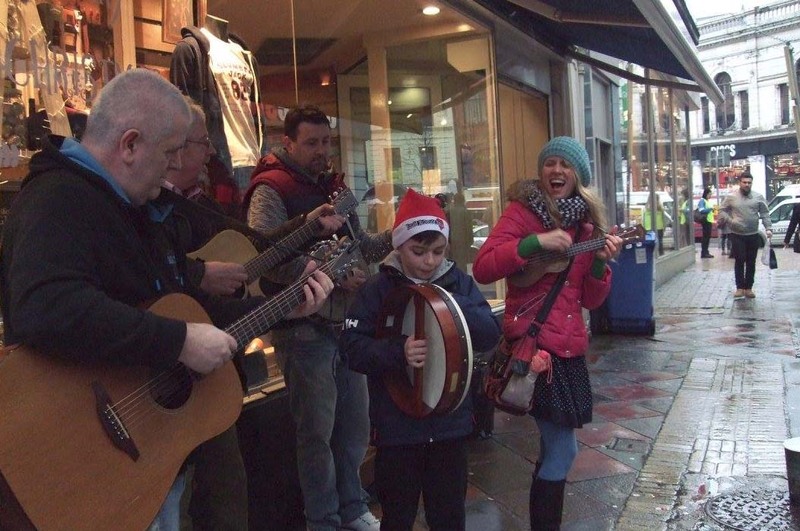 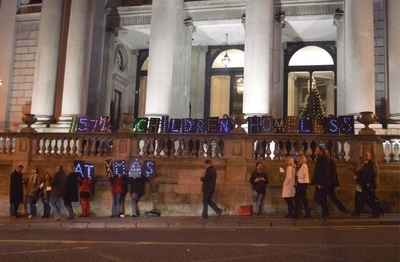 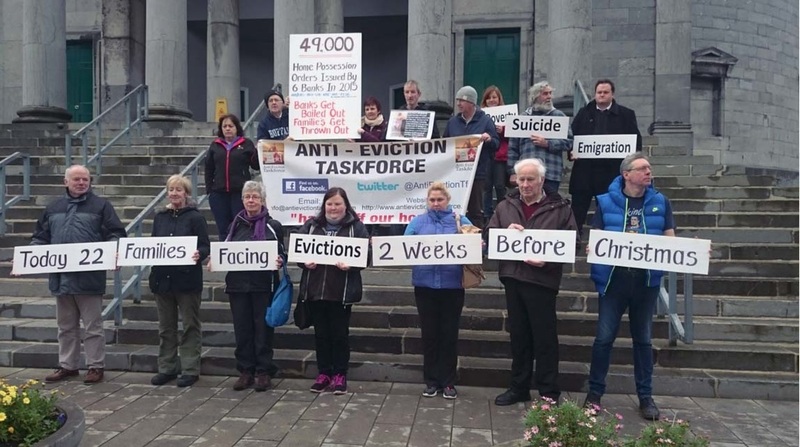 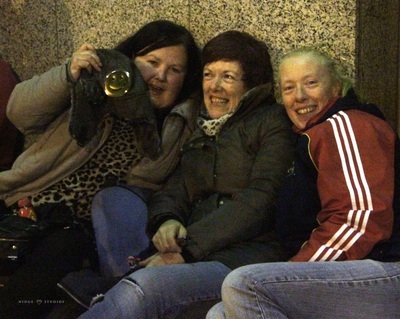 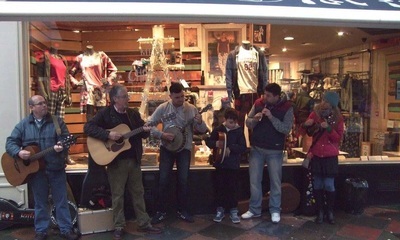 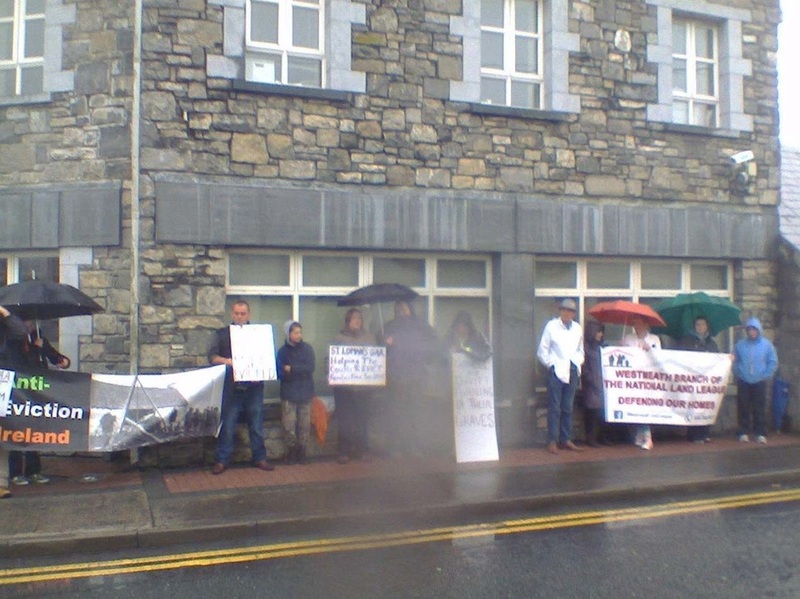 Outside Bank of Ireland in Tralee for evicting family homeowners the week before Christmas. 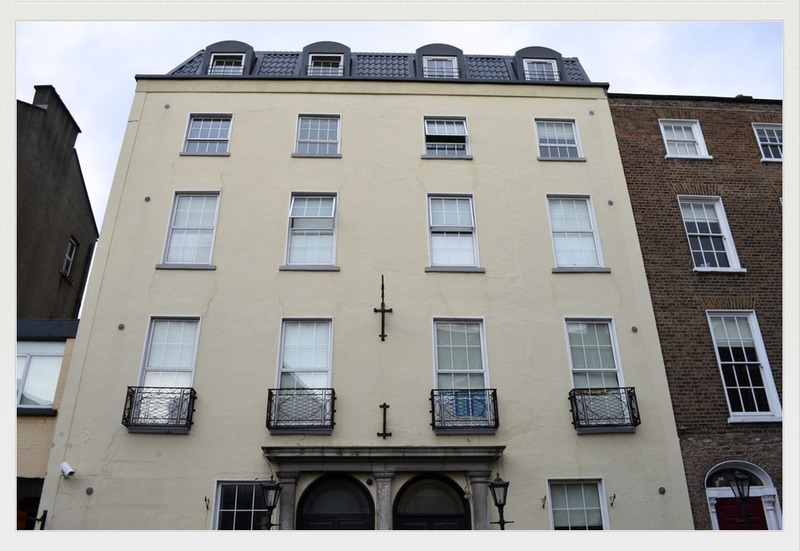 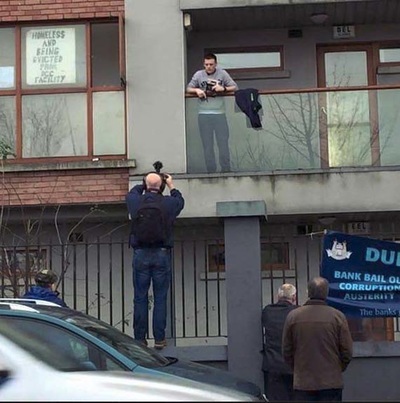 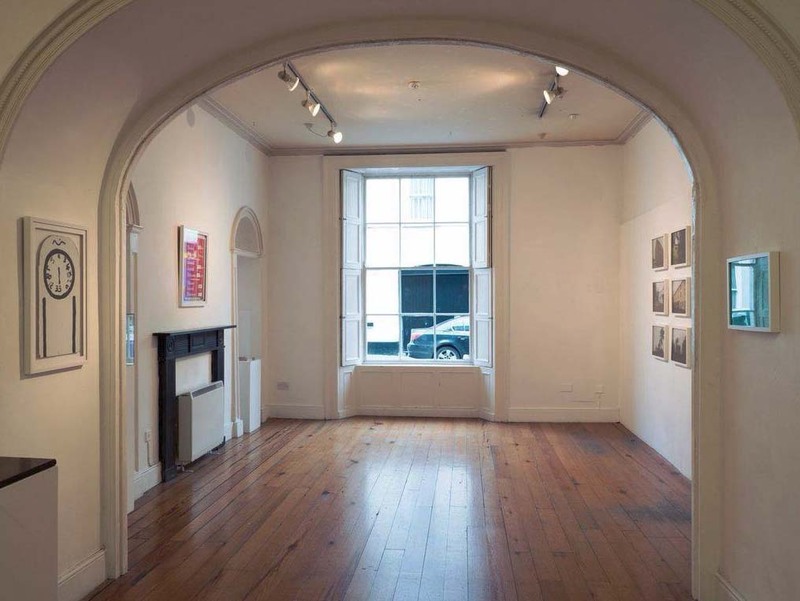 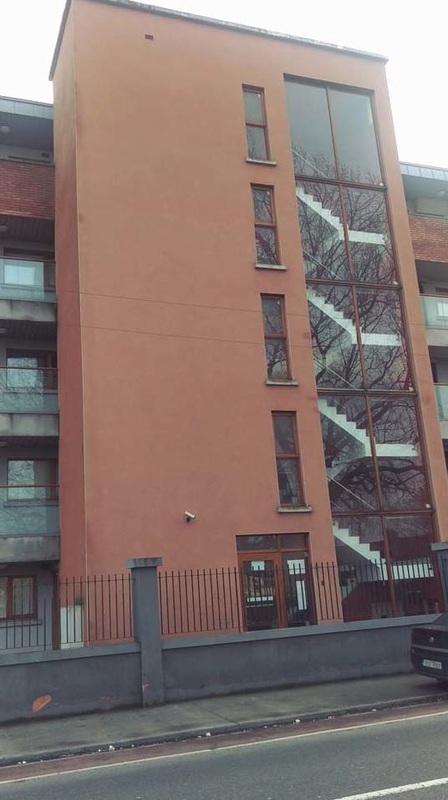 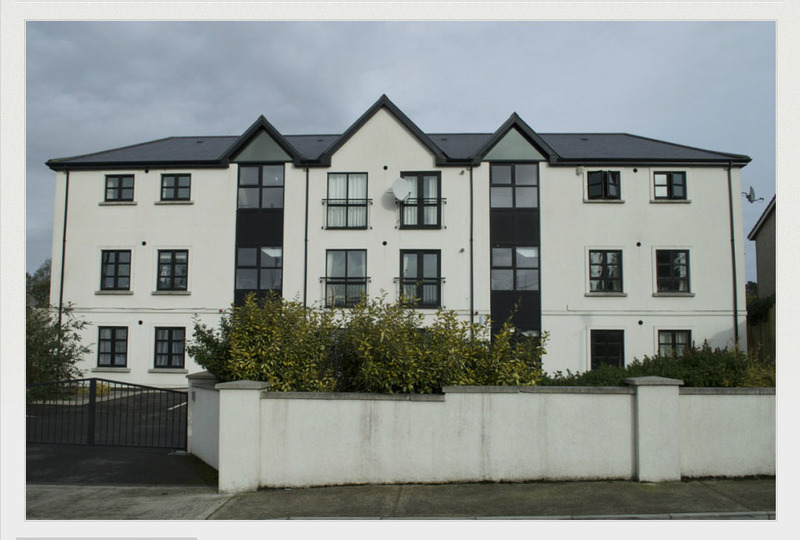 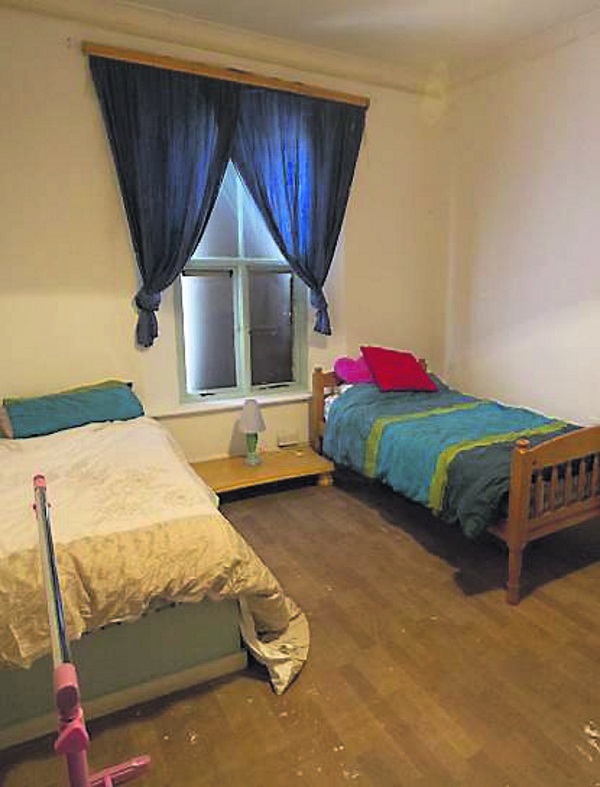 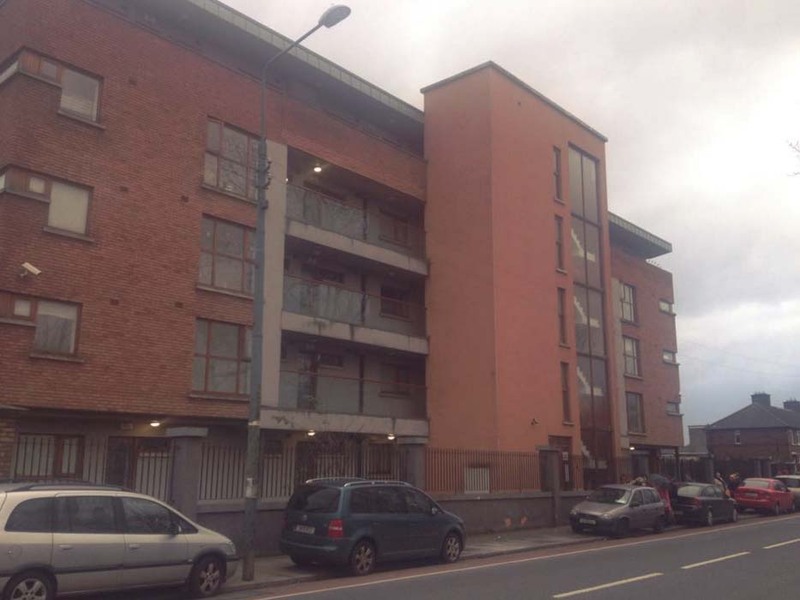 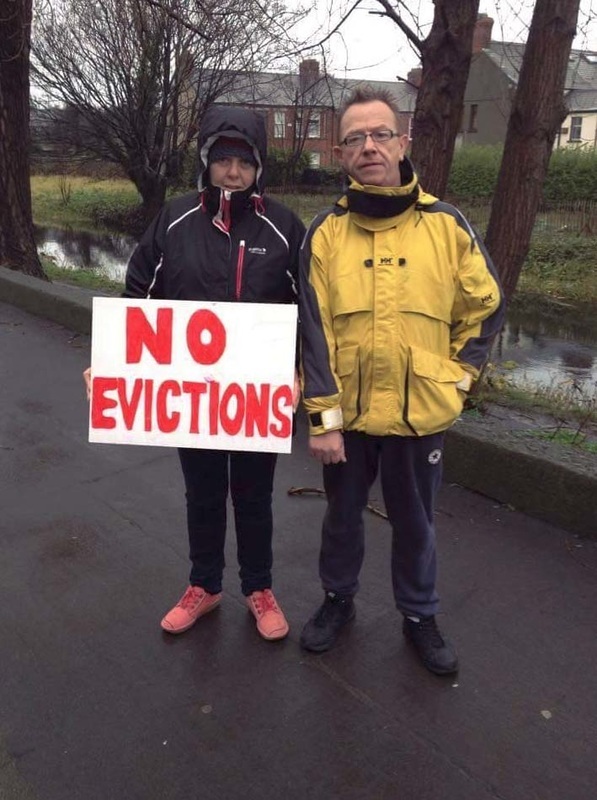 Today Raymond Farrell, of his own free will and after achieving favourable concessions from Dublin City Council vacated Apartment 8 in Catherine's Gate on Parnell Road. 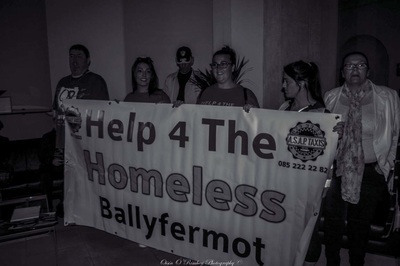 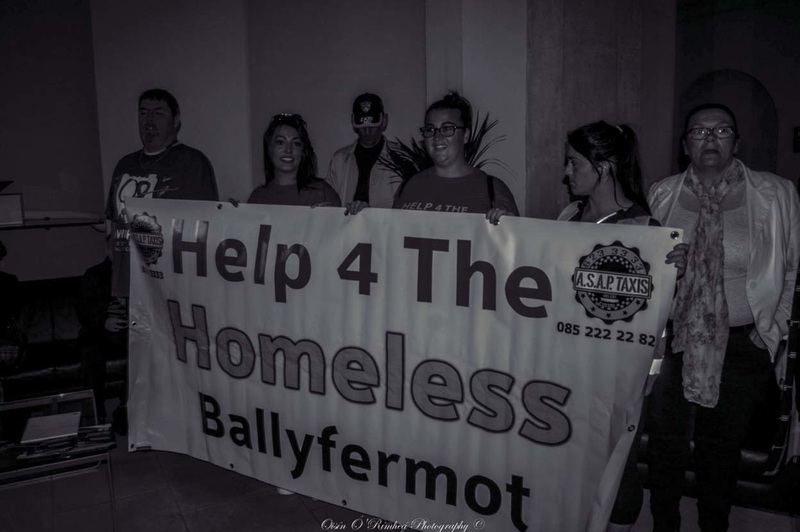 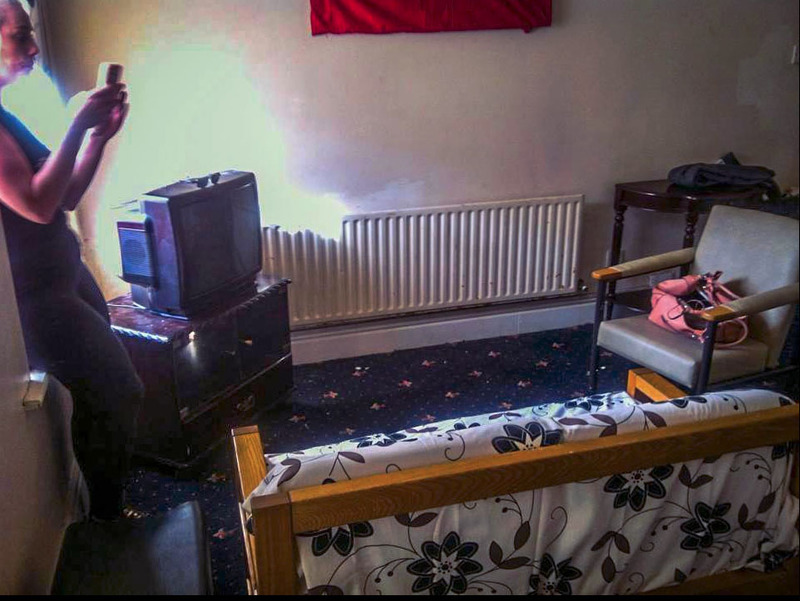 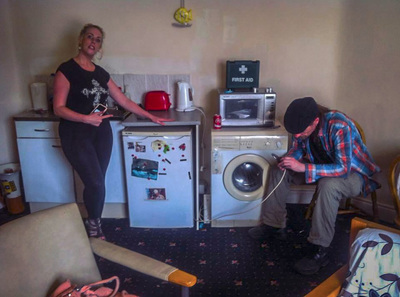 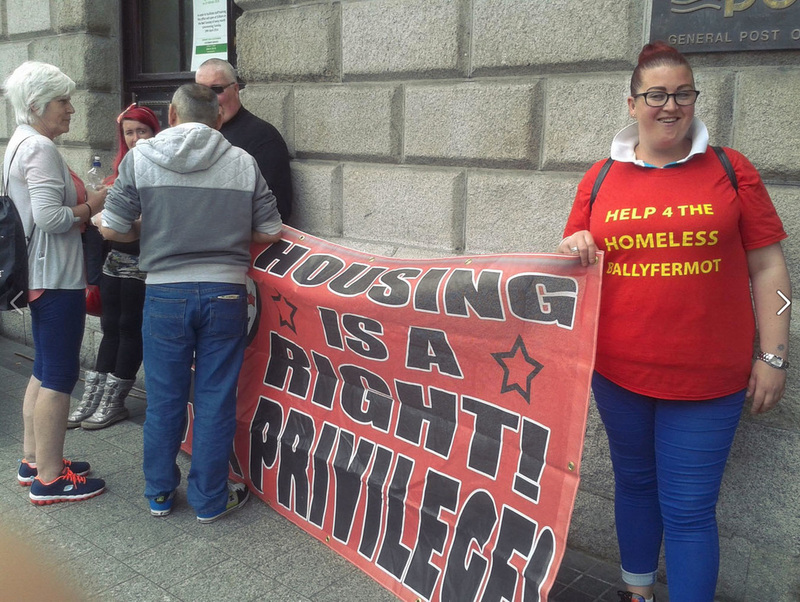 Tomorrow will be day 12 of Raymond Farrell's occupation of the homeless services provided apartment in Catherine's Gate on Parnell Road. 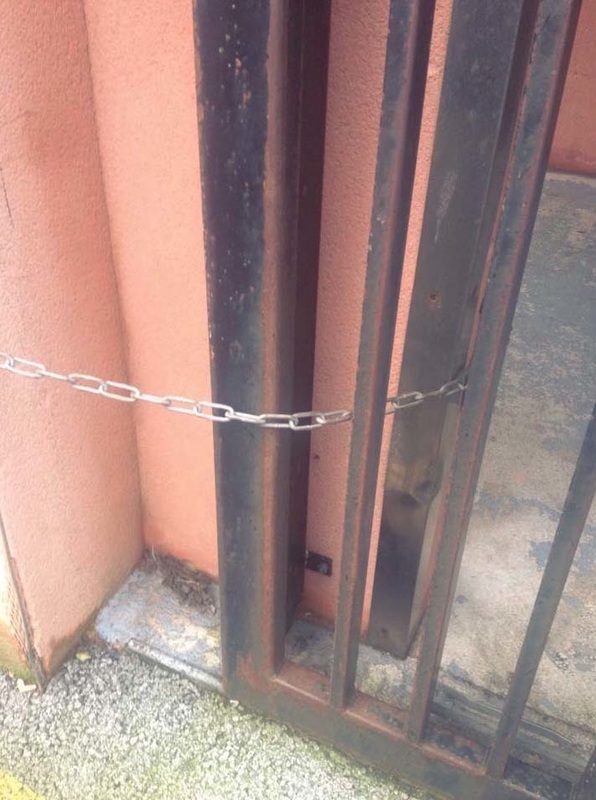 The Chains Maybe Back On At Catherine's Gate But We Won't Be Shackled. 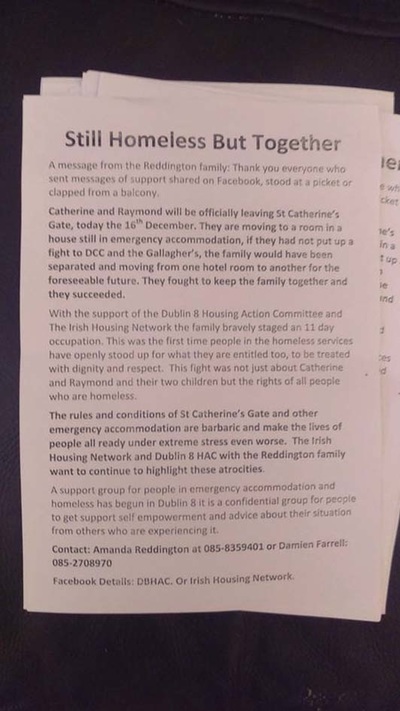 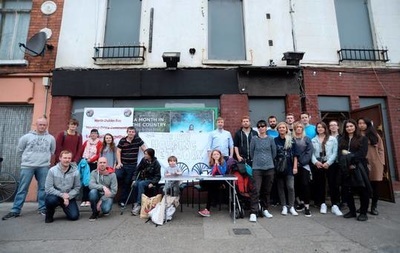 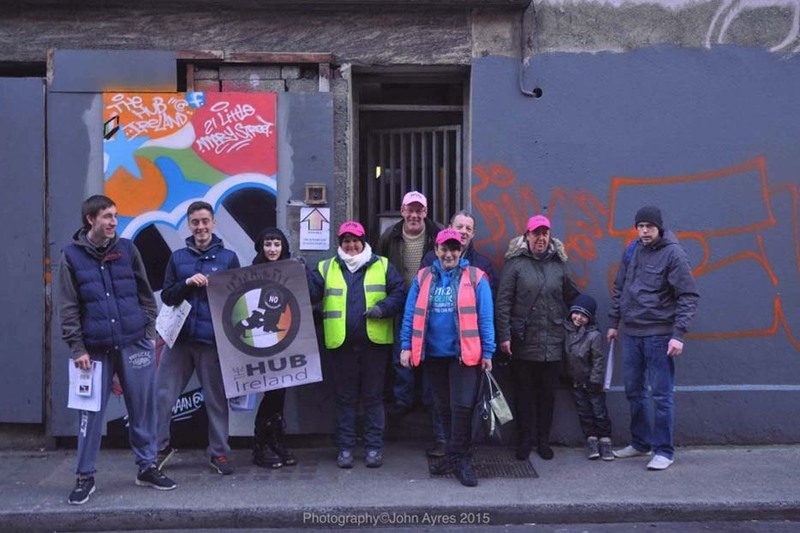 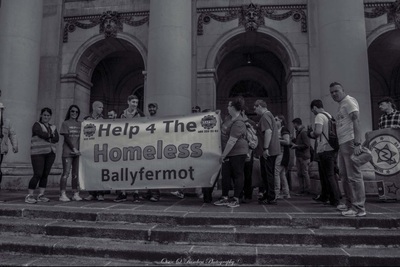 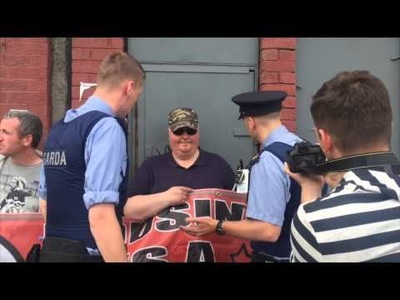 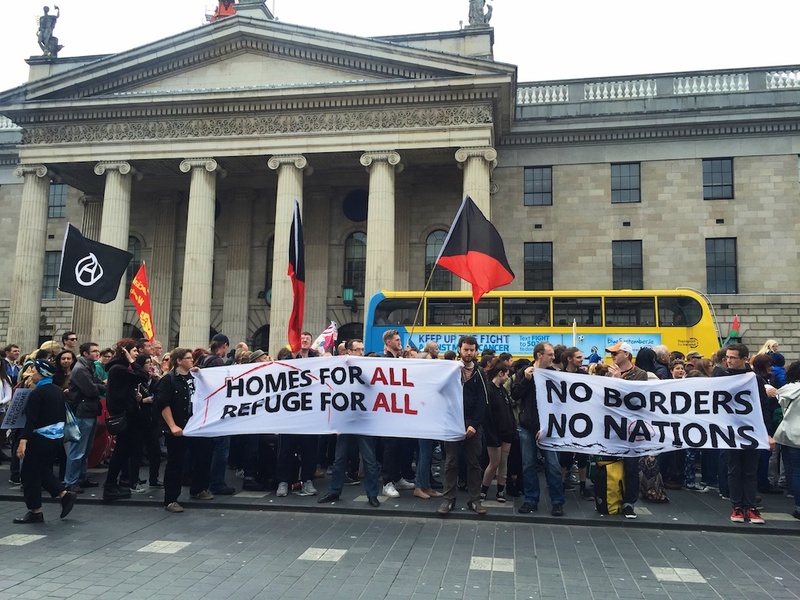 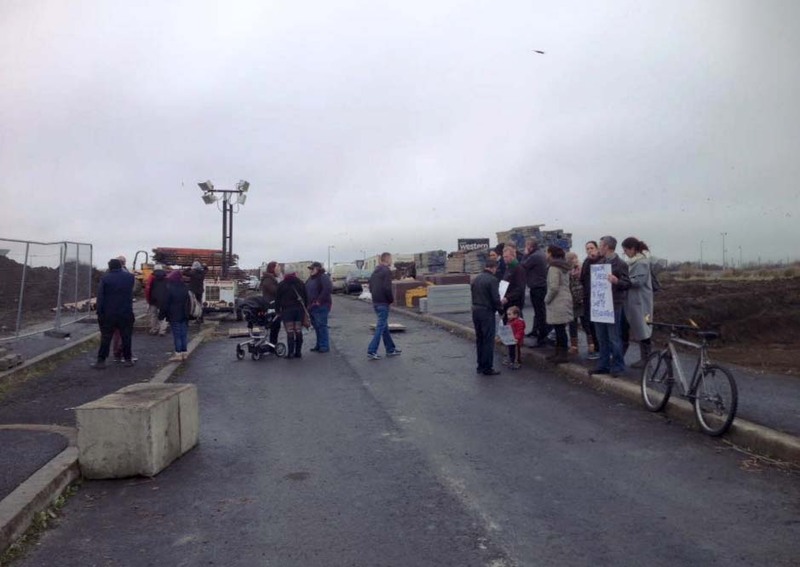 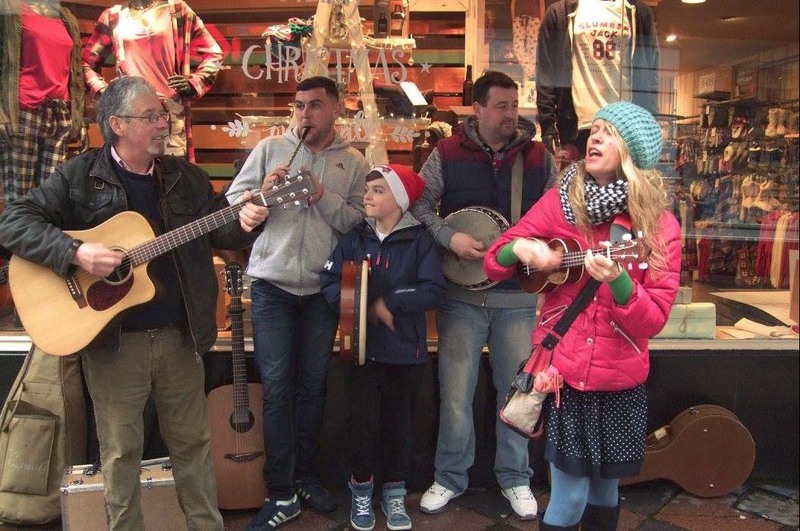 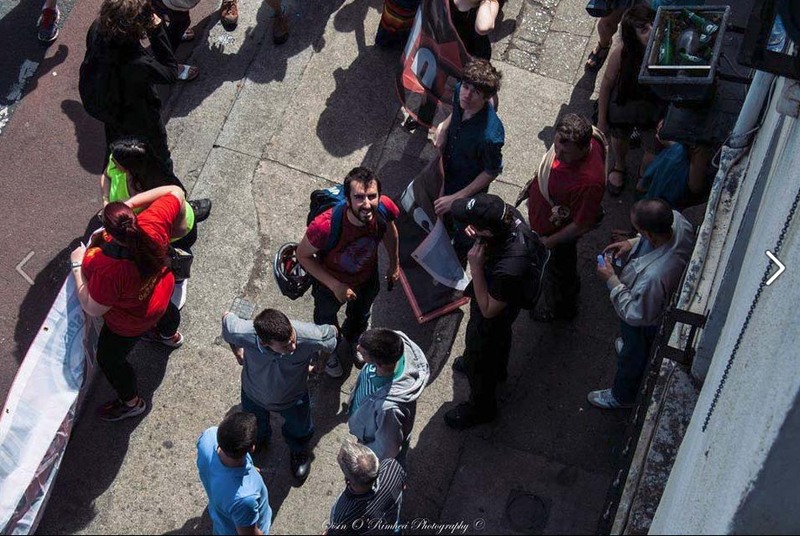 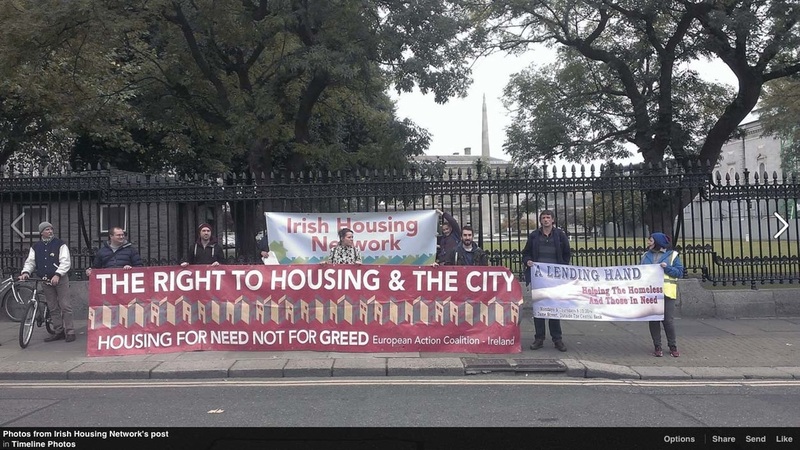 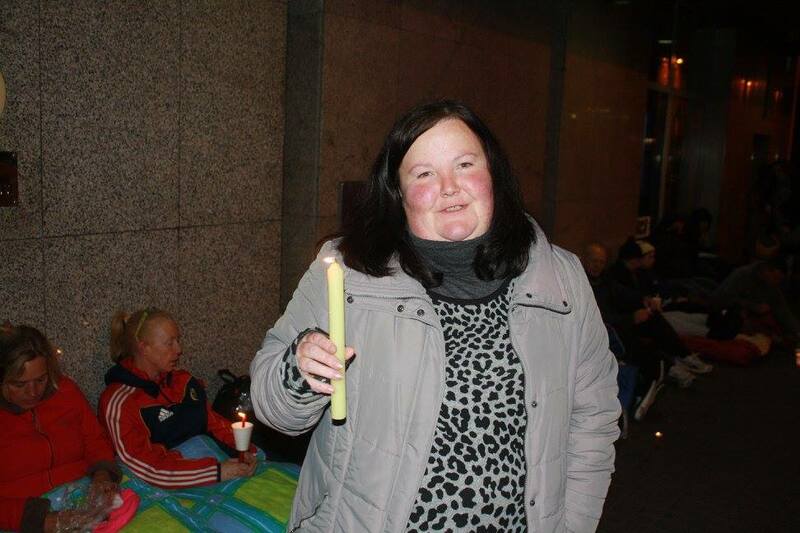 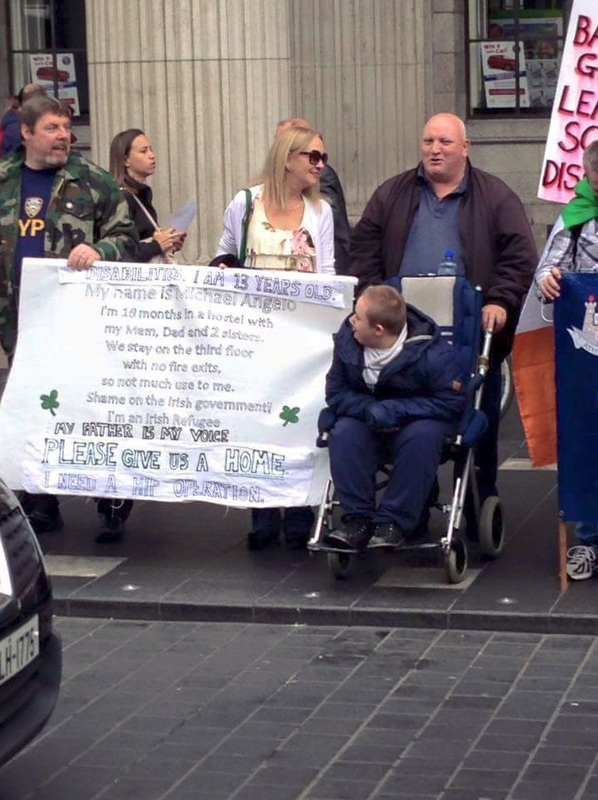 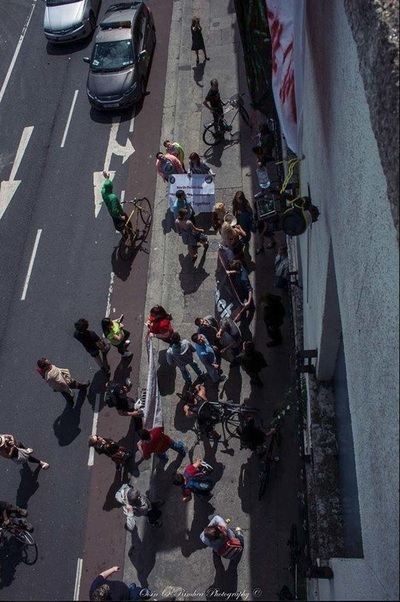 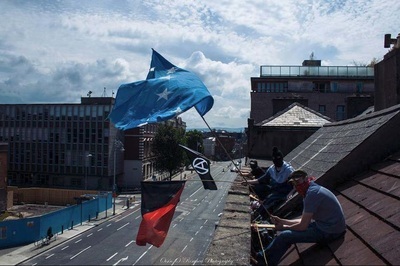 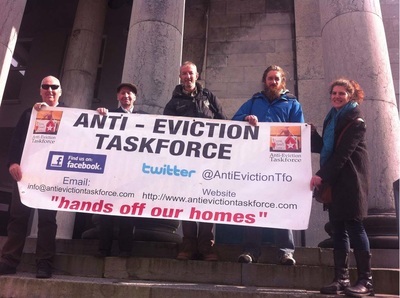 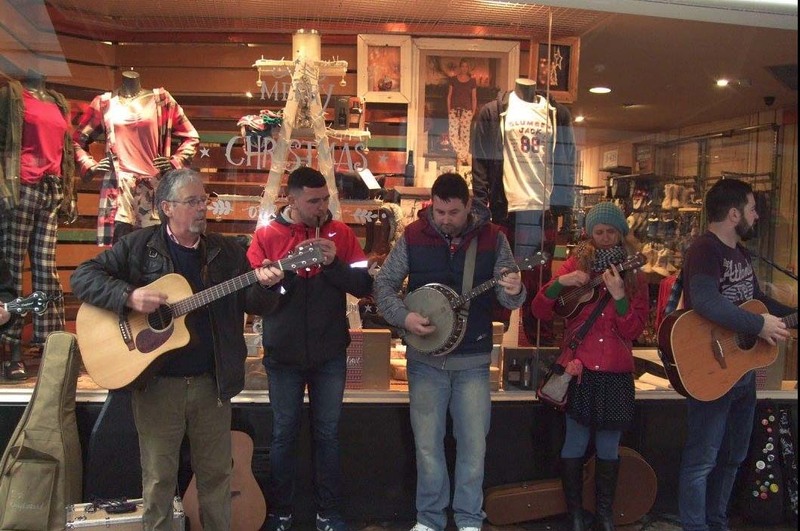 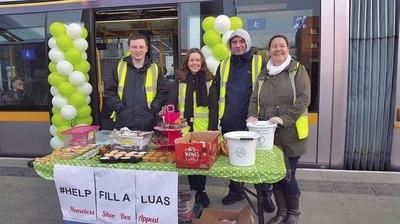 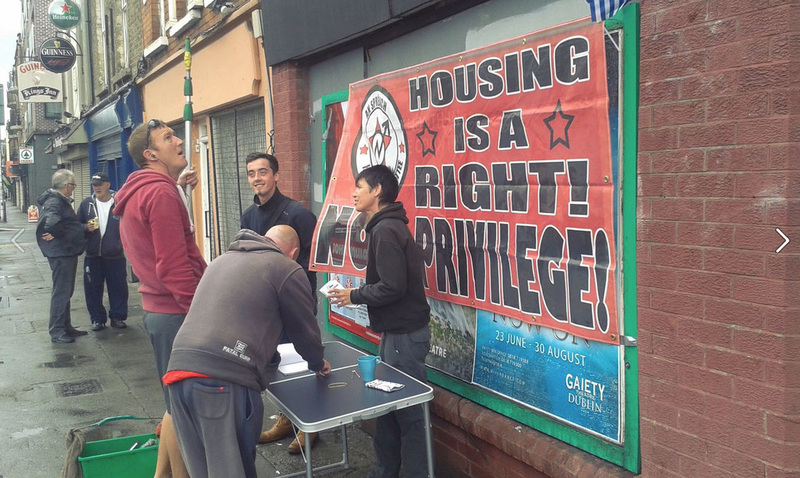 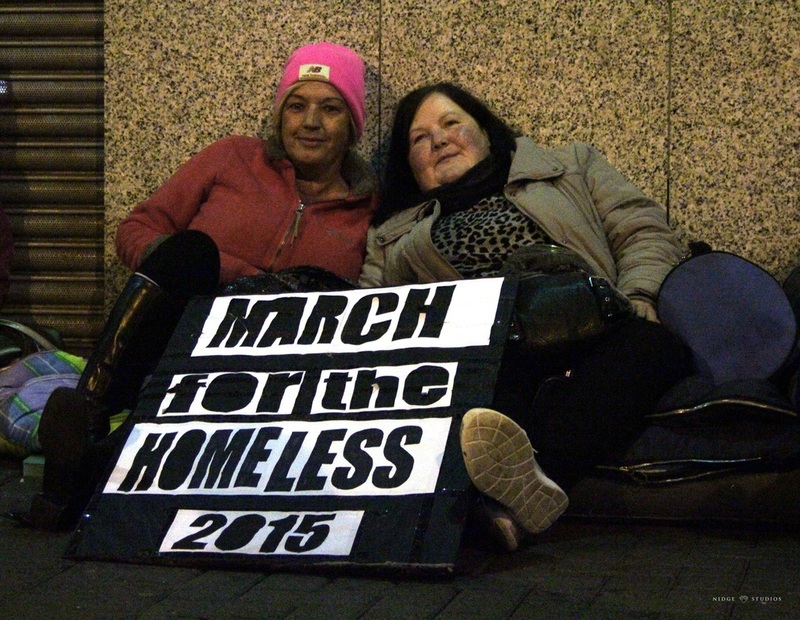 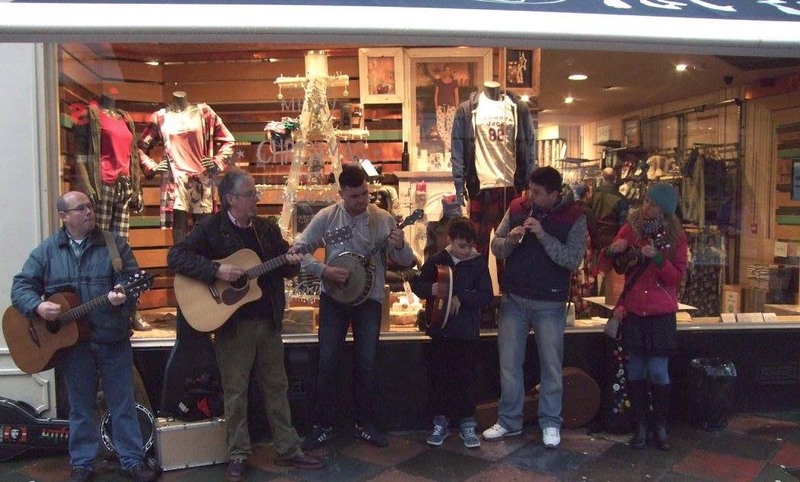 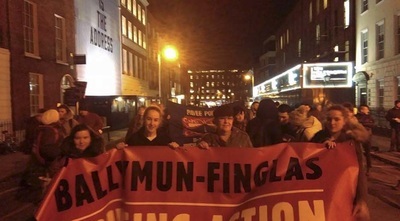 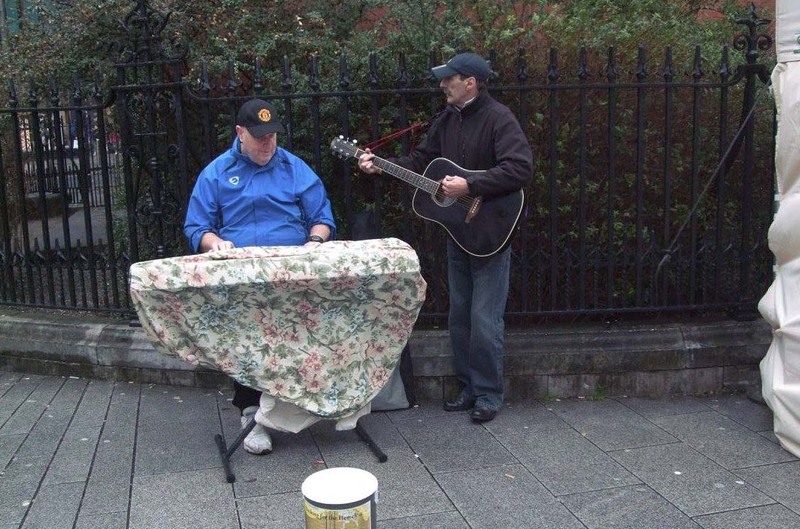 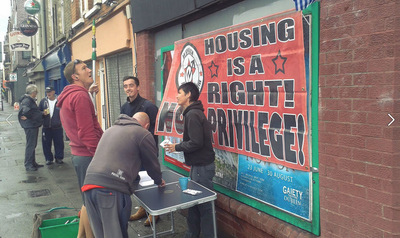 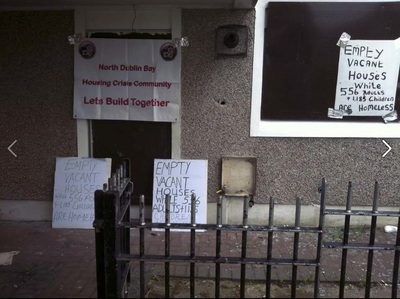 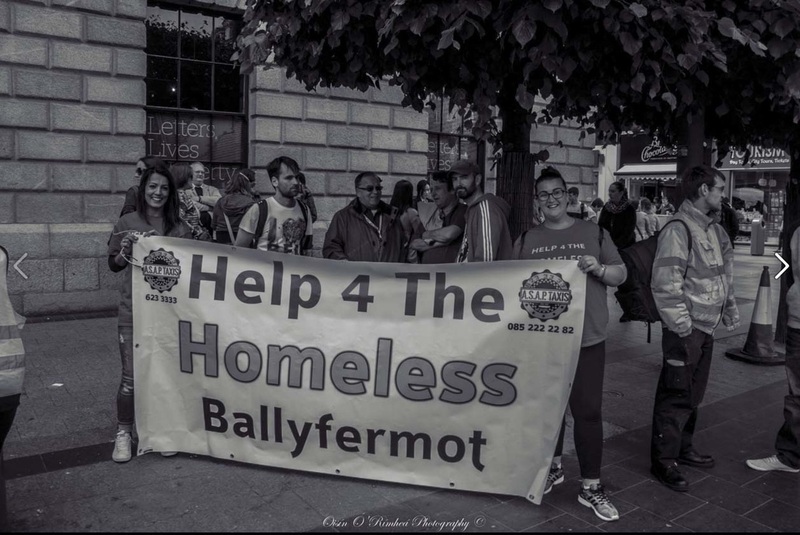 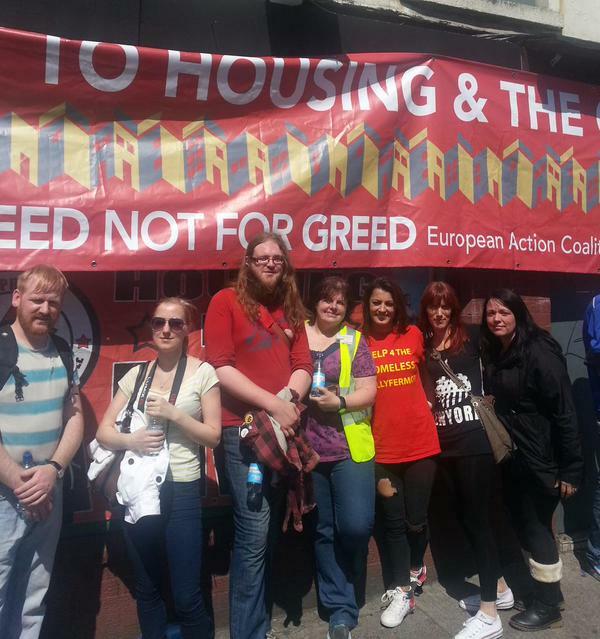 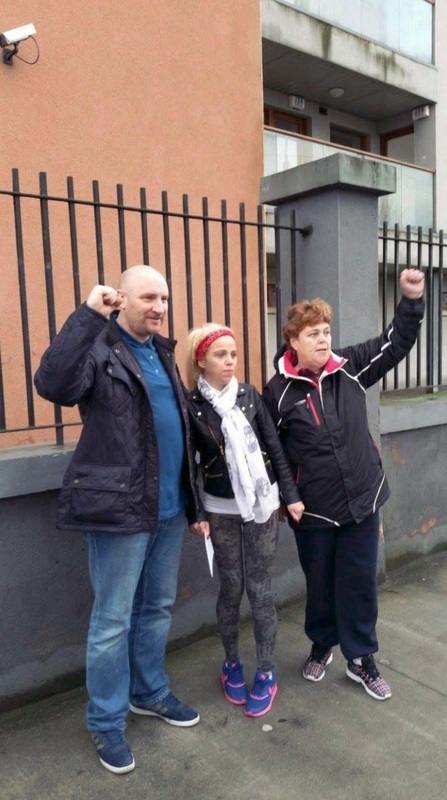 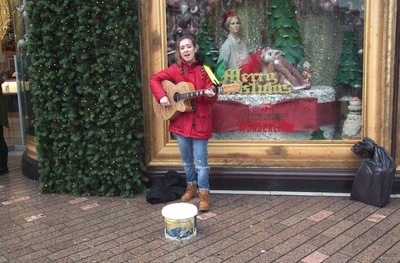 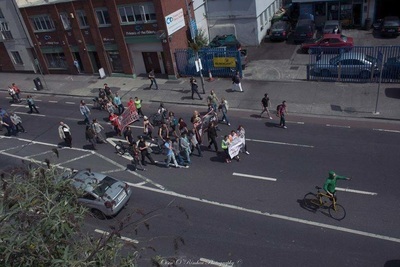 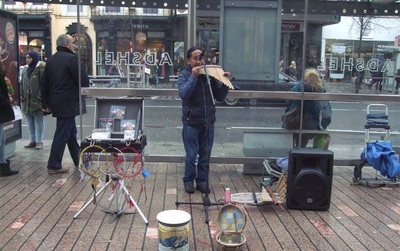 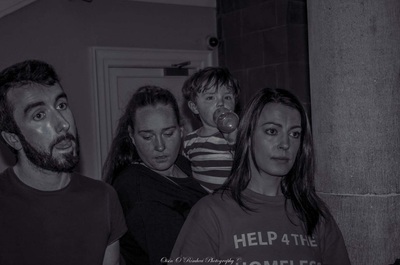 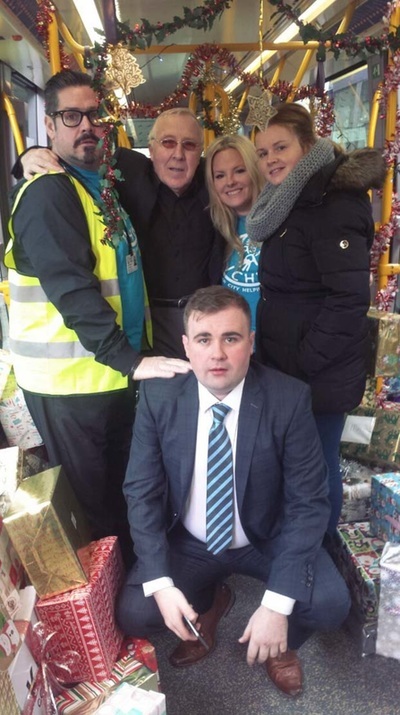 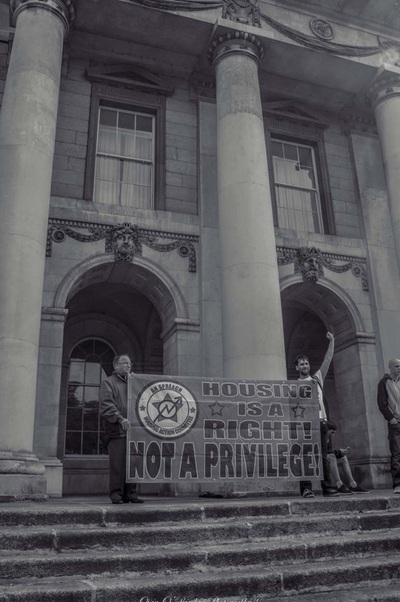 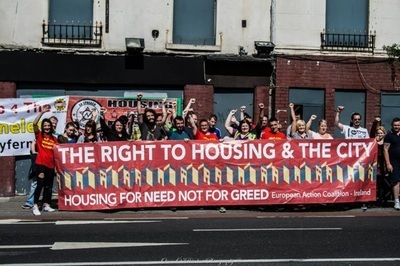 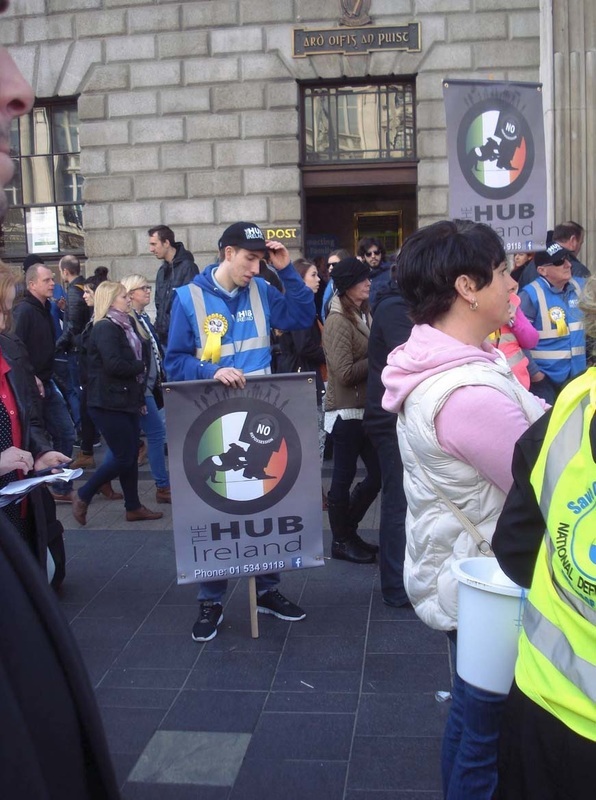 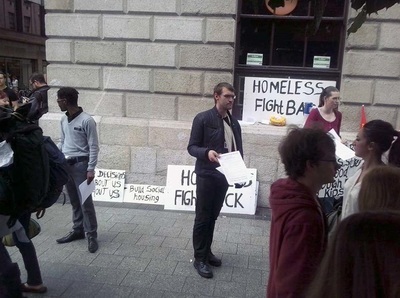 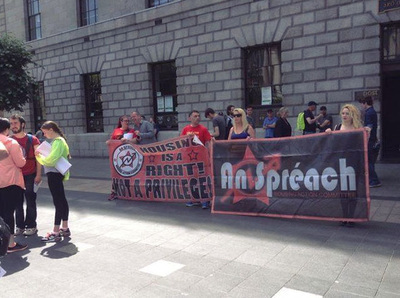 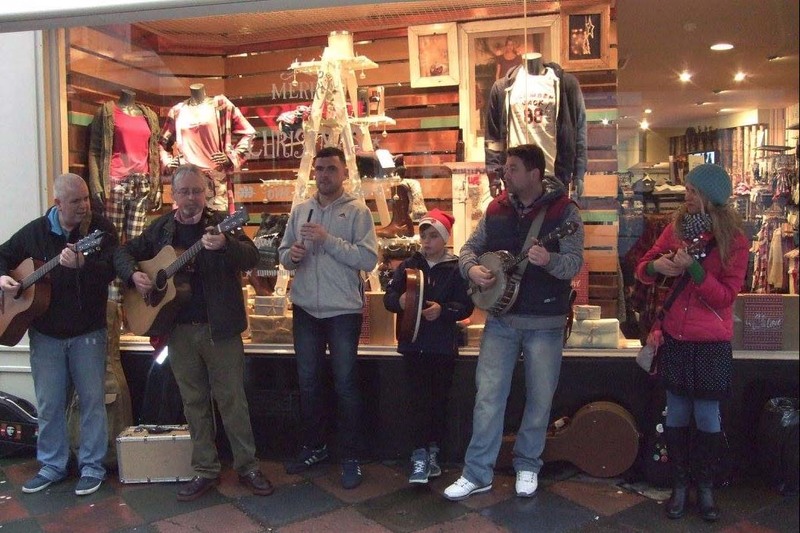 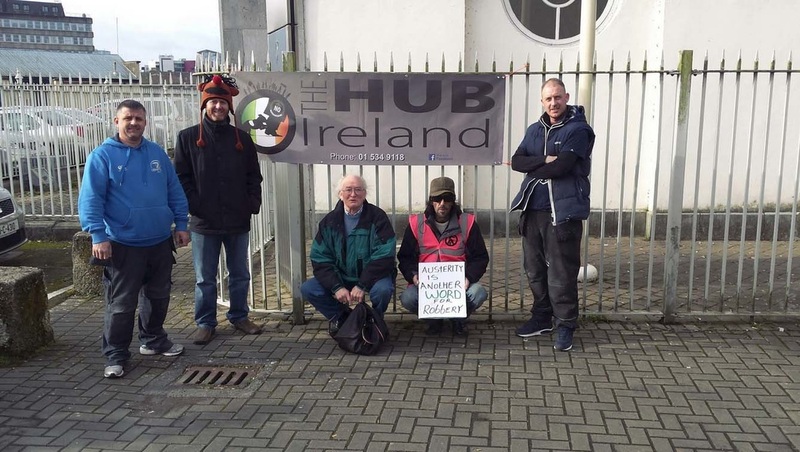 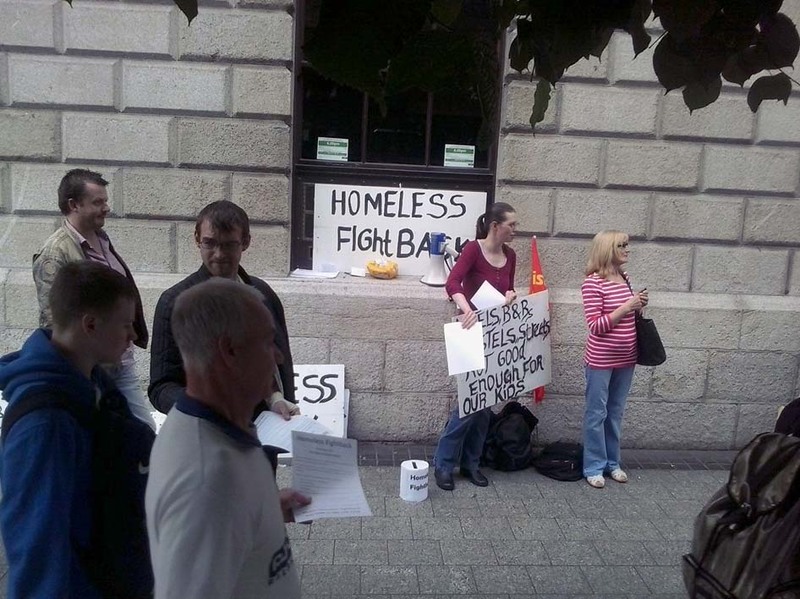 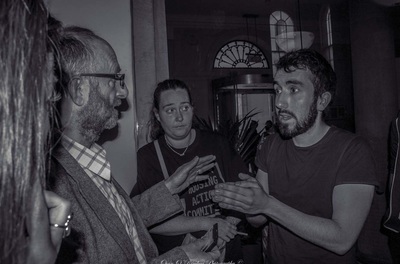 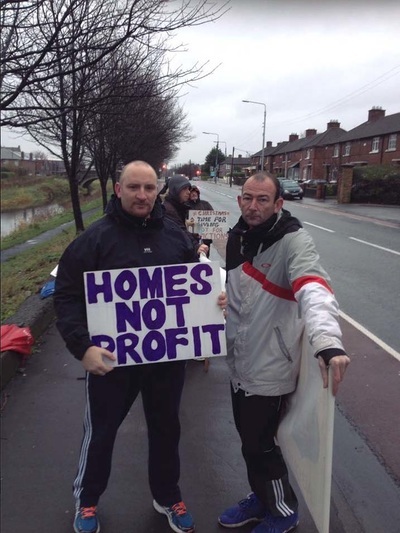 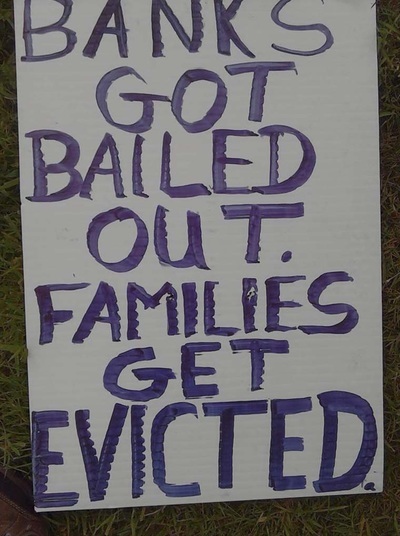 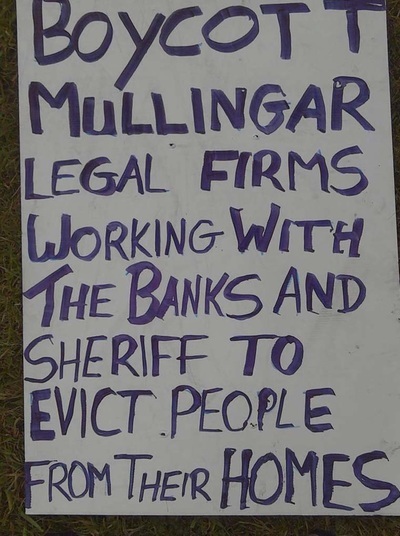 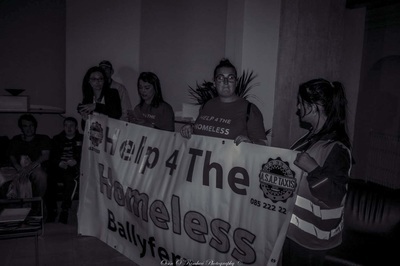 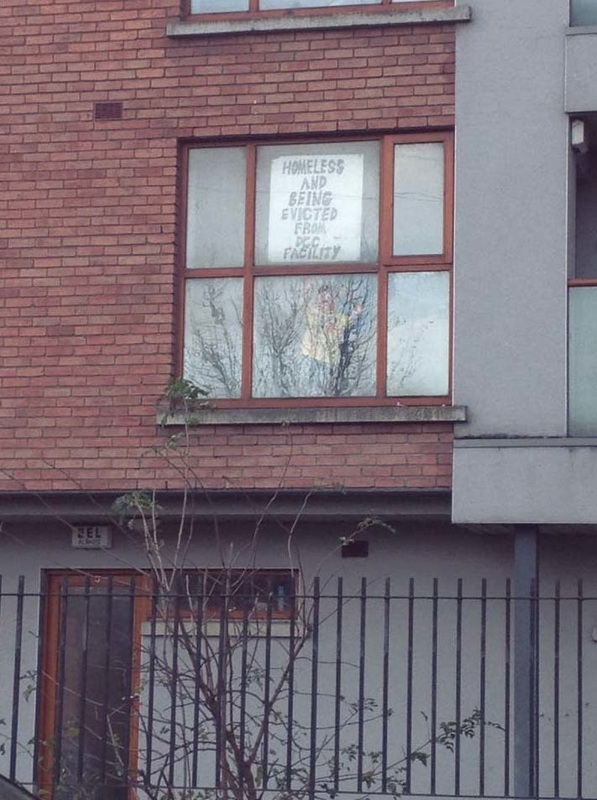 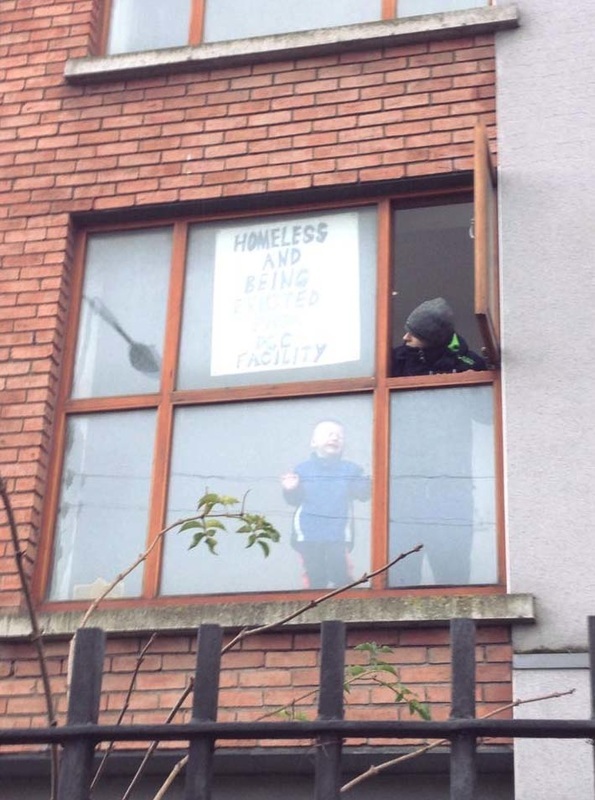 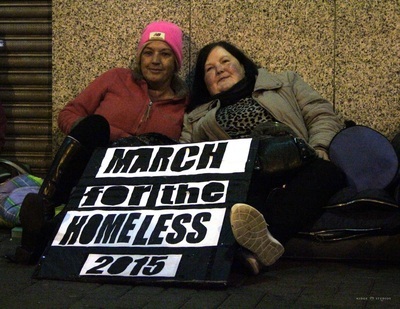 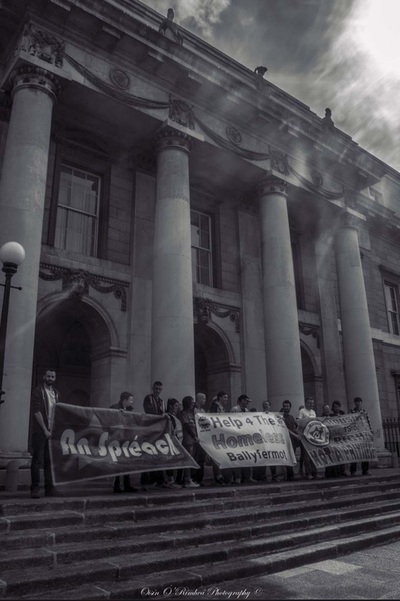 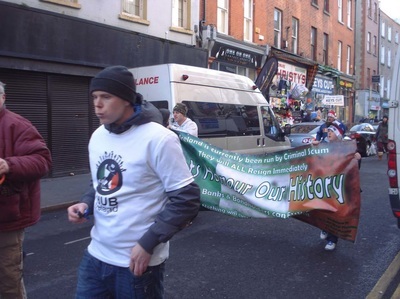 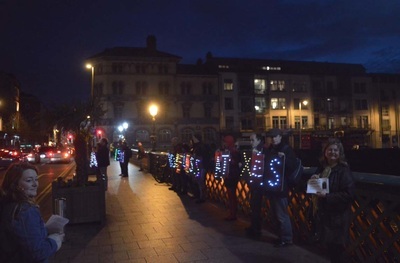 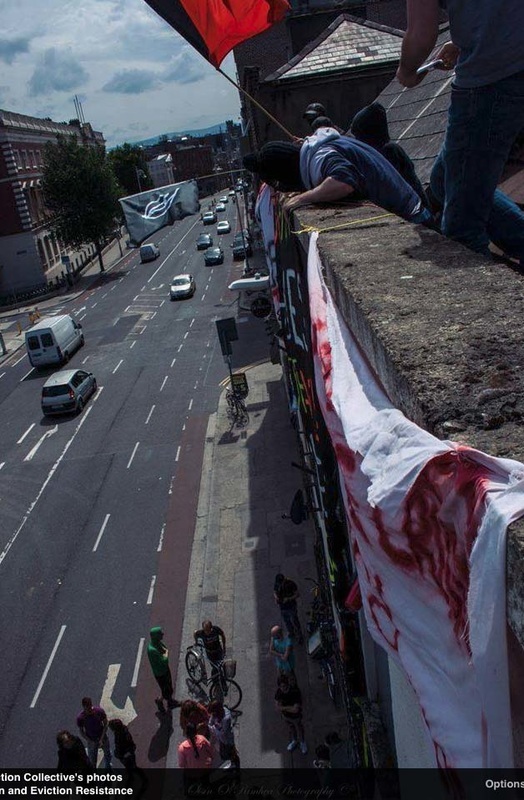 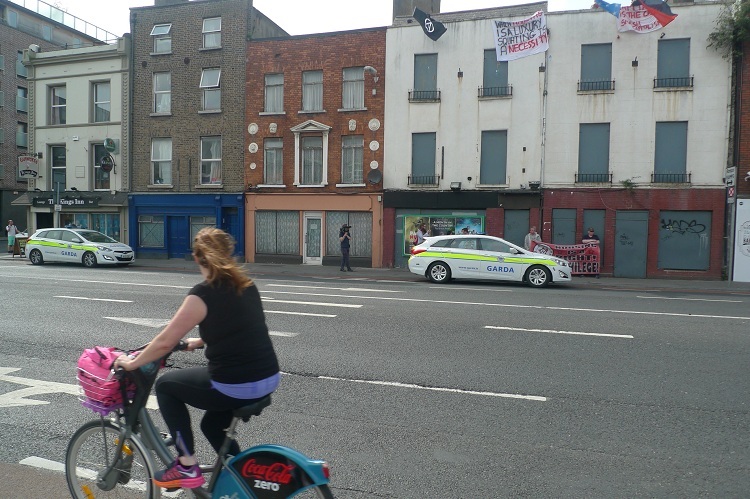 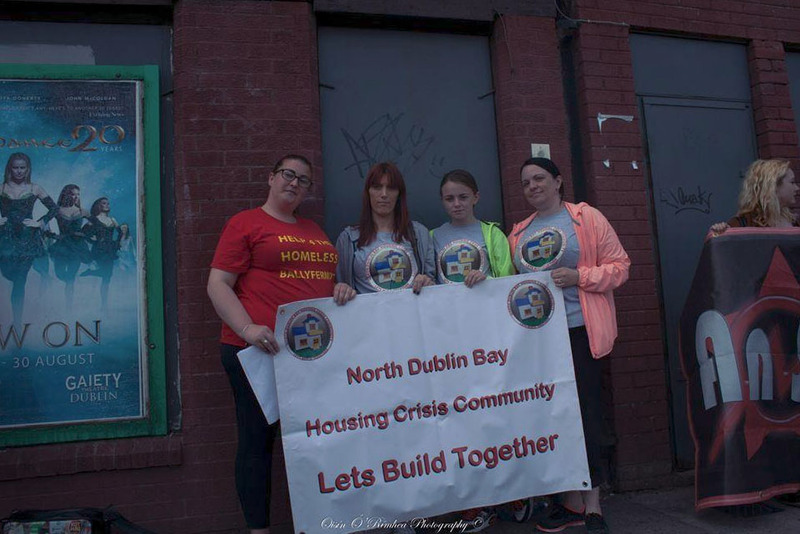 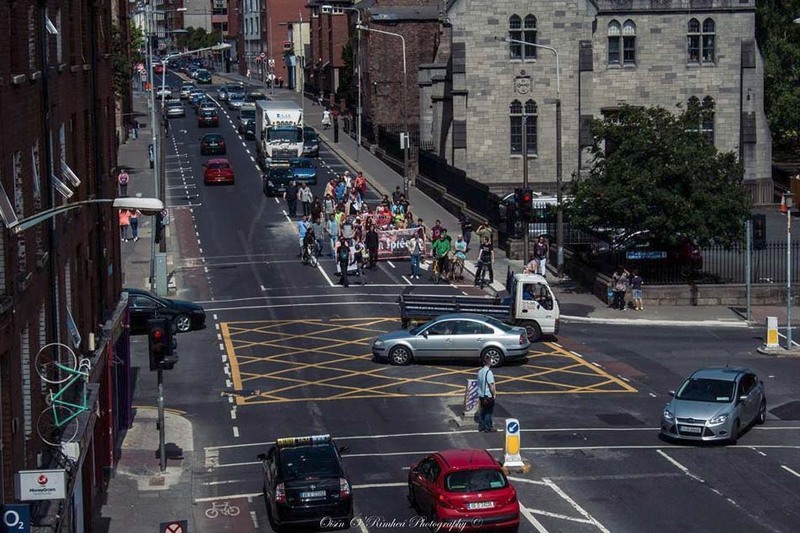 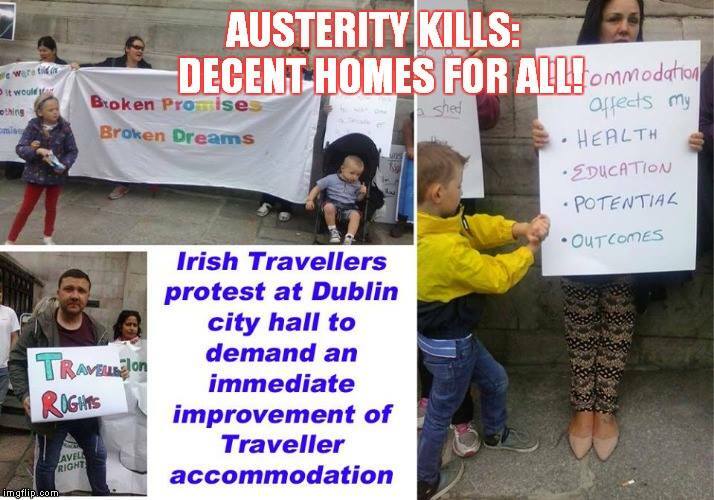 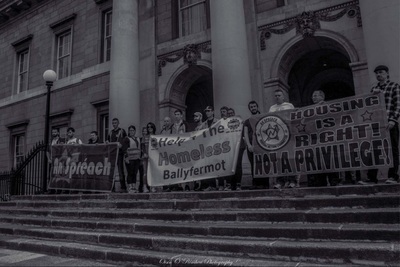 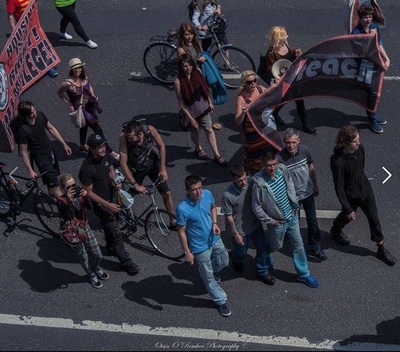 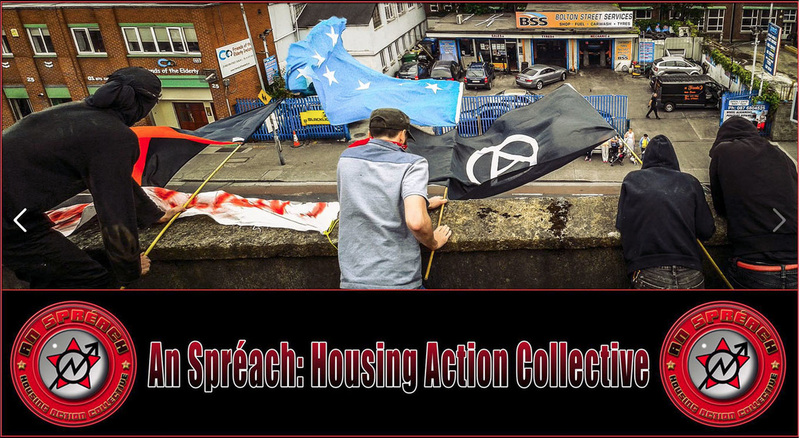 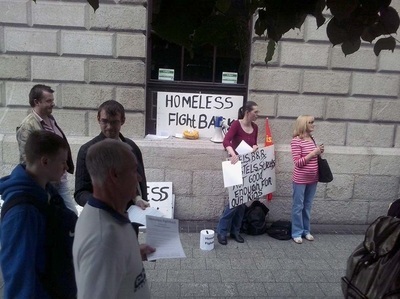 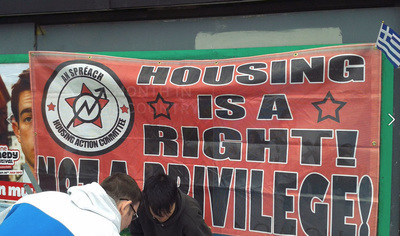 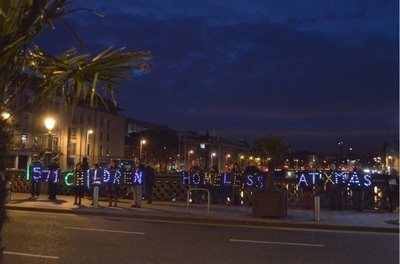 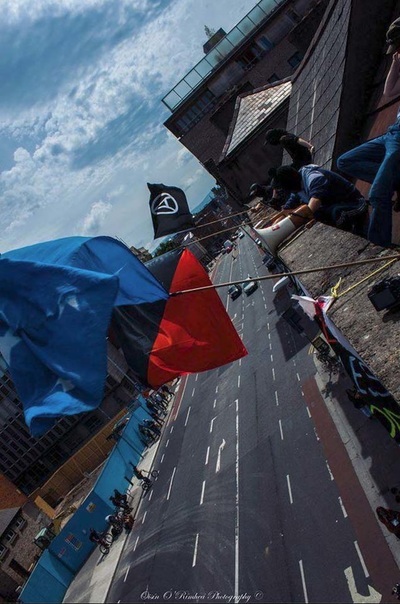 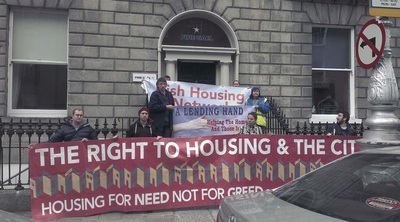 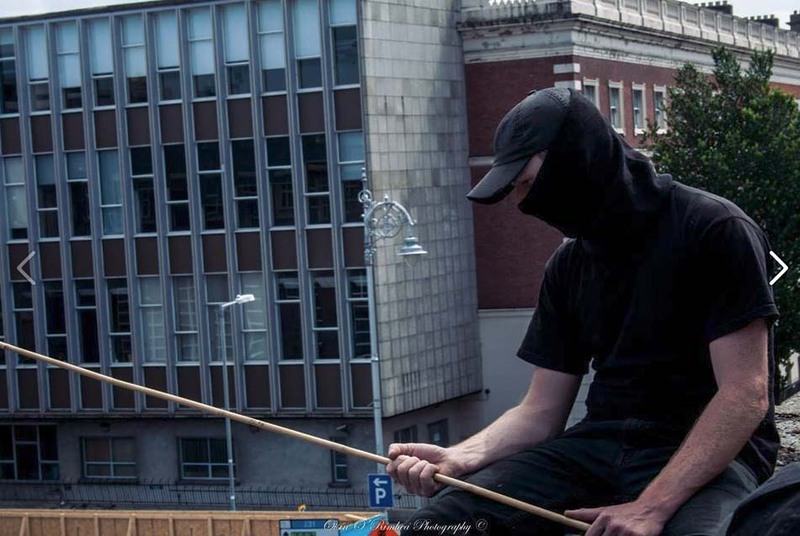 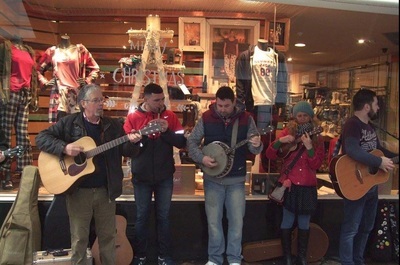 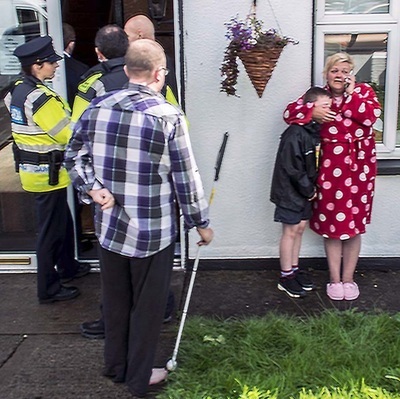 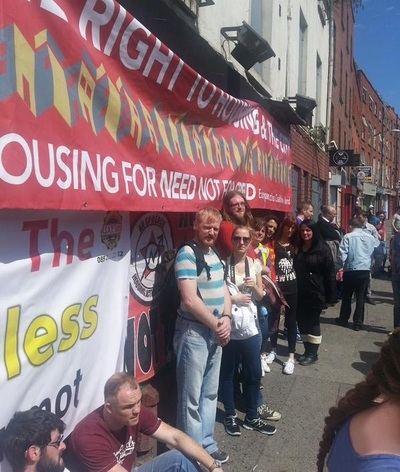 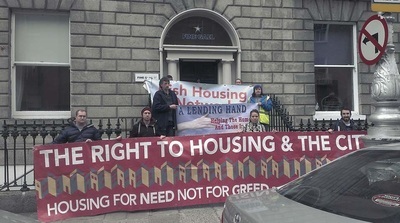 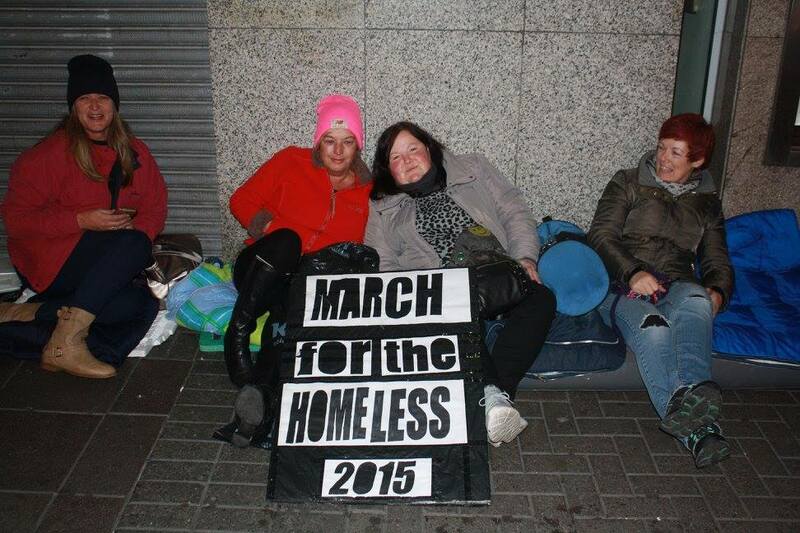 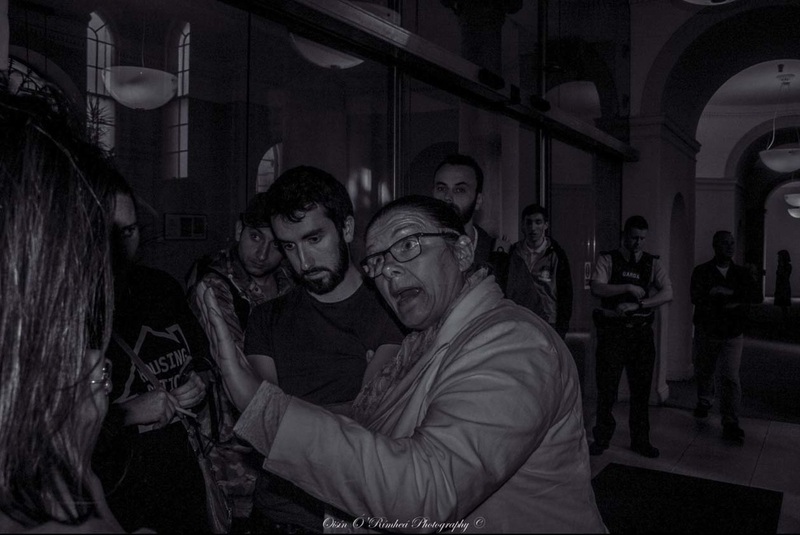 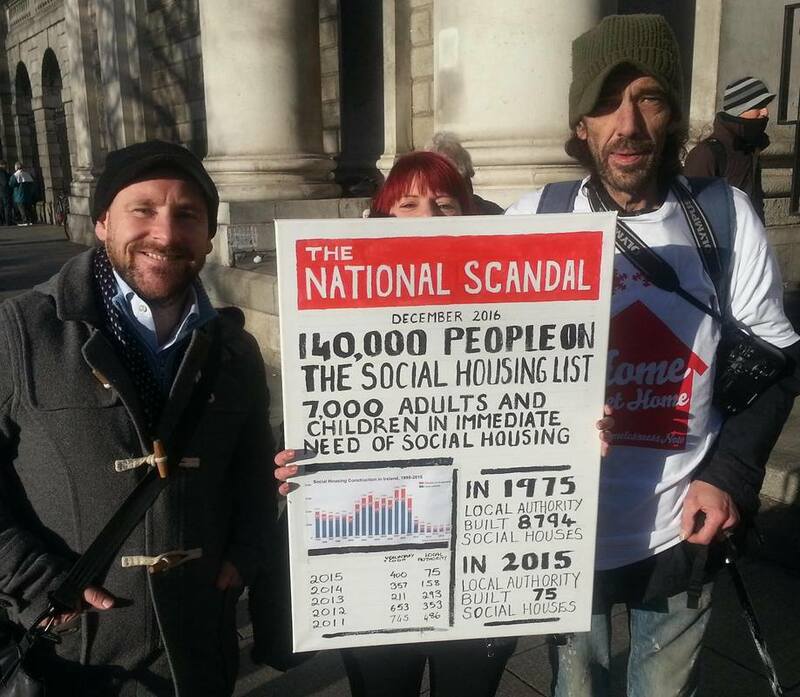 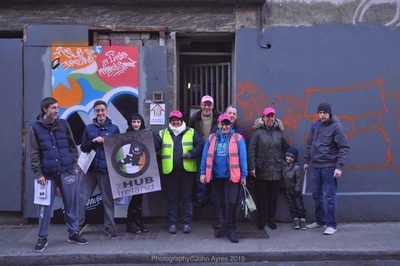 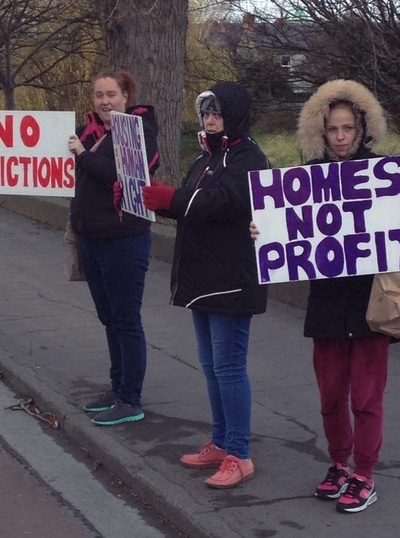 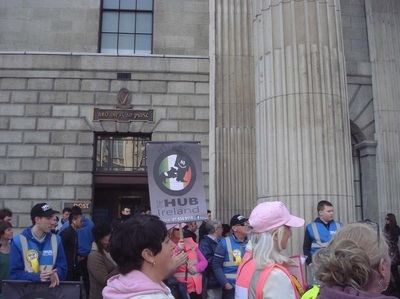 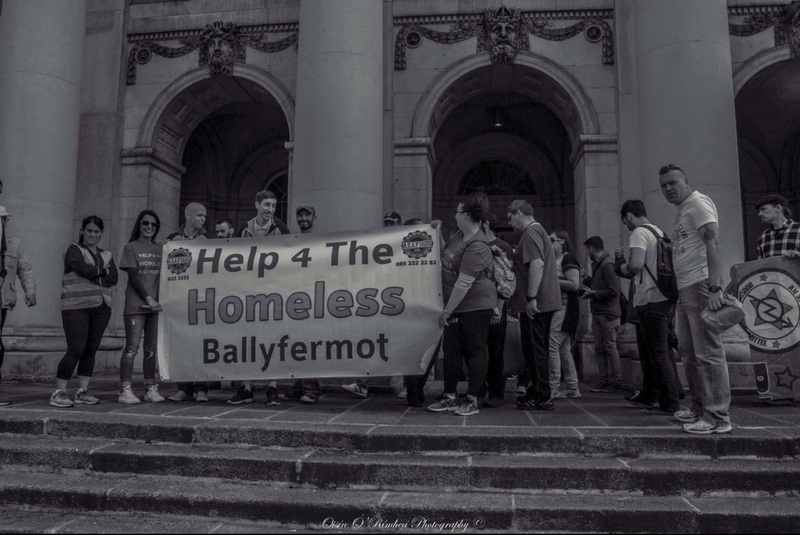 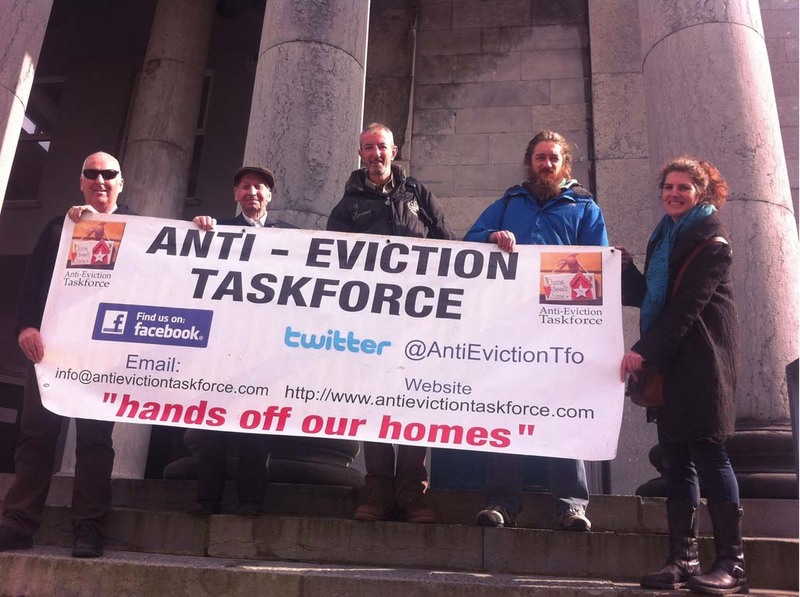 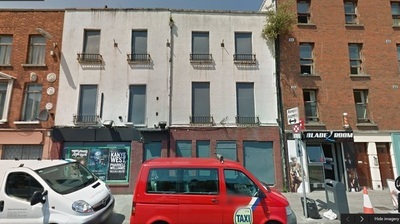 As the Reddington/Farrell family prepare to meet with Dublin City Council tomorrow in a refreshed hope to obtain a resolution,the family support group have decided to continue with the peaceful vigils on Parnell Road to show solidarity with Raymond who is still in the apartment under risk of forced eviction by the private management company. 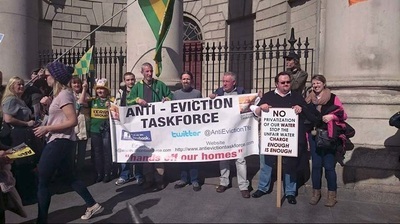 We are now into week two of the anti eviction protest. 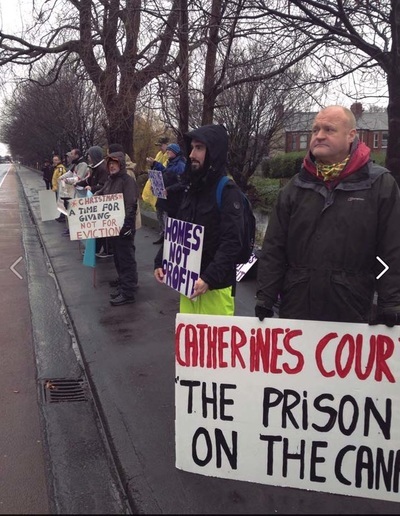 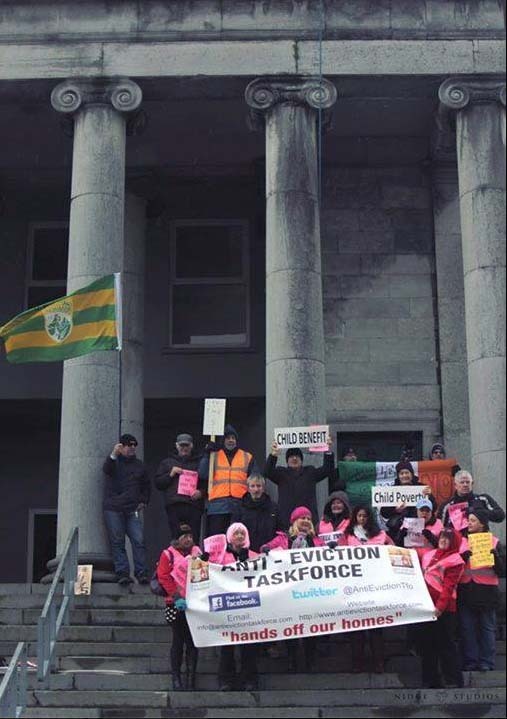 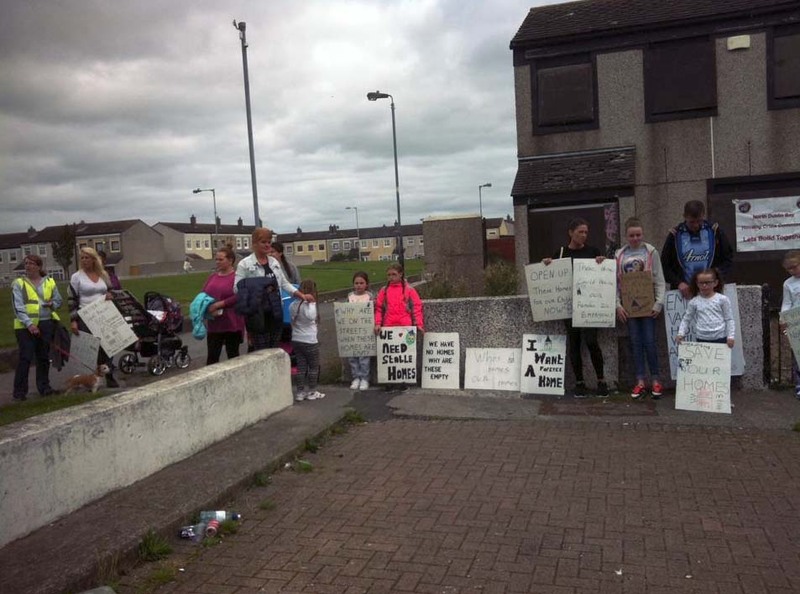 Despite heavy rain and cold temperatures almost twenty people turned out to support the Reddington Family who are opposing the summary eviction of daughter Catherine,her partner Raymond and their two infant children one week ago today. 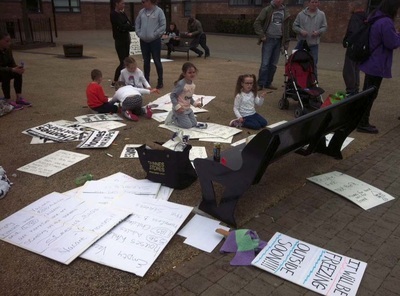 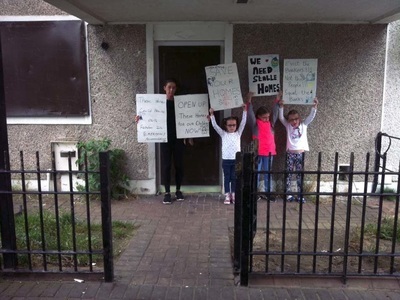 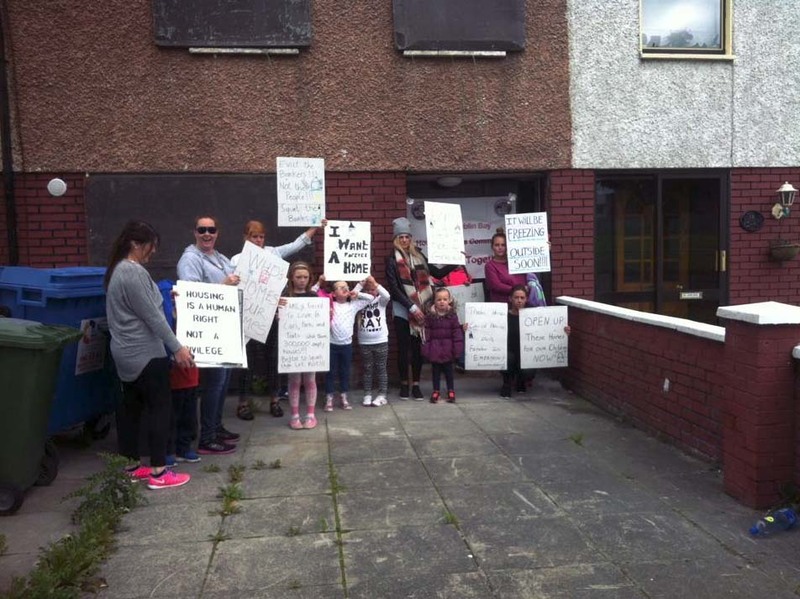 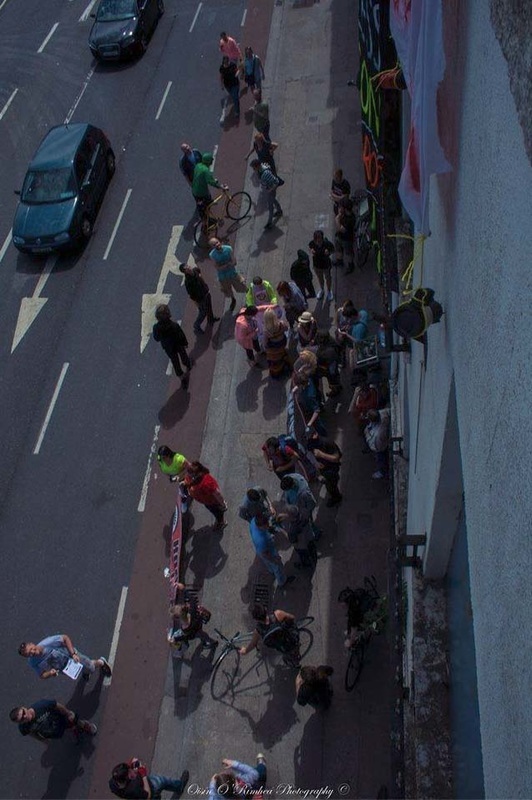 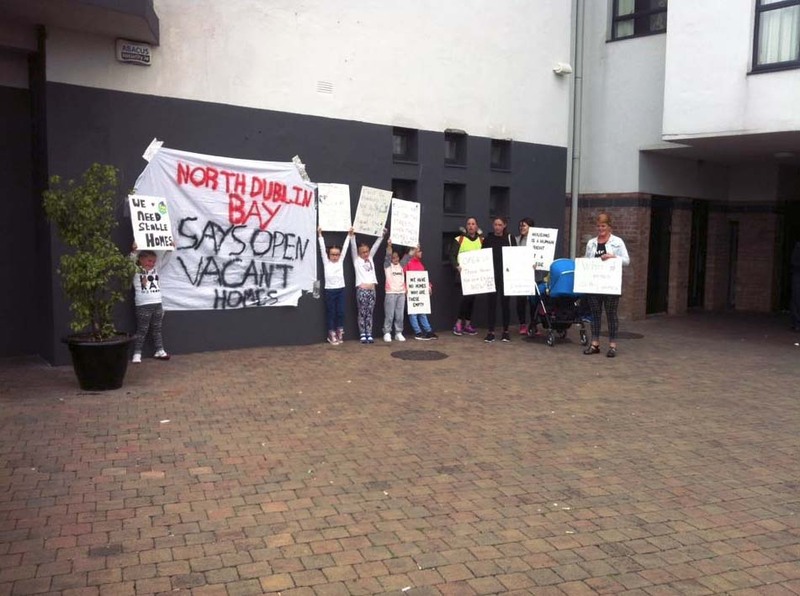 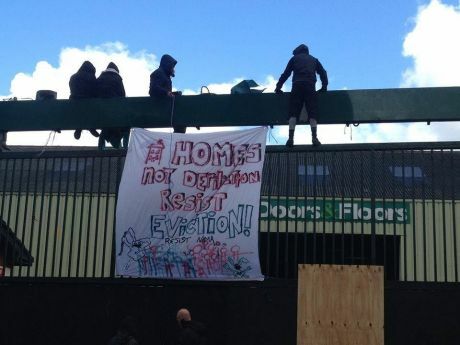 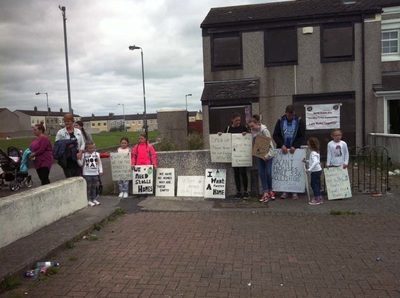 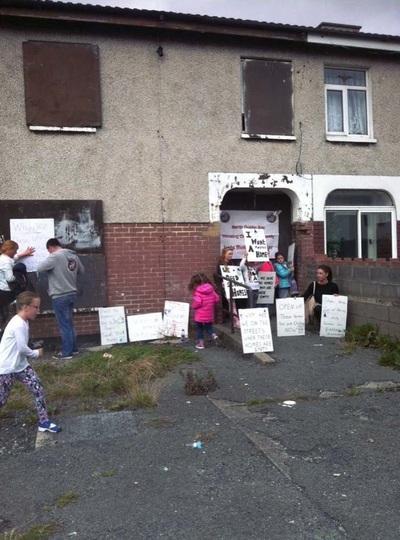 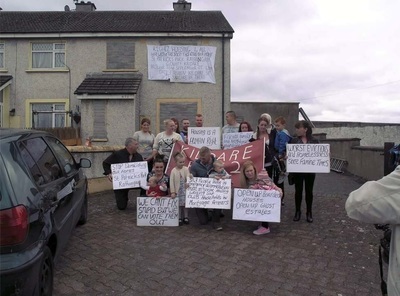 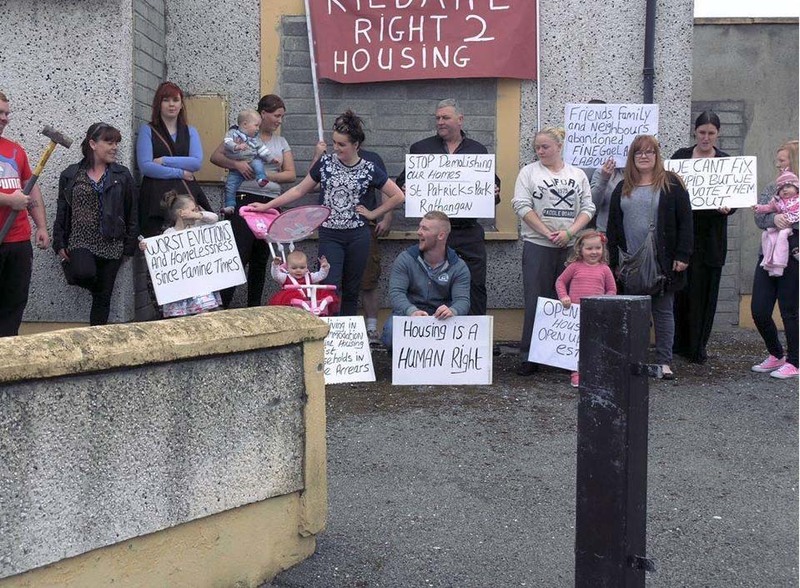 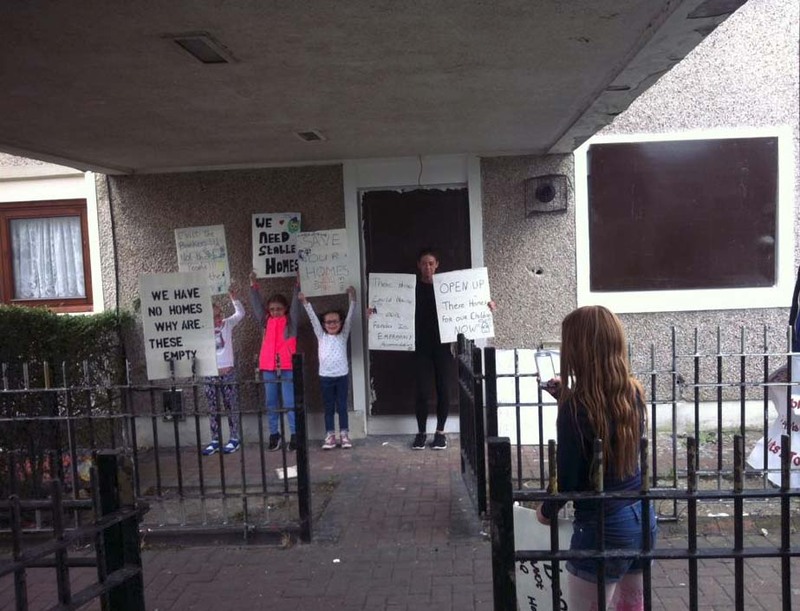 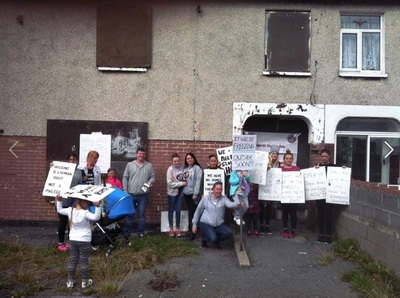 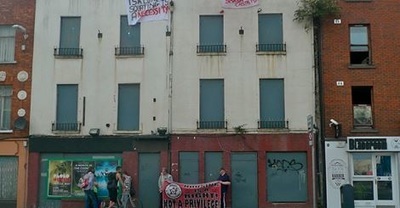 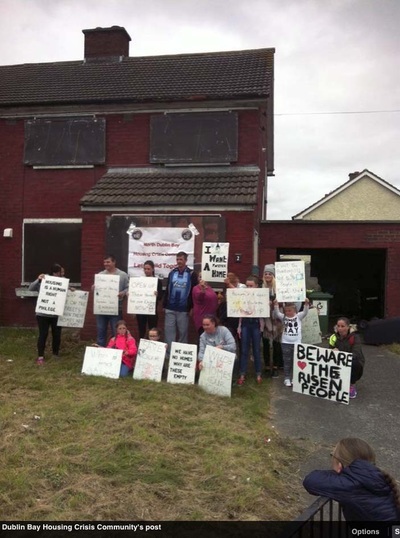 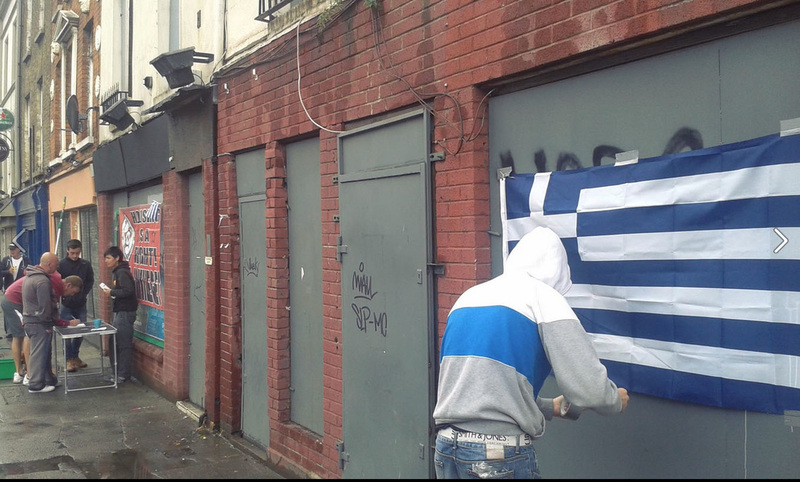 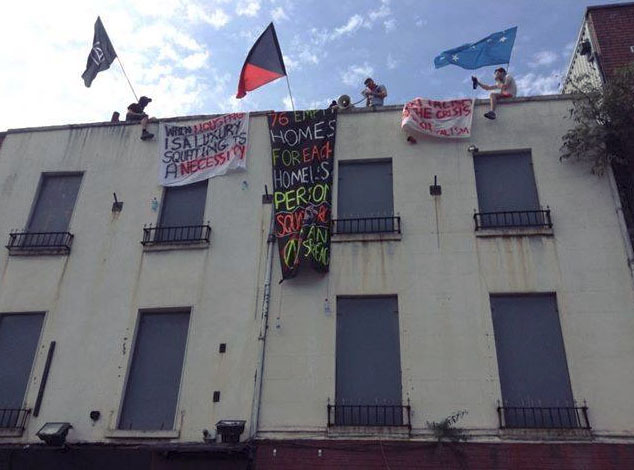 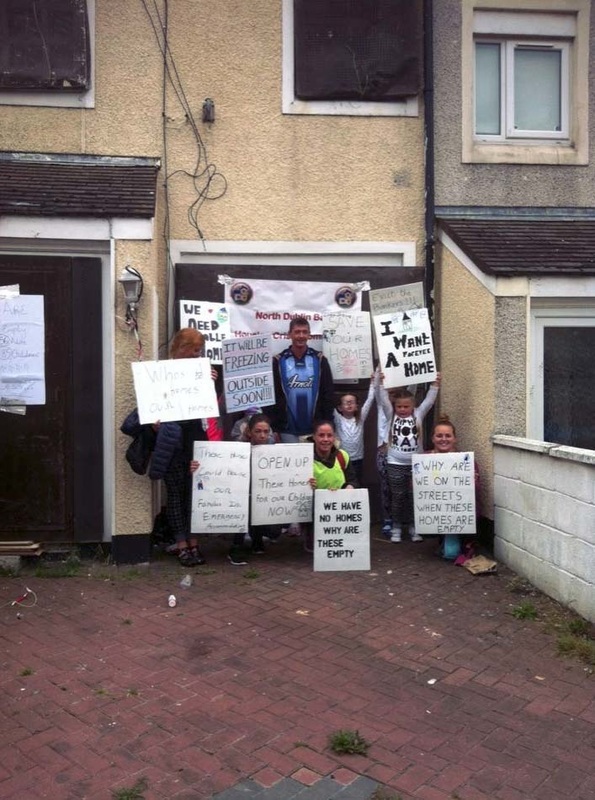 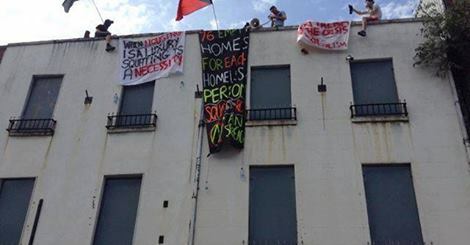 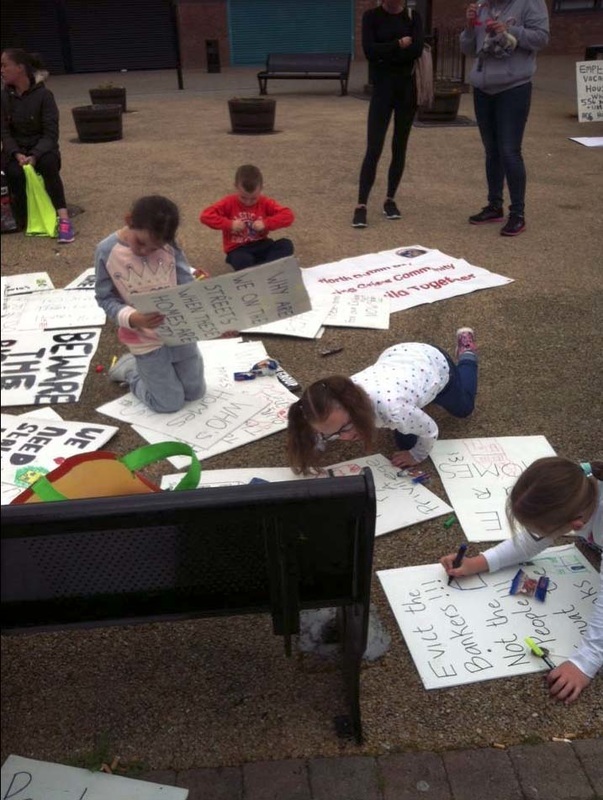 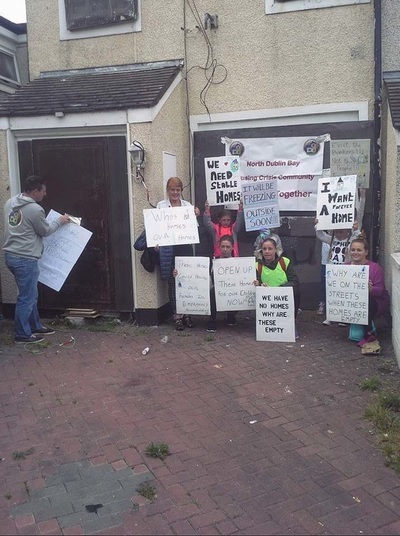 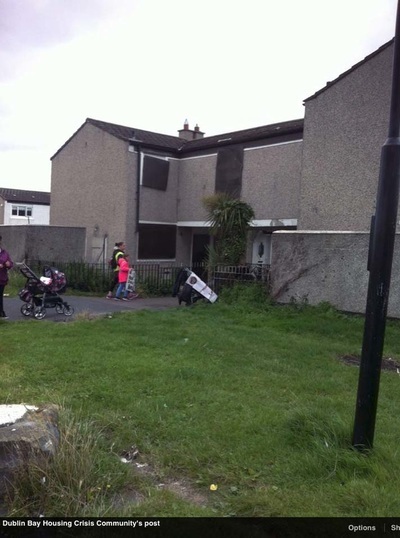 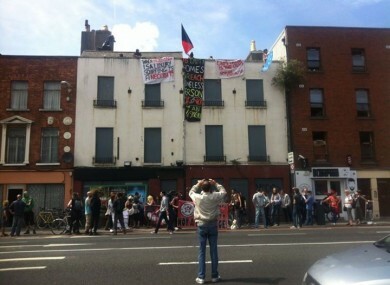 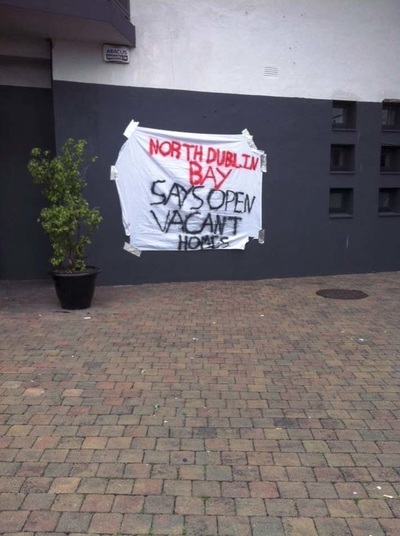 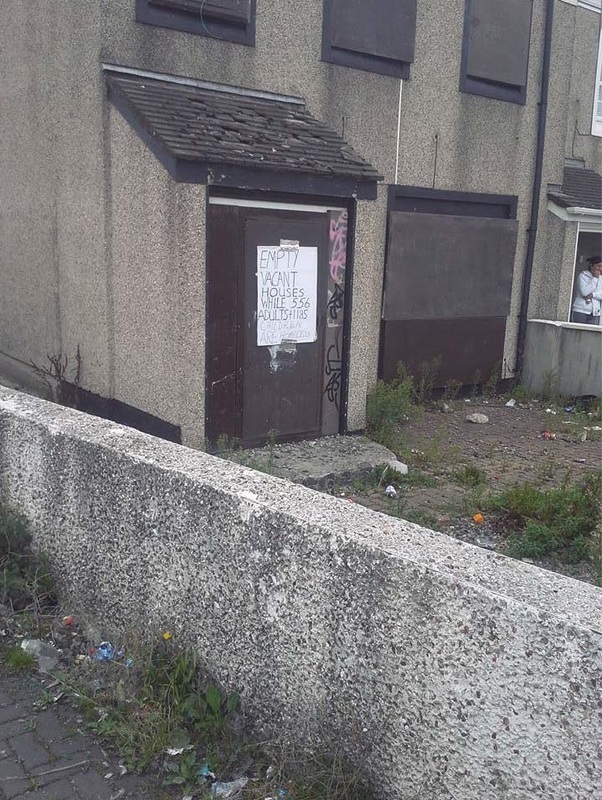 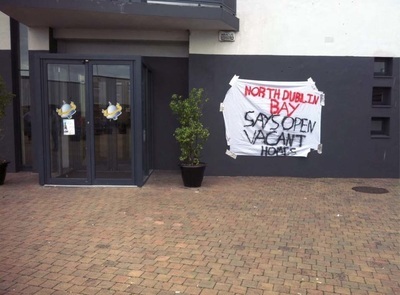 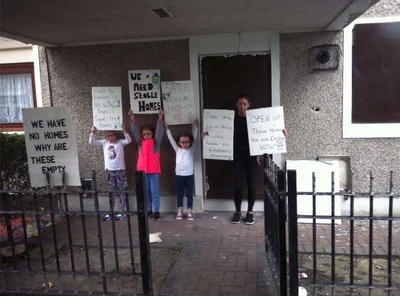 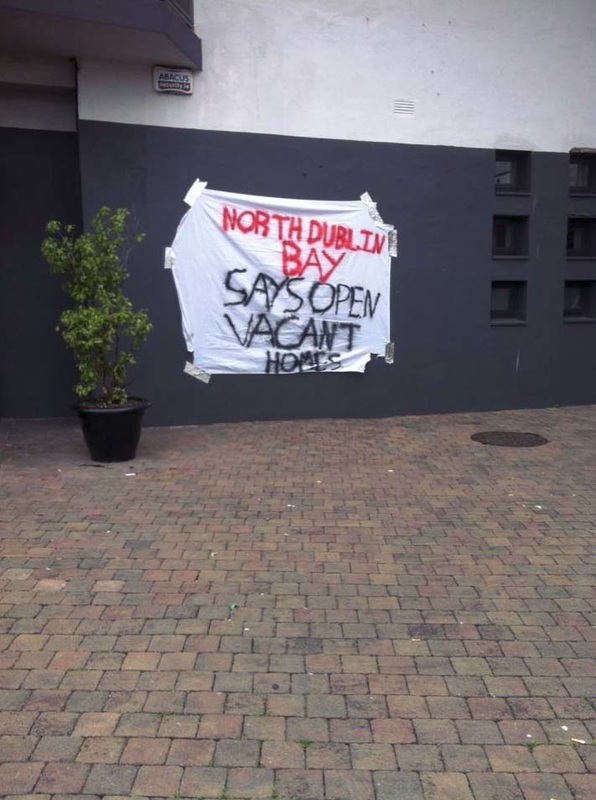 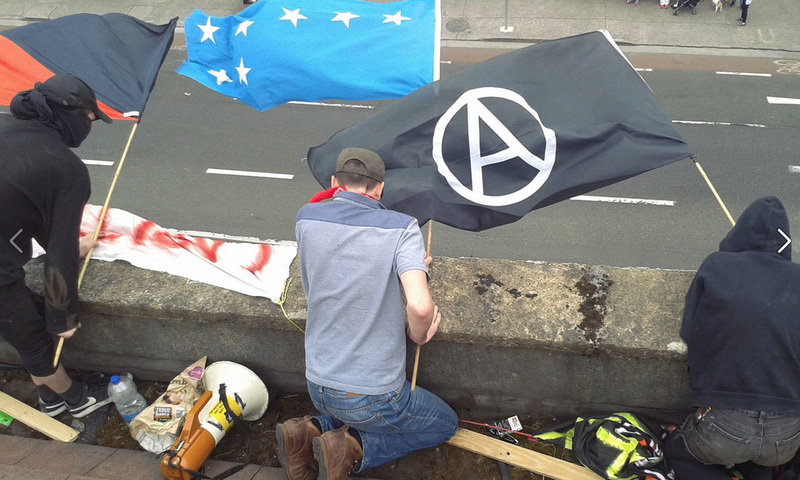 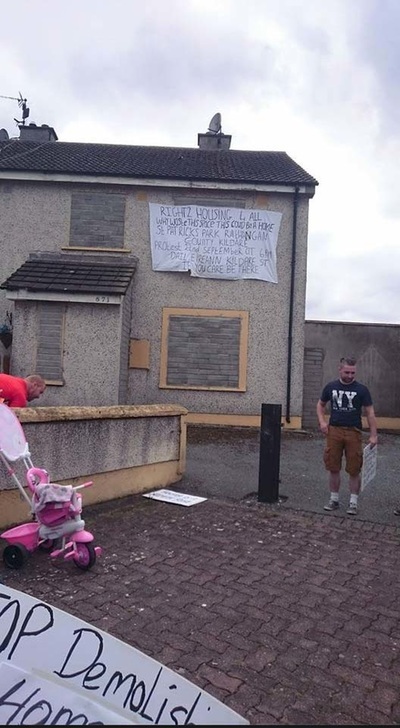 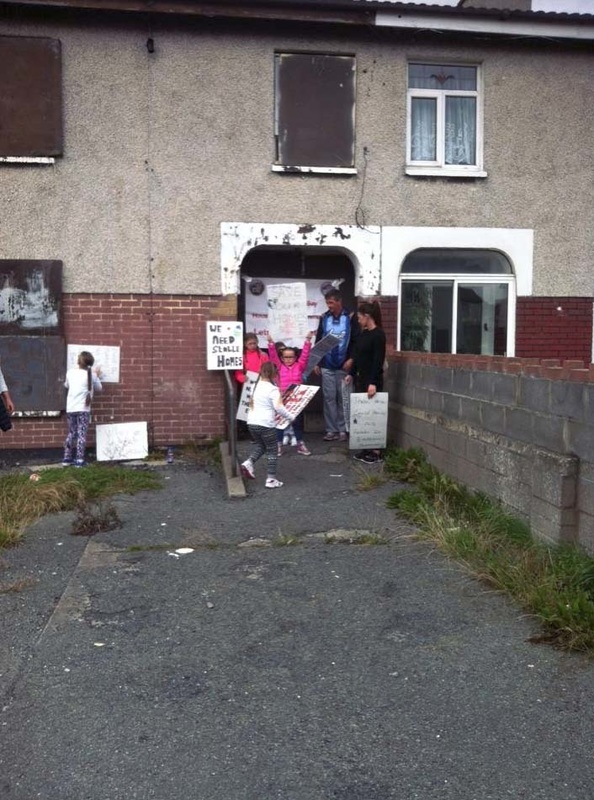 Following the eviction of Catherine Reddington,her partner and two young children on Saturday over a dispute with management over emergency gas supply to their apartment an ongoing protest is continuing at the site. 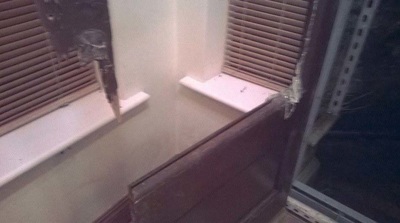 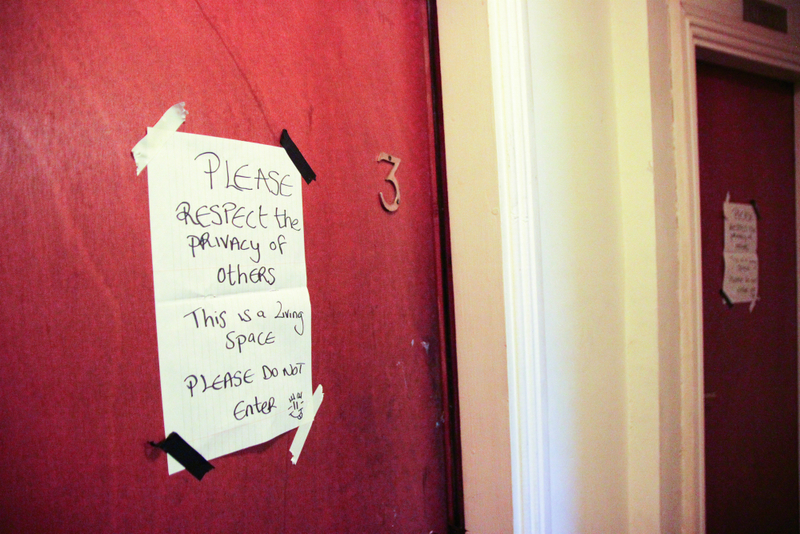 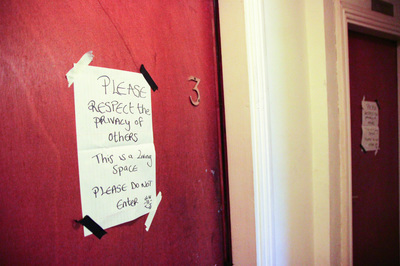 Catherine's partner Raymond remains barricaded into the apartment to which the management have cut off all services. Raymond is currently there now with the children in a cold and dark apartment with no electricity or gas. 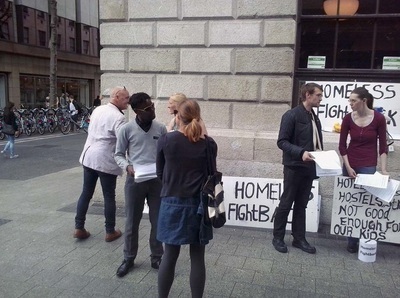 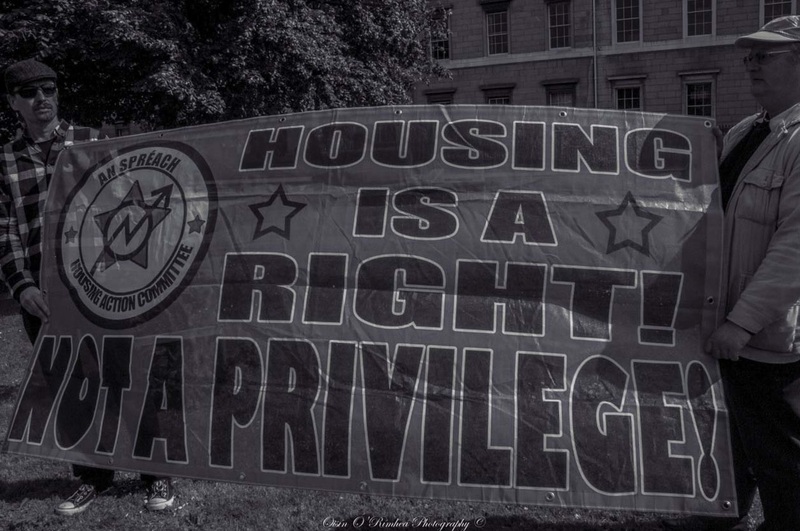 Today members of D8HAC supported the Irish Housing Network as it endeavoured to negotiate the return to tenancy of a young mother who had been evicted from the DCC approved temporary accommodation facility for previously homeless people. 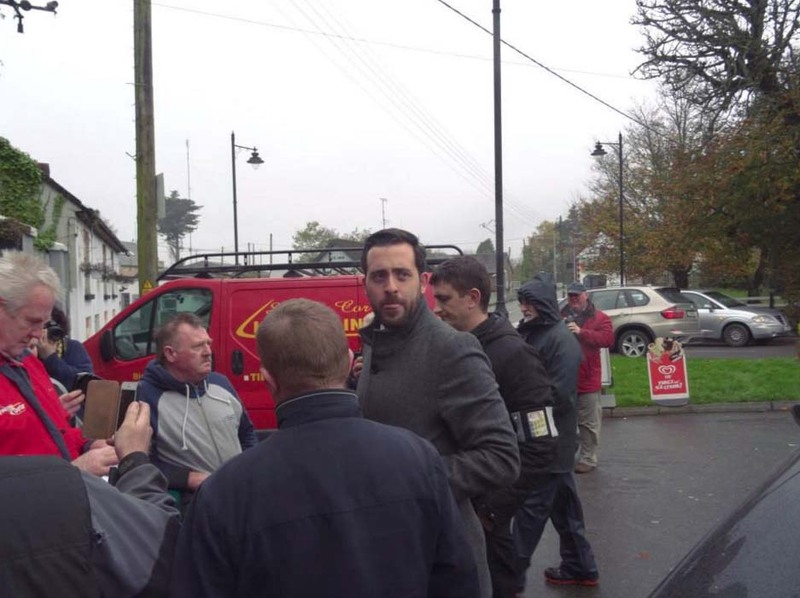 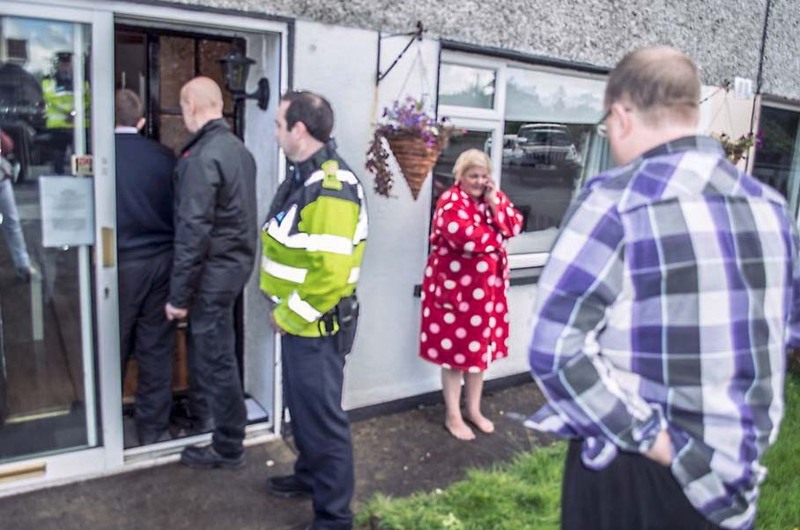 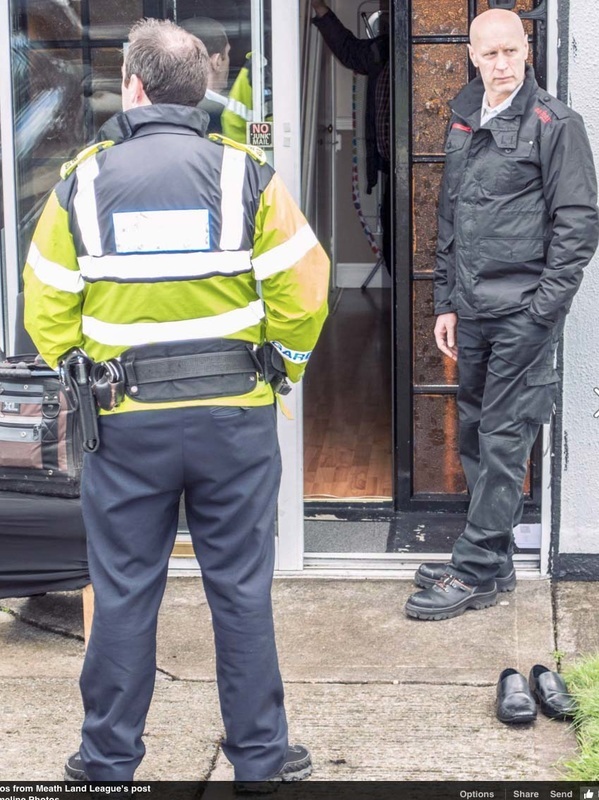 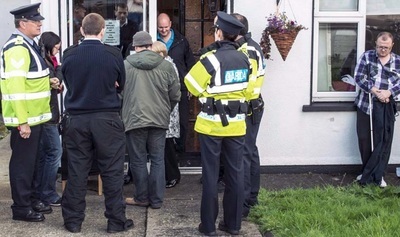 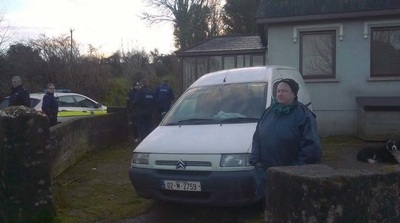 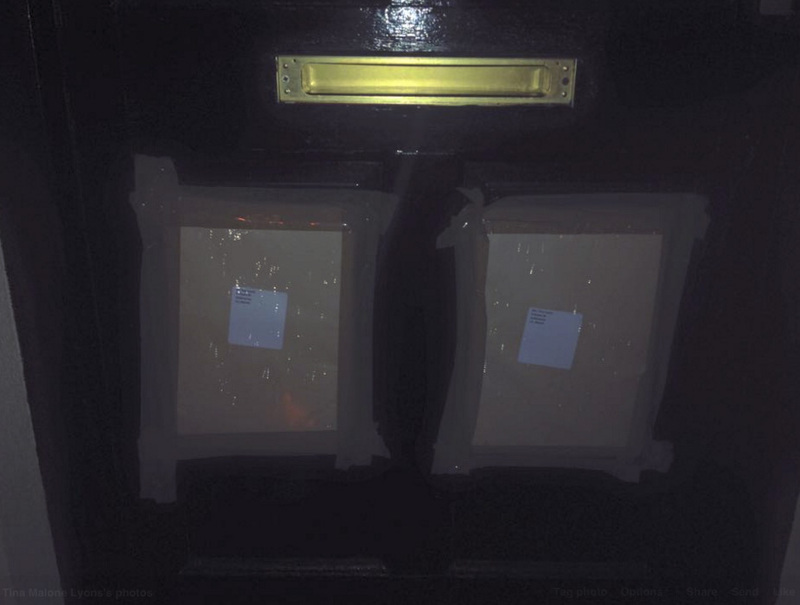 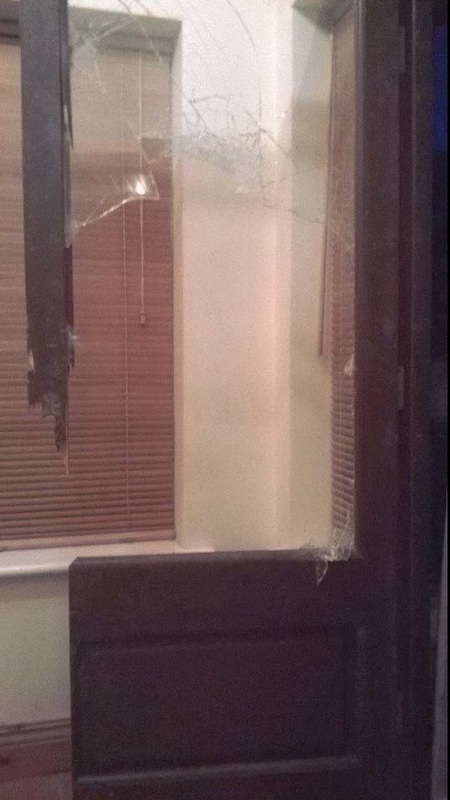 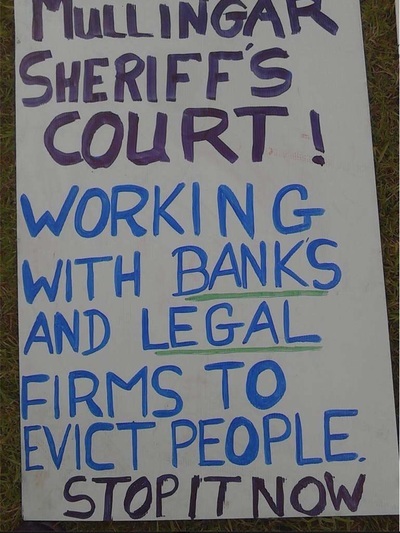 The eviction occurred on Friday evening in the height of Storm Desmond's torrential downpour as a result of a dispute with the management company over the supply of gas for the central heating system. 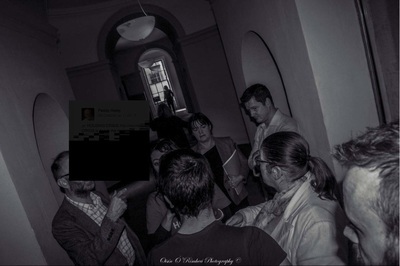 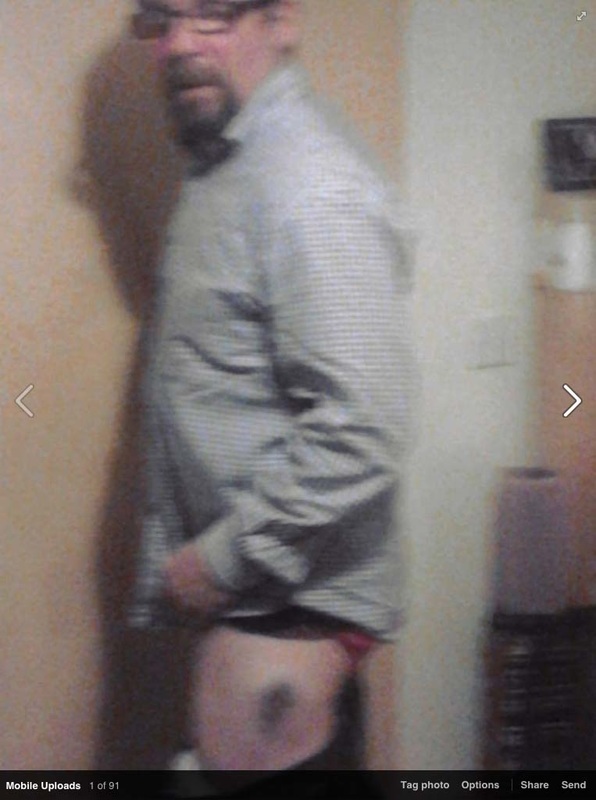 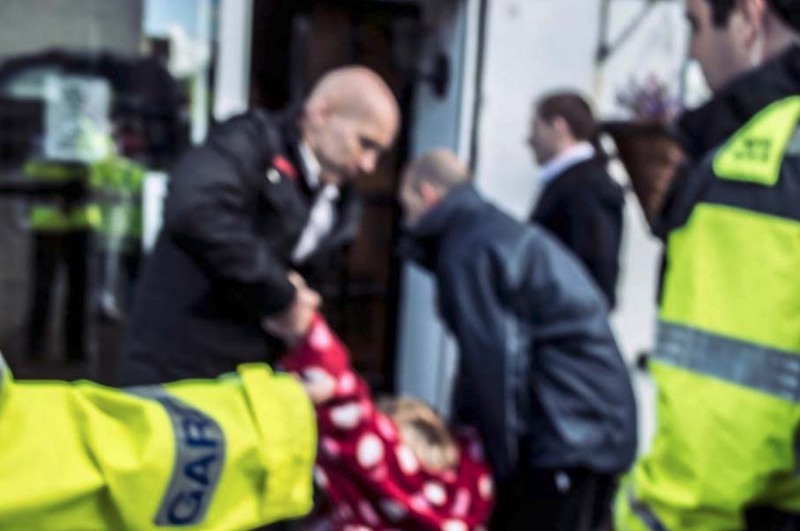 This is a picture of what the Gardai did to my friend Pat in Castlebar last week. 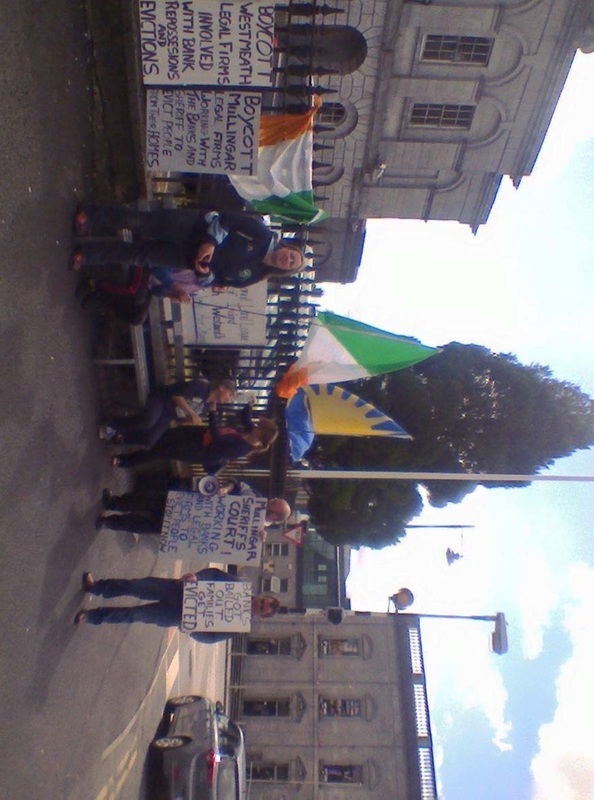 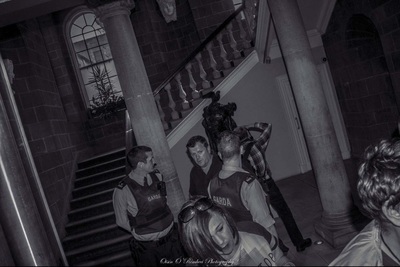 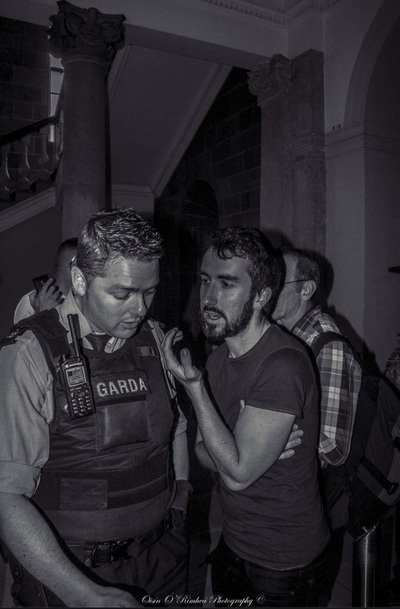 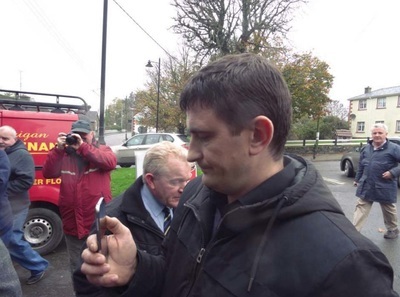 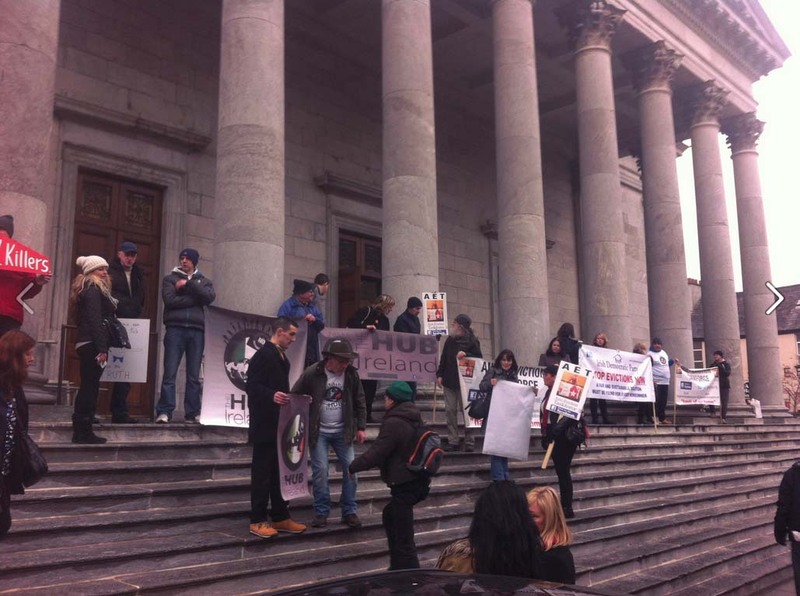 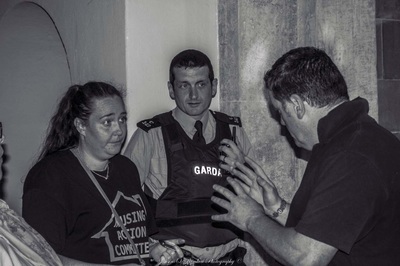 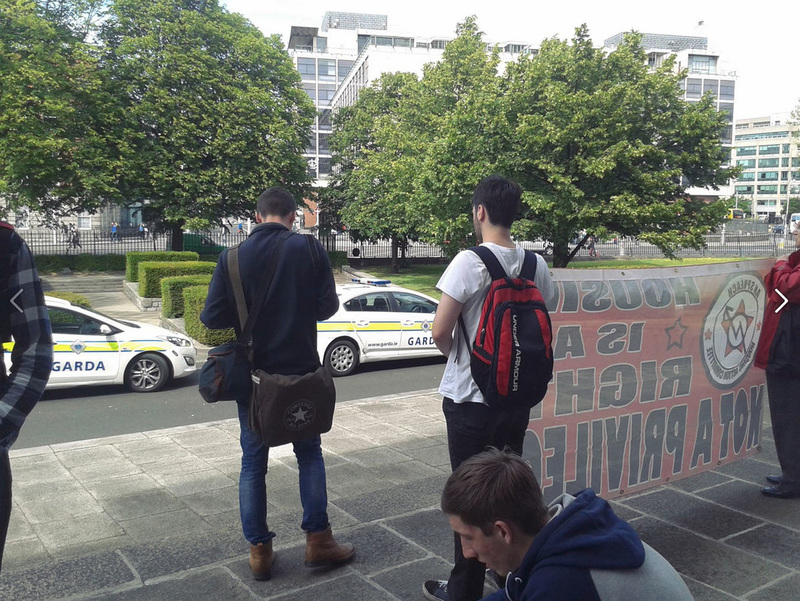 Pat, almost 55, with a heart problem that the Gardai are all too aware of was "escorted" out of Castlebar Court. 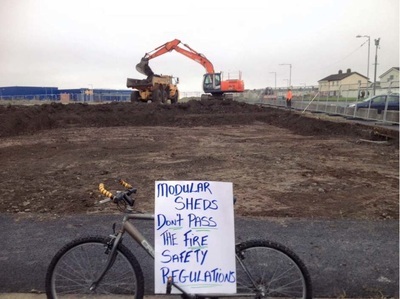 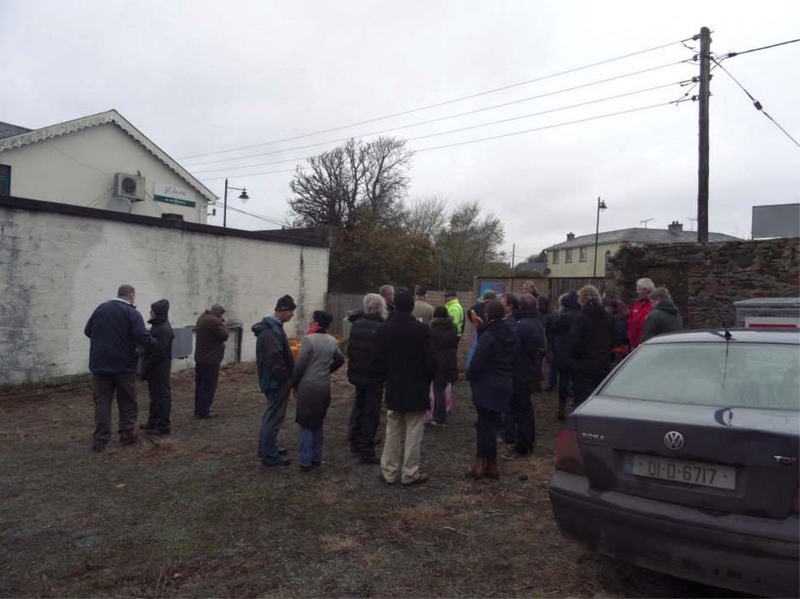 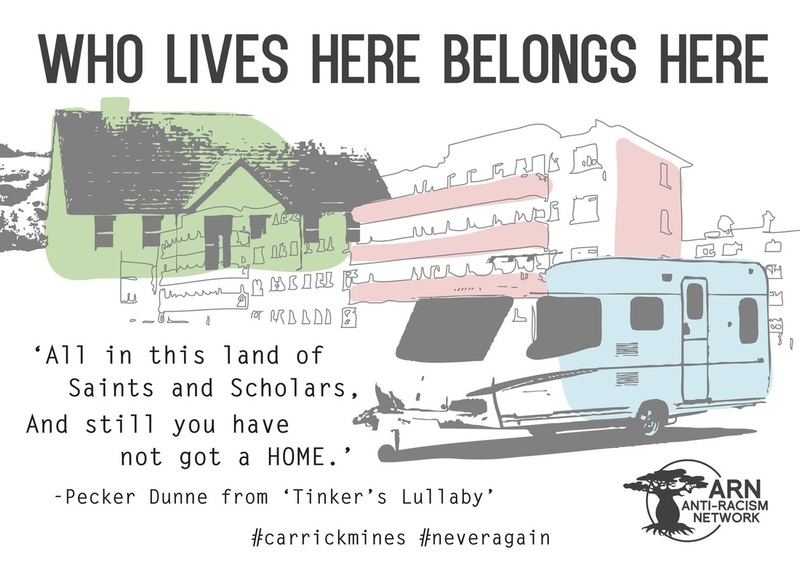 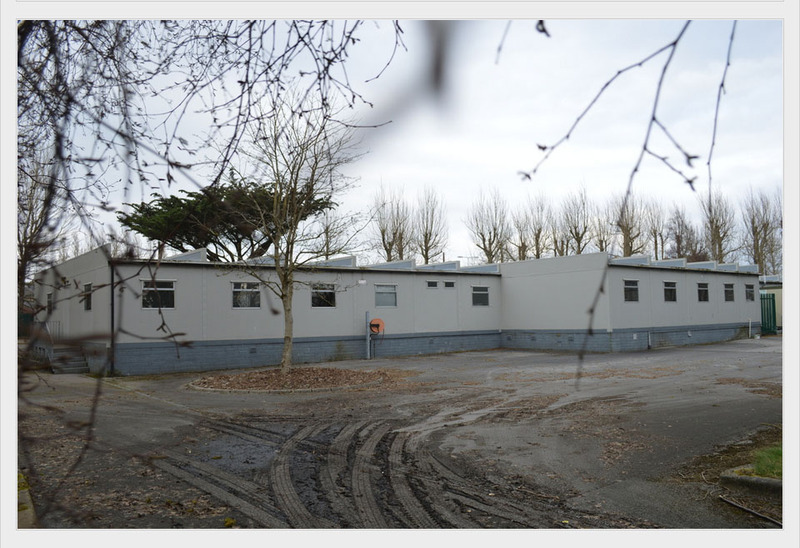 Statement on behalf of Members of CTSL Housing Co-operative who have lost €5,000 on planning permission on the site at Popintree 6 where the modular housing is being placed. 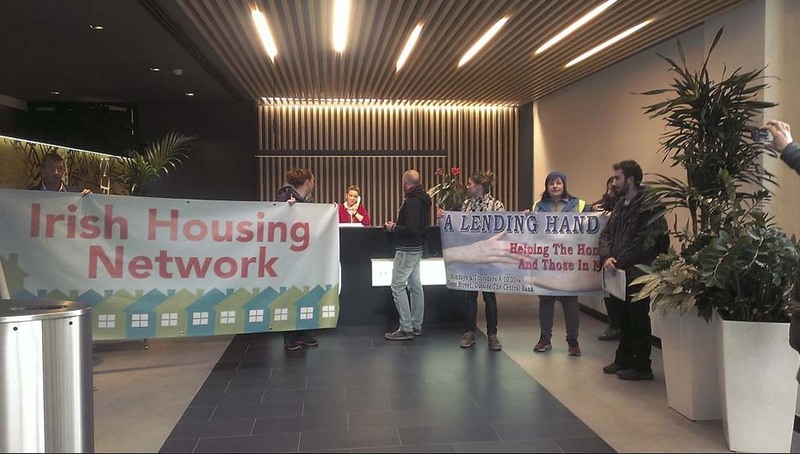 Although the protest was not planned by the Housing Co-op, We would like to thank all of those who turned up in solidarity today. 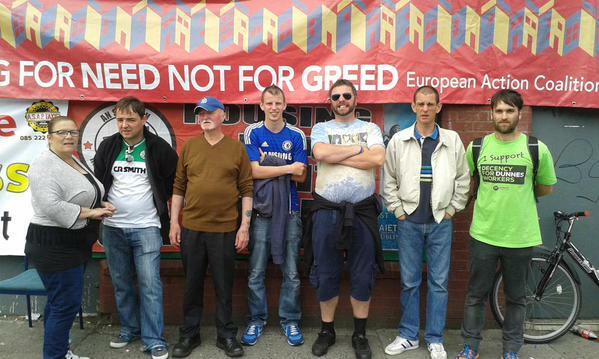 It has succeeded in getting our story told & attracted media attention to how badly members have been treated. 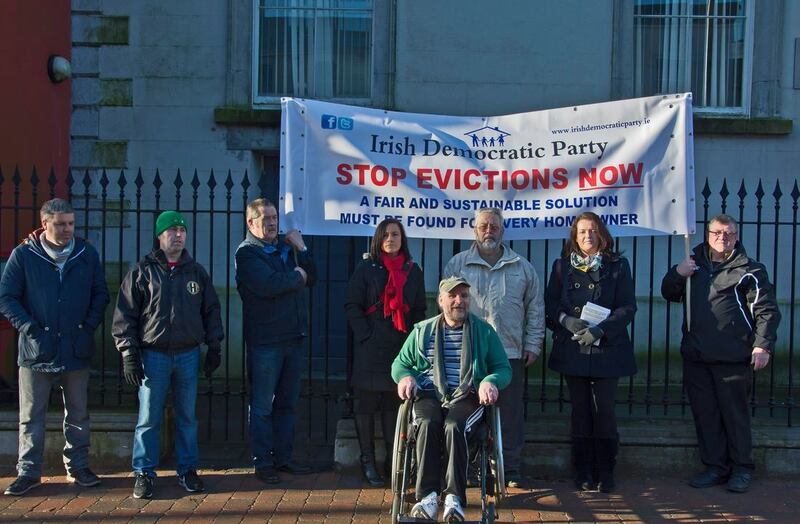 It succeeded in securing an emergency meeting between DCC & a representative of the Co-operative. 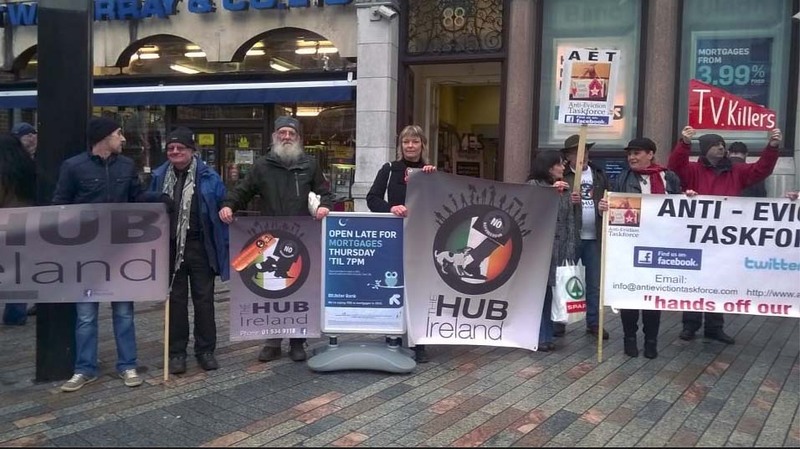 Talks will be starting Monday on a possible process for refunding members, although no solid commitments have been made. 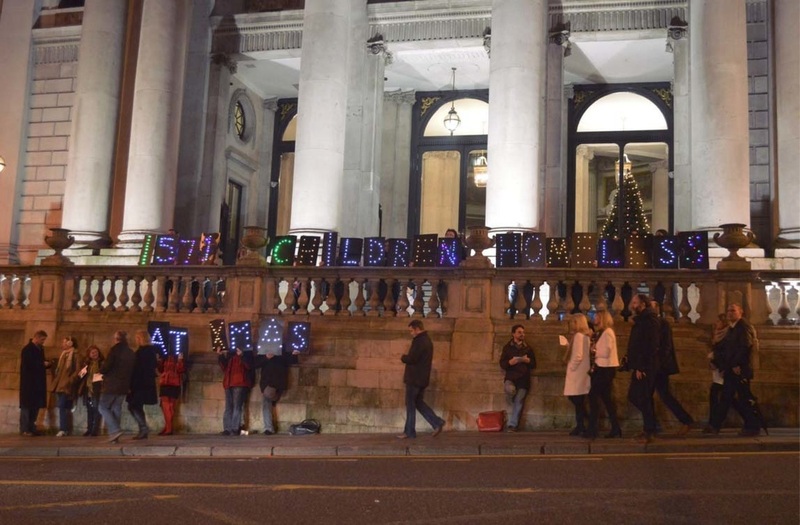 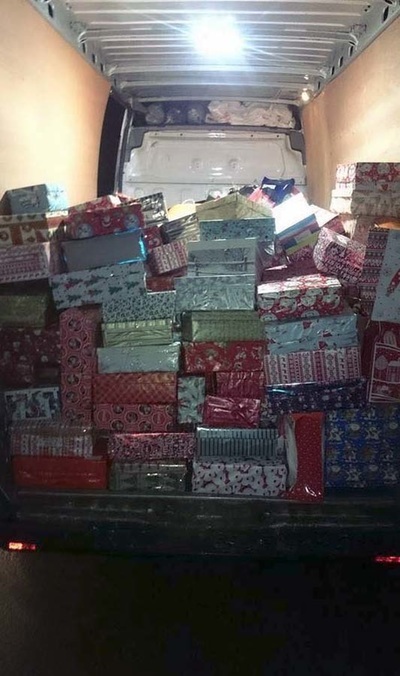 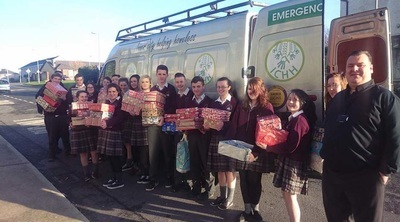 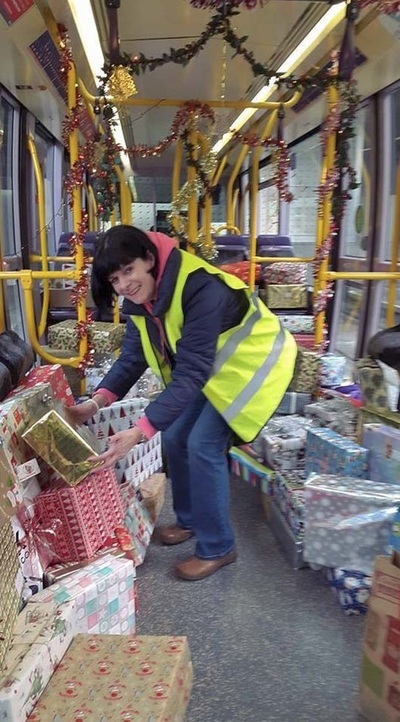 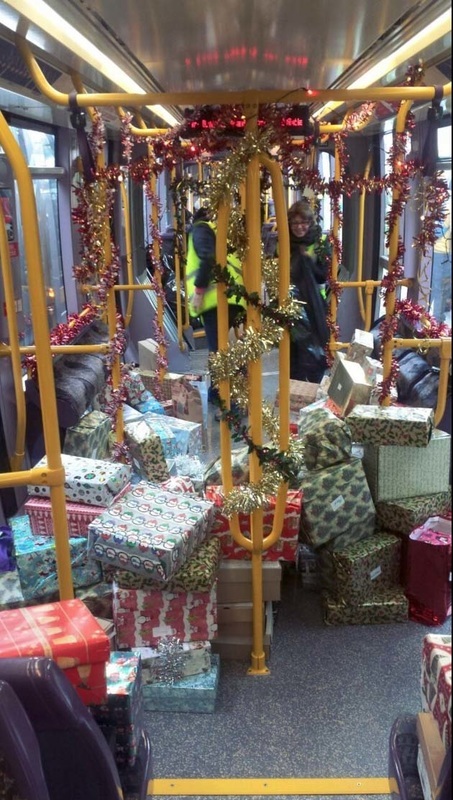 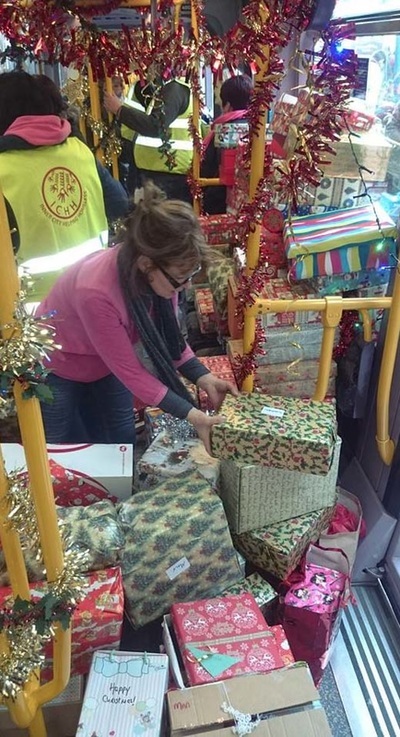 DCC have made it clear that they are on an extremely tight schedule to have these in place for families for Xmas. 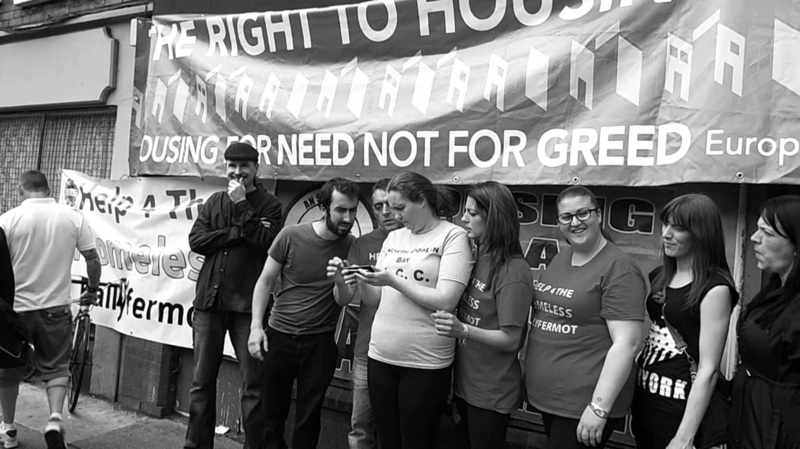 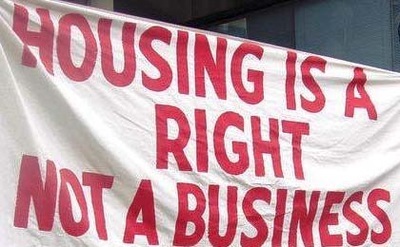 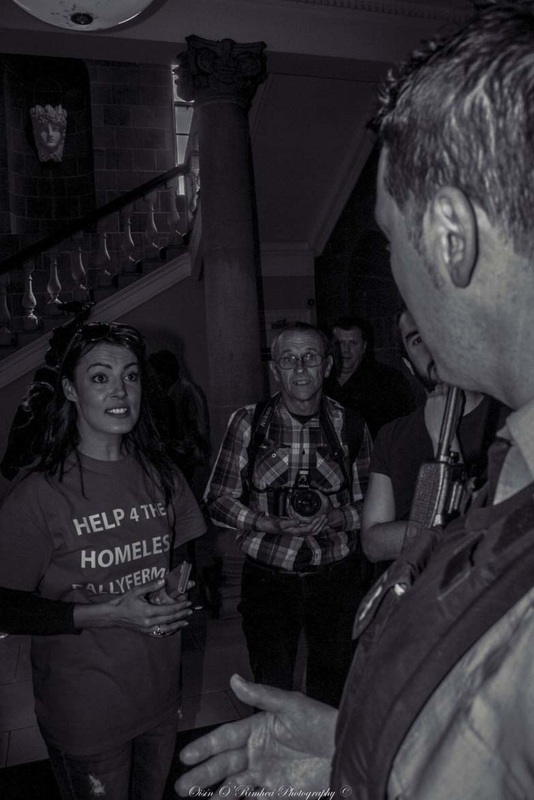 It is & never was an objective of the Co-operative to stop homeless people being housed. 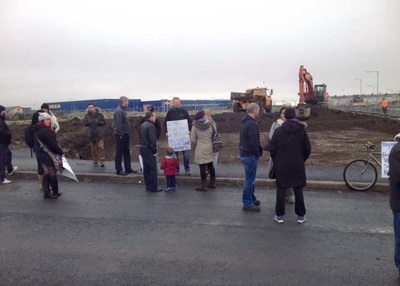 The members of CTSL would request that the protests on site are postponed temporarily & would ask that no groups use this as a means to further their own agendas, as at this point it will jeopardise our members getting a refund. 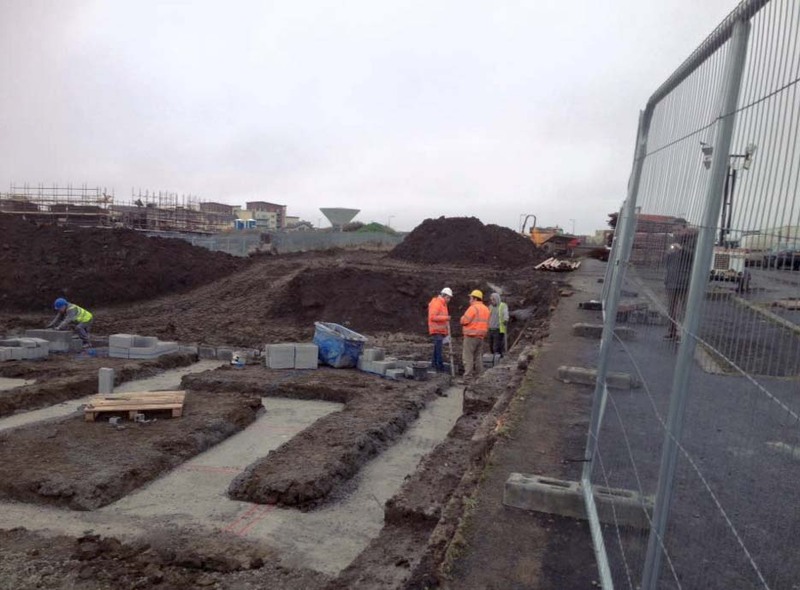 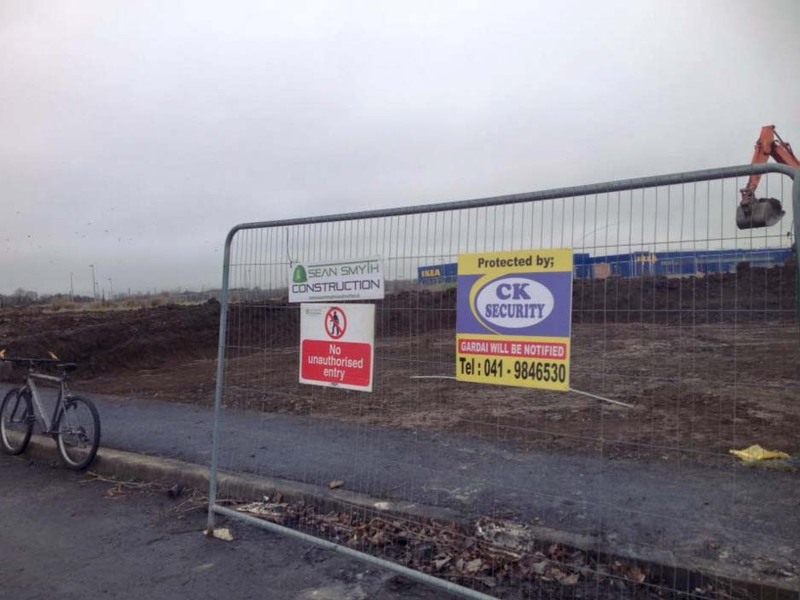 If protest continues on this site for a week the homes will not be delivered by Xmas & it will not matter then if it is January or June. 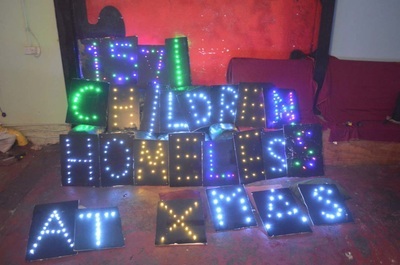 We only maintain any control as long as the Xmas target is still achievable. 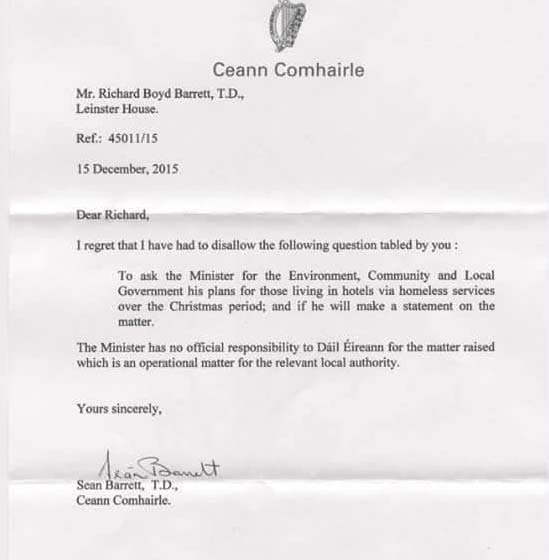 The membership would please request that protests are postponed to all allow us time for some negotiations. If we fail to secure any commitments within a short timeframe we can resume protest. We would request that all groups please honour this & work along side us. 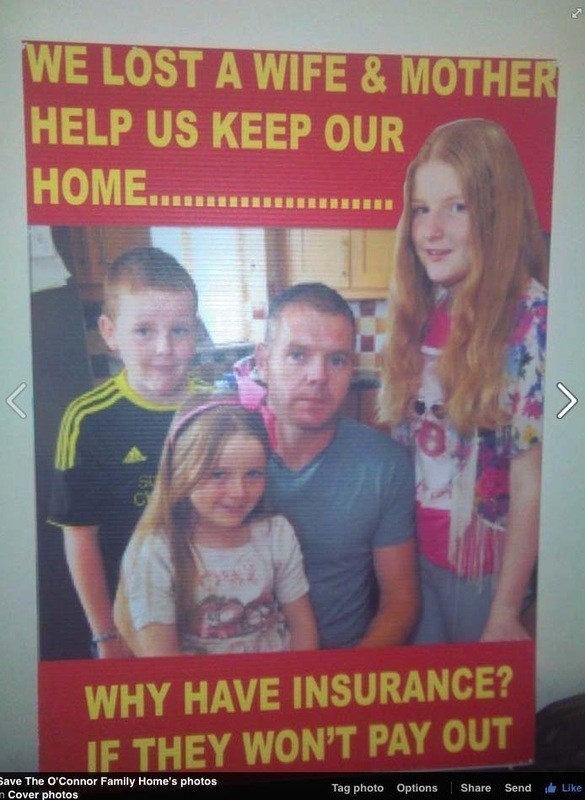 A Family which recently separated are living in a Hostel with no fire exits, living in a very unsuitable hotel for 19months needs urgent help to be provide suitable accommodation from the Council for the dad Christy who has life threatening illness and needs medical apparatus powered by electricity which can't be used in a car and the Mam, who is severely struggling to lift disabled son Michael aged 13 in and out of his bath, wheelchair and into bed. Elysian Tower Cork - Tallest building in Ireland. 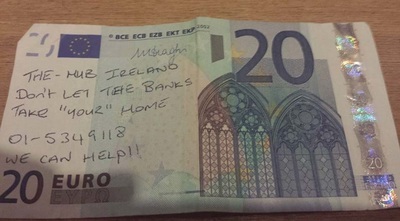 Built to cash-in on the speculative boom - taken over by NAMA. 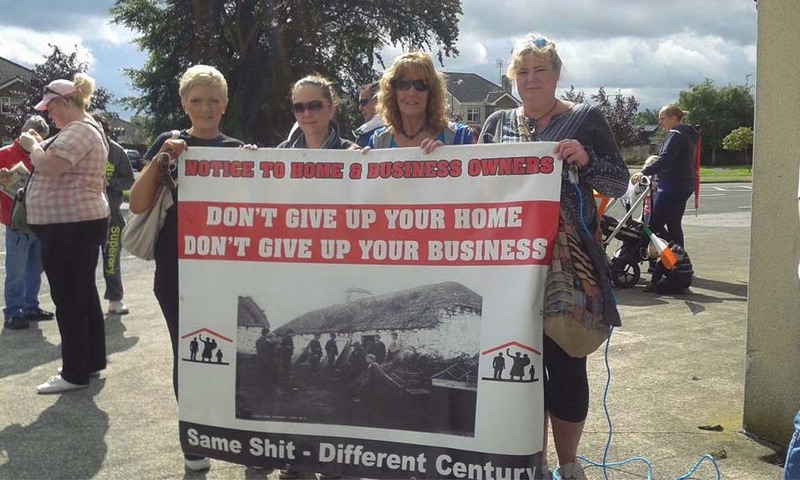 Sold to Profiteers. 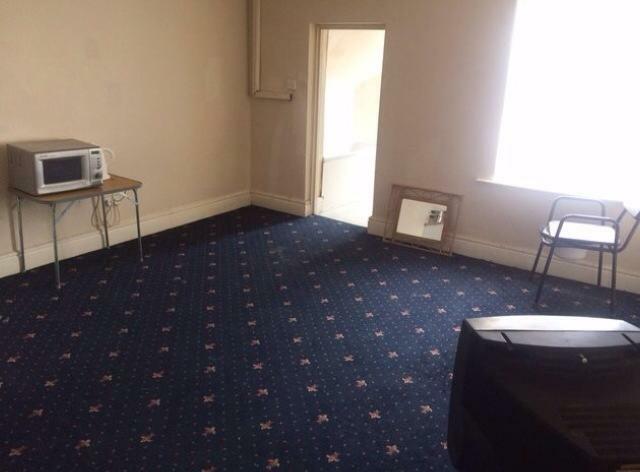 Mainly empty apartments. 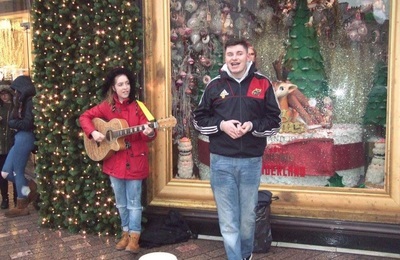 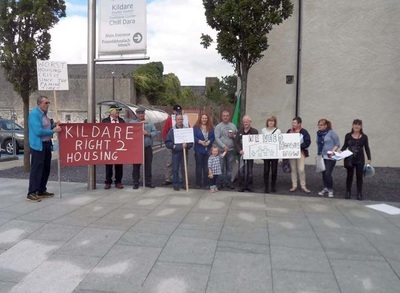 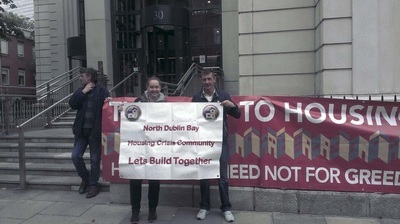 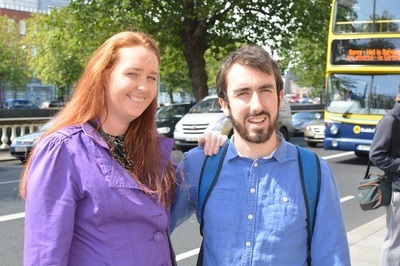 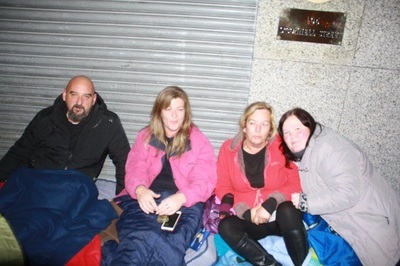 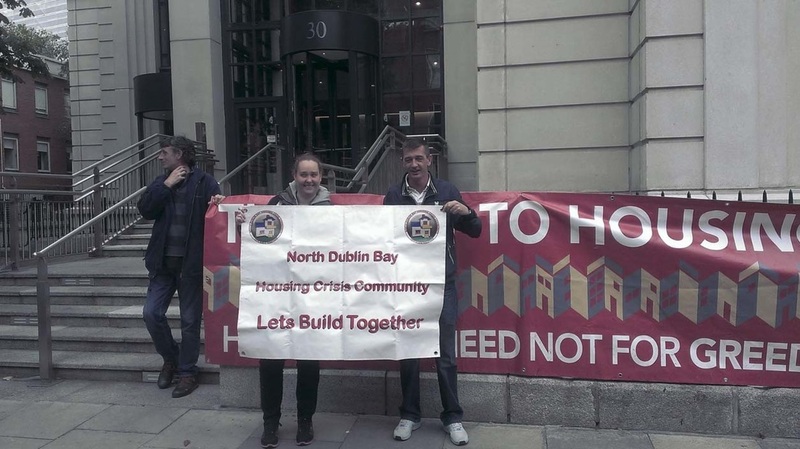 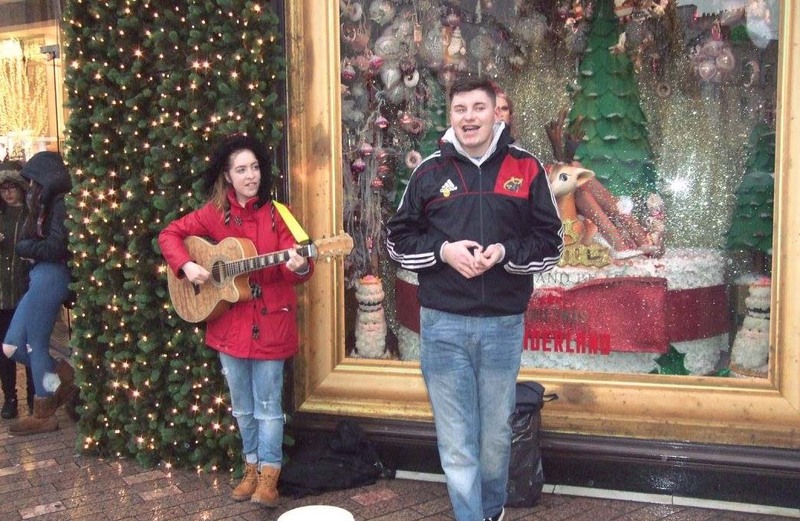 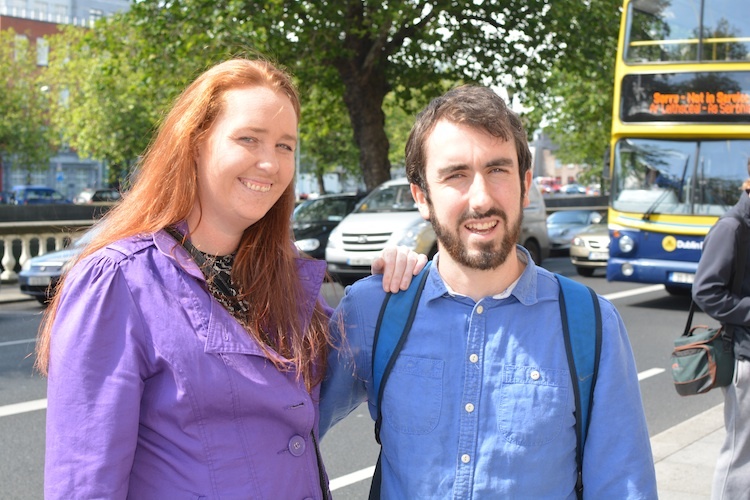 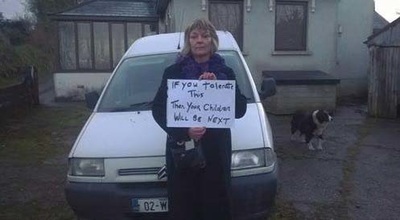 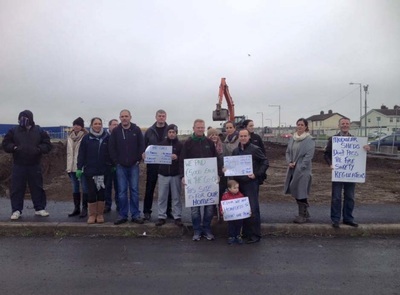 Alan and Kellie have taken a brave stand against South Dublin County Council (SDCC). 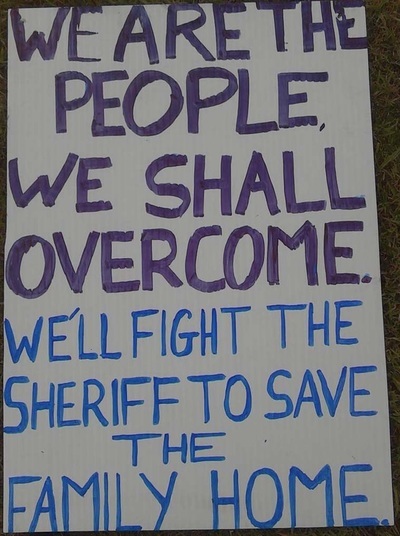 Their demands were modest. 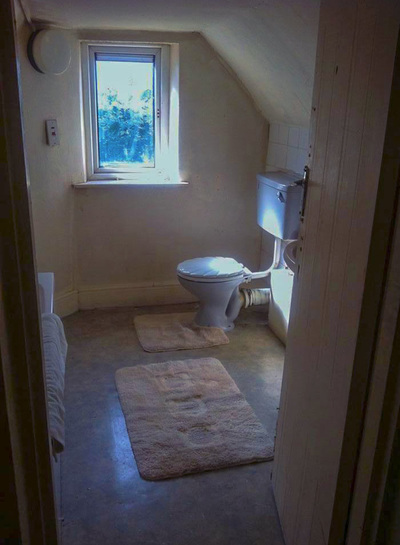 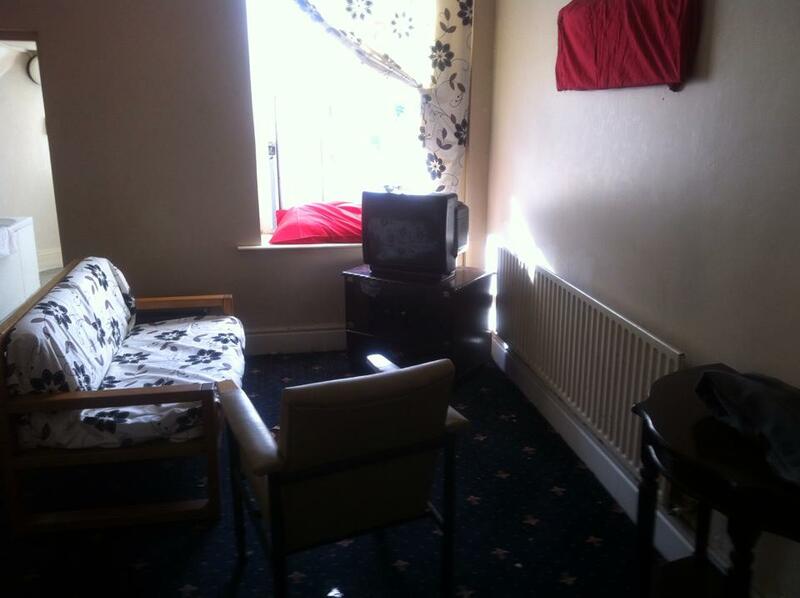 A place that caters for Alan considering his medical condition and a space which can accommodate his son. 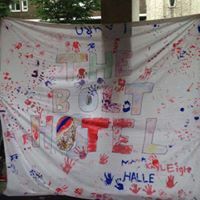 Last night Alan was sick, a stress inducted seizure, he and Kellie still do not have suitable accommodation, are facing worse conditions and crushing uncertainty. 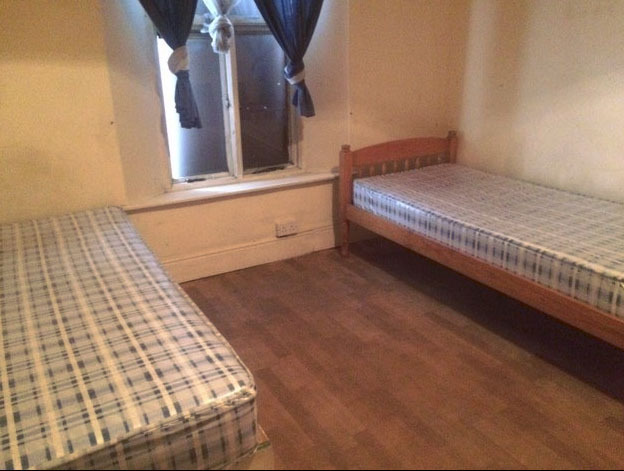 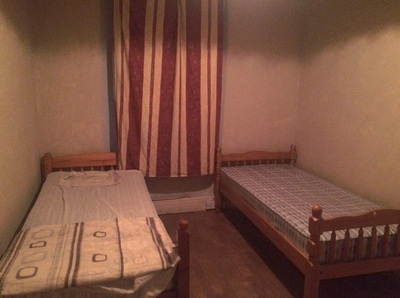 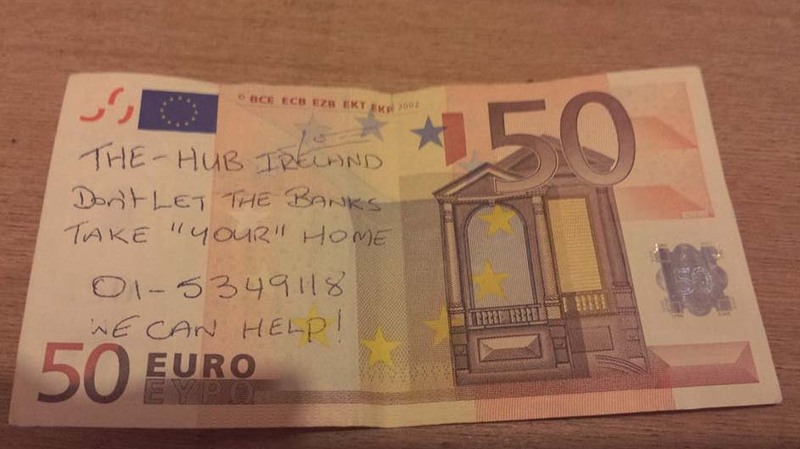 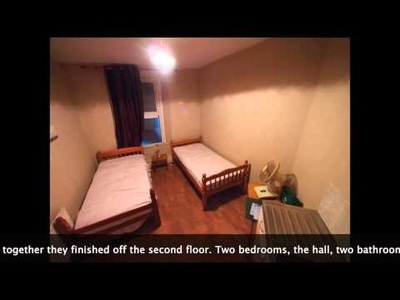 The Council also offered to house the couple tonight in a hostel. 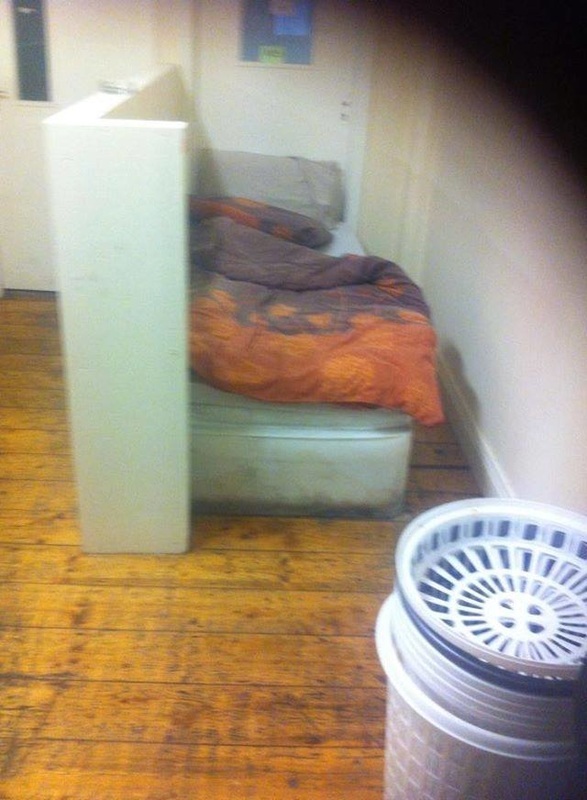 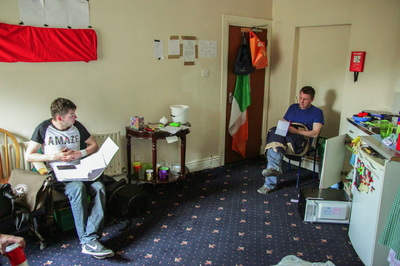 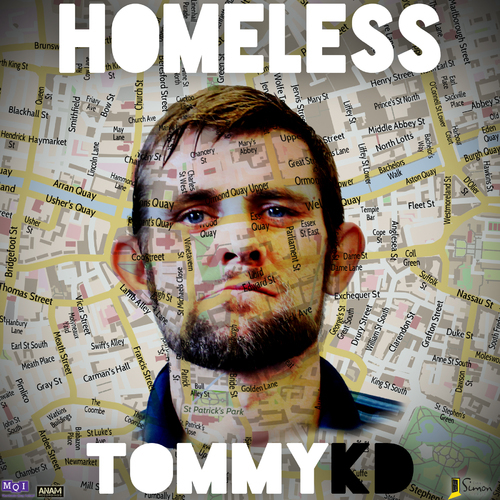 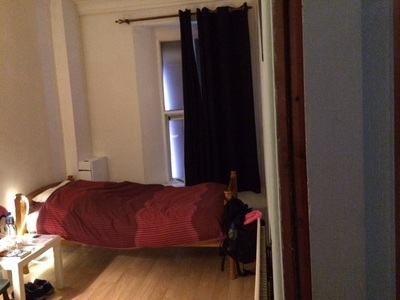 Despite a doctors order that hostel conditions were not suitable for Alan, SDCC placed Alan Kelly in a hostel in the city centre. 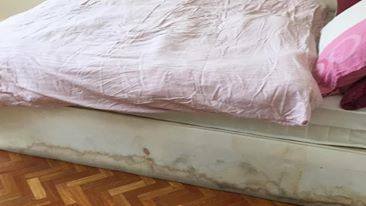 On inspection the entrance was virtually blocked with rubbish, mattresses were covered in urine and mold was growing on the windows. Alan was in a Coma this year, Kellie is his carer. 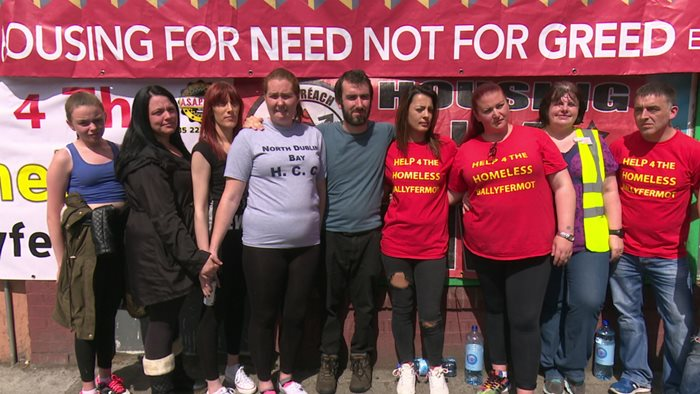 The stress has already impacted on his health and this was a disgusting move by SDCC. 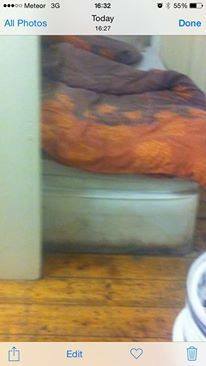 These conditions are not suitable for an animal, no person should face them and Alan physically can not. 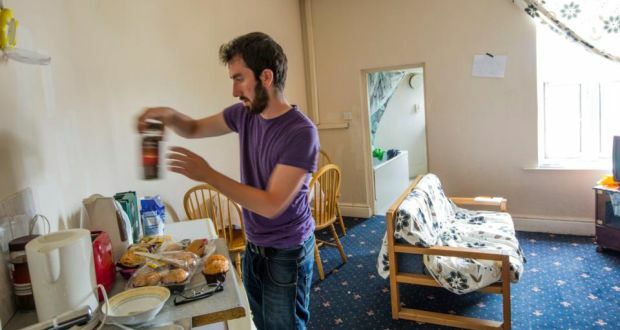 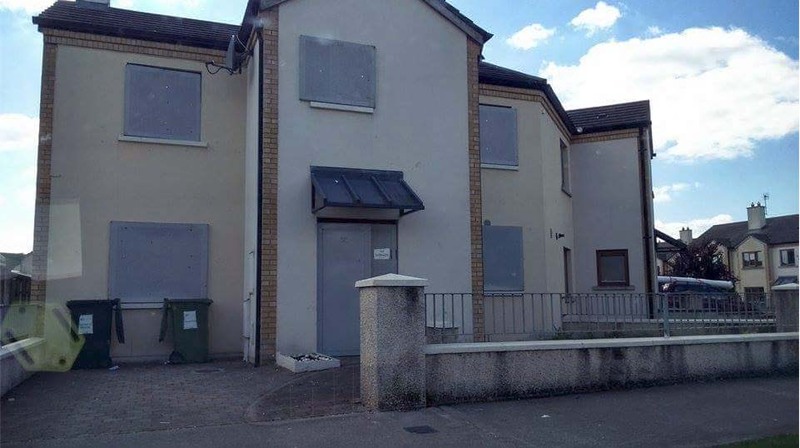 Direct provision is a scheme whereby asylum seekers are provided with accommodation on a full board basis with all their basic needs. 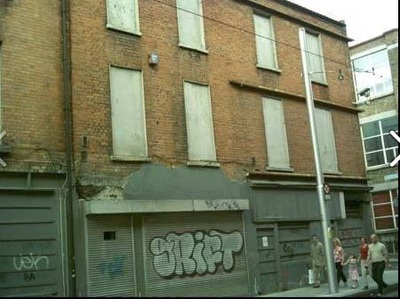 It was introduced by the government as a pilot scheme in November 1999 (FLAC, 2009). 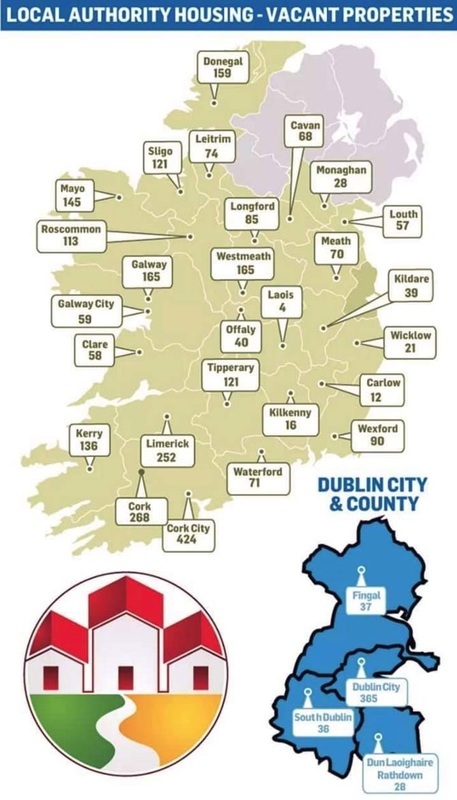 In 2004 there were 74 centres dispersed throughout the country. 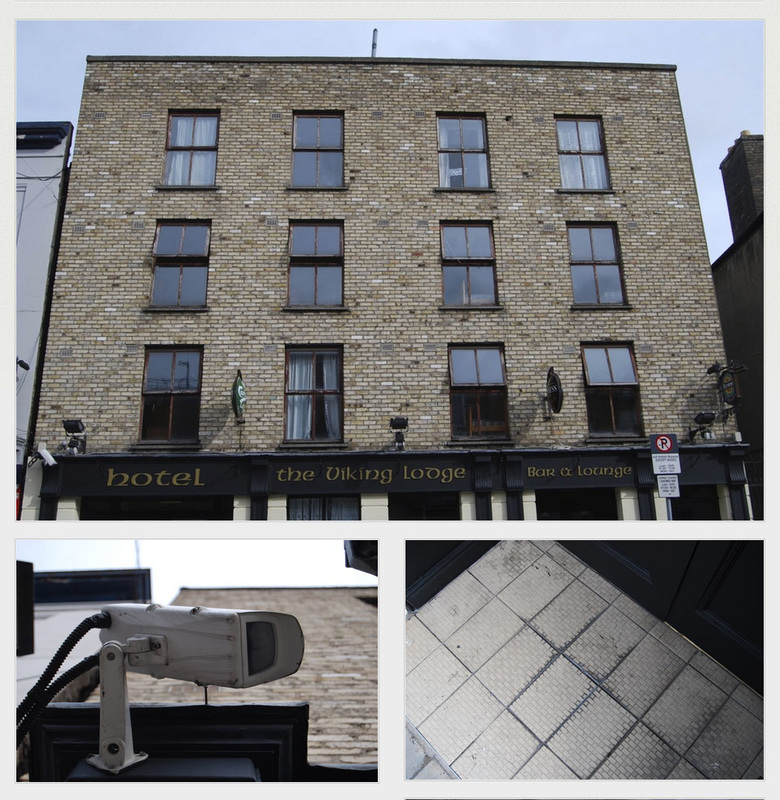 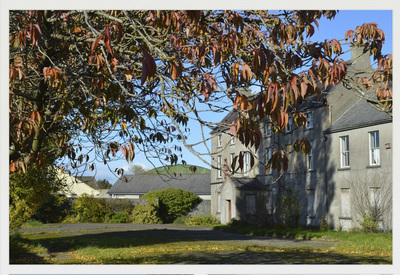 Currently there are a total of 34 former Hotels, Holiday Homes, Army Barracks and Convents, located in 16 counties in the Republic of Ireland. 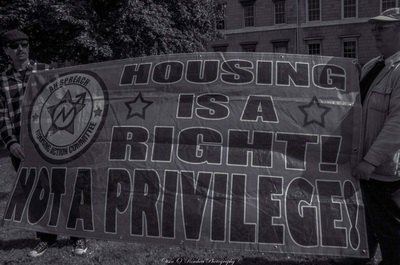 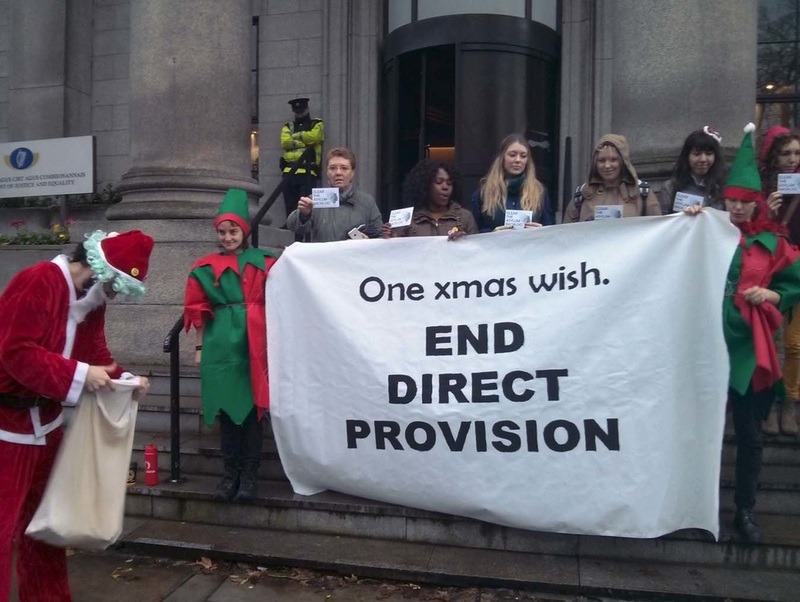 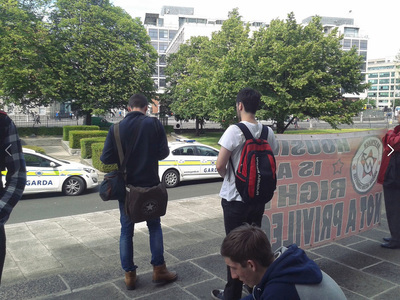 There are currently 4360 people living in Direct Provision. 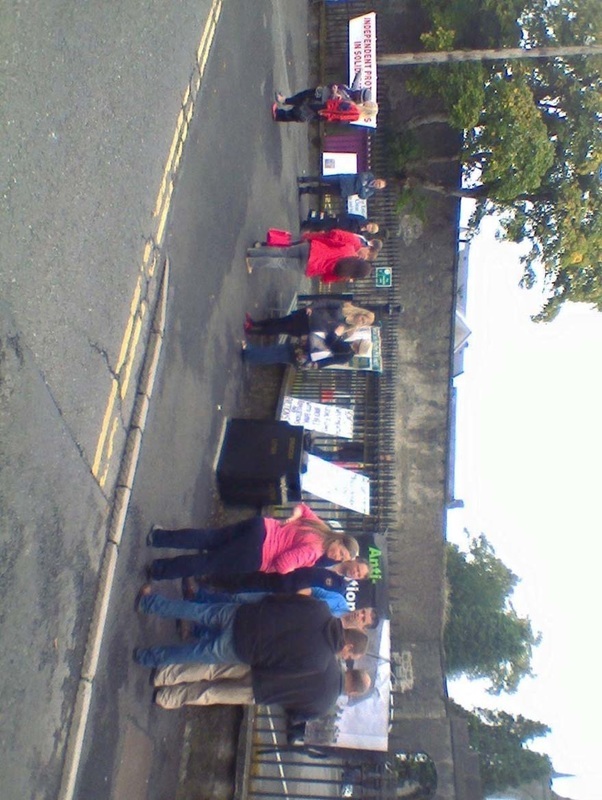 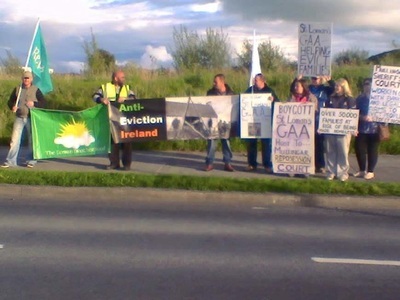 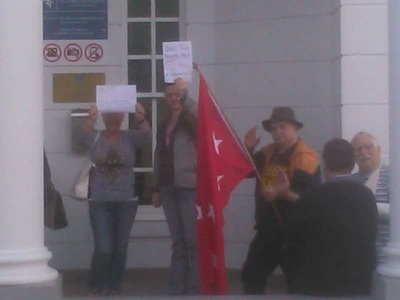 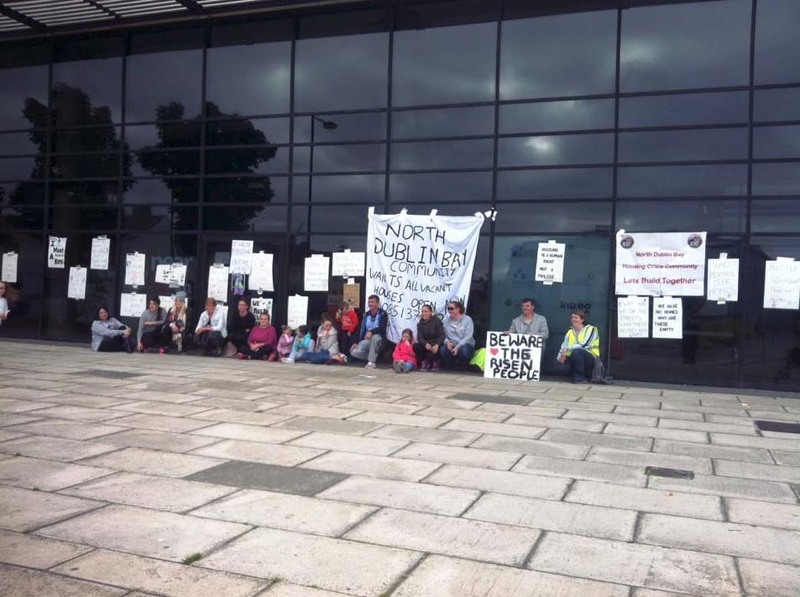 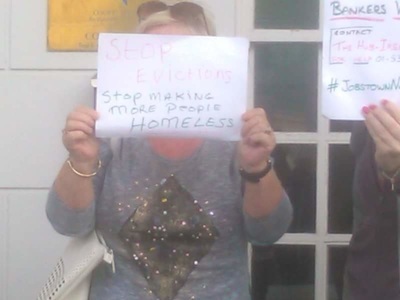 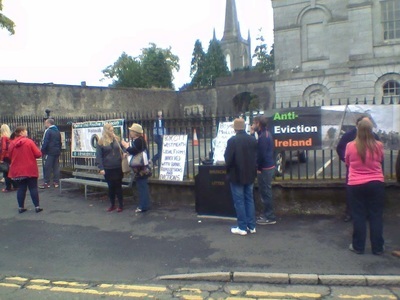 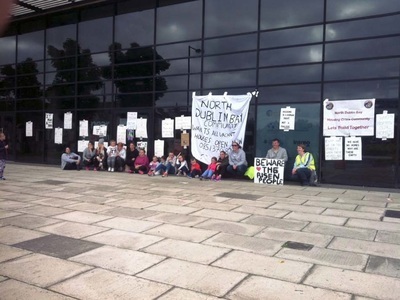 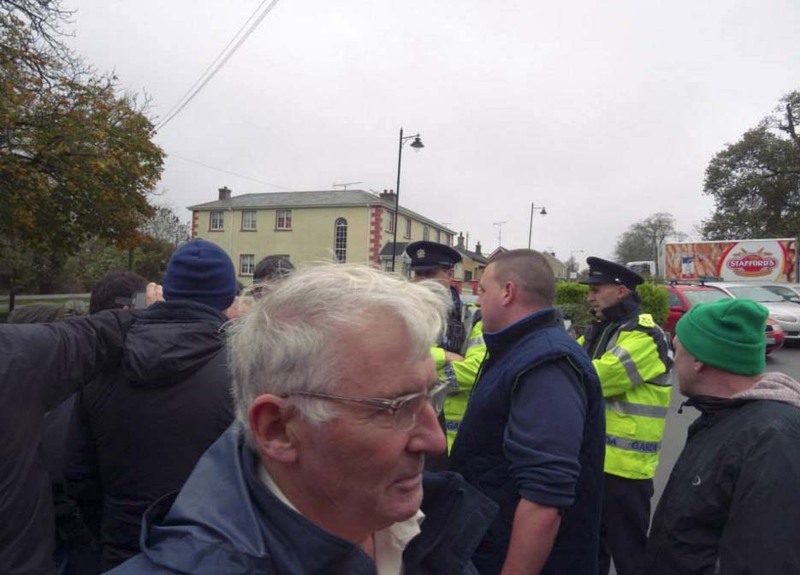 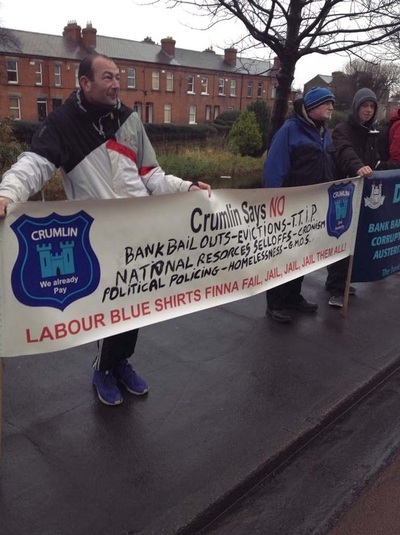 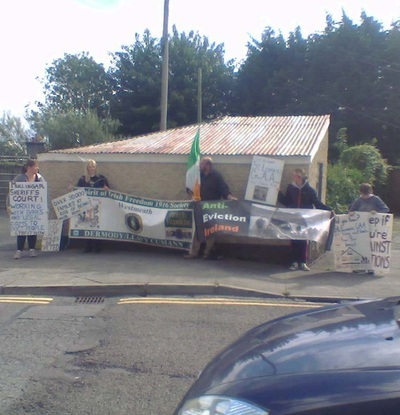 Anti eviction activists protesting outside a very wet Cusack Park in Mullingar on Sunday 23rd August. 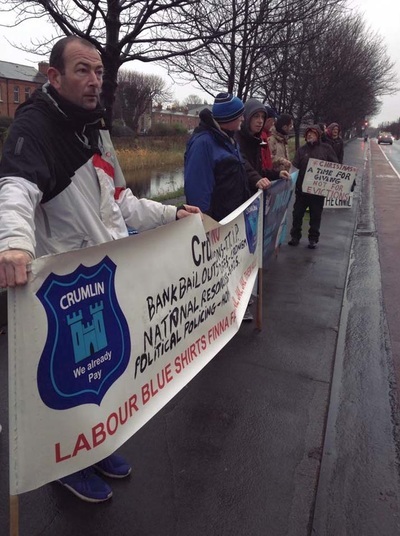 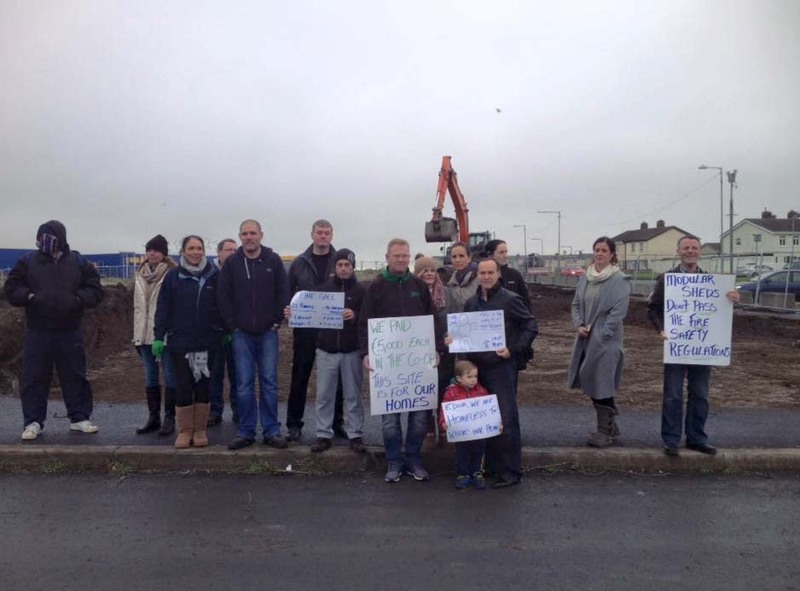 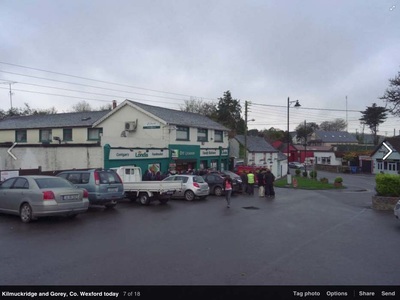 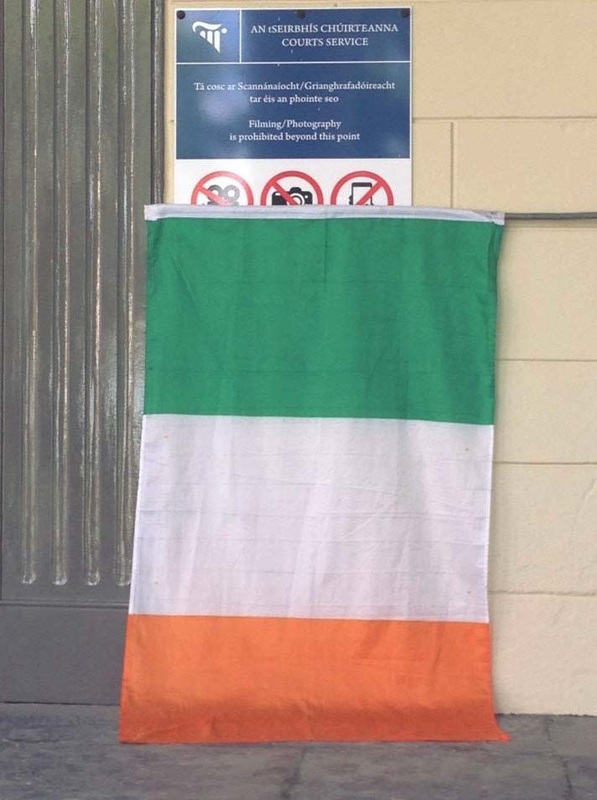 The protest was against local GAA Club St. Loman's, who were playing a senior championship match at the time. St. Loman's have rented out their clubhouse to the Courts Service which will also hold the Registrar's Court. 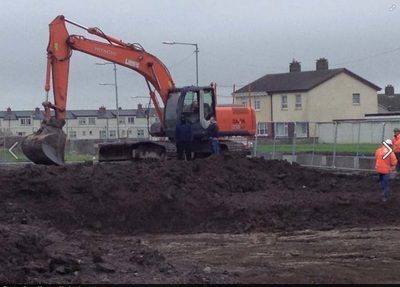 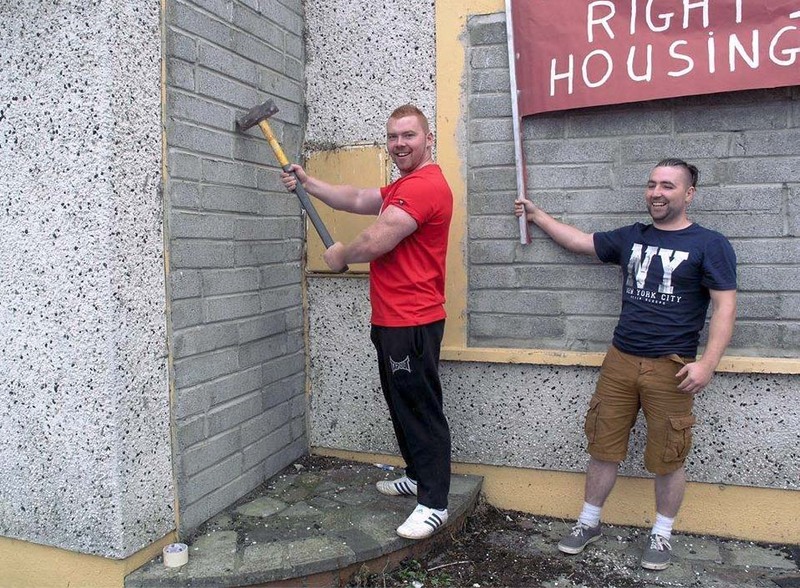 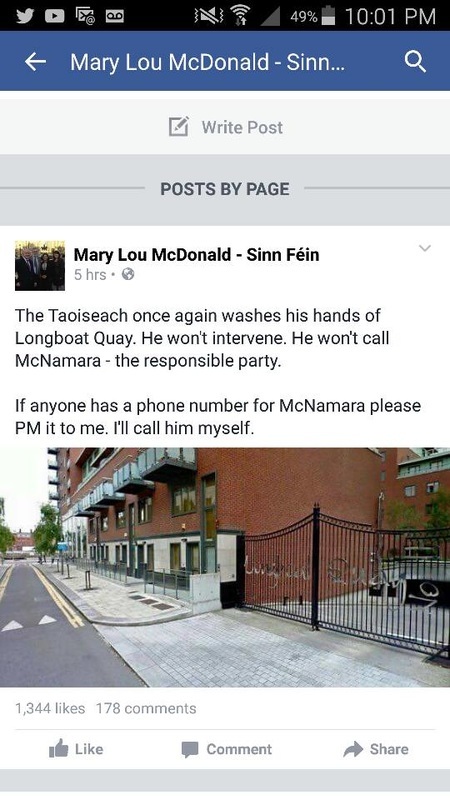 In so doing, St. Loman's GAA club are facilitating evictions and their action is certainly not in keeping with the origins of the GAA. 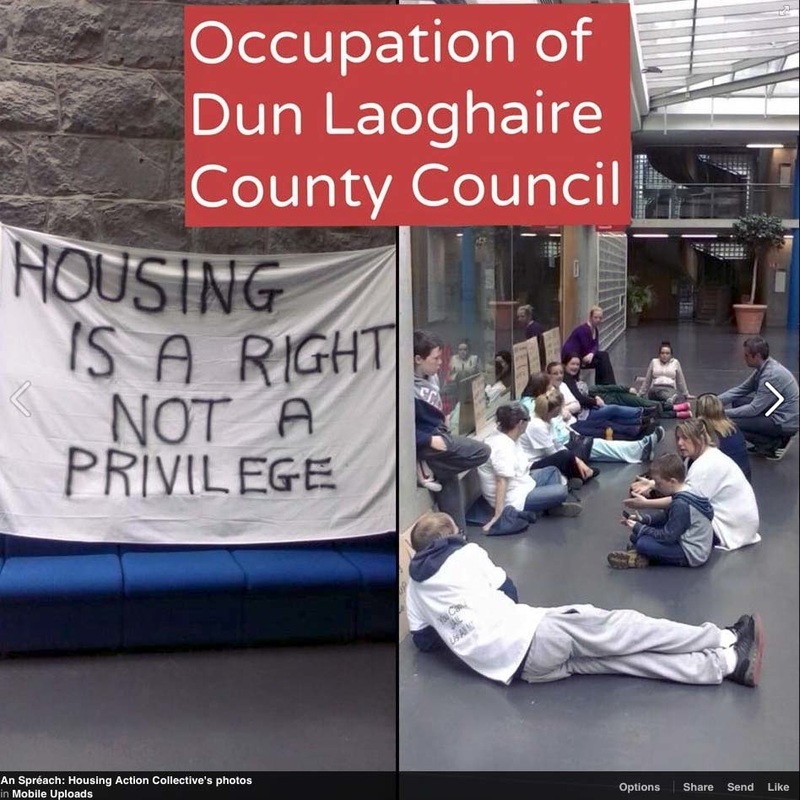 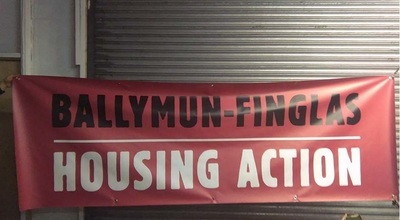 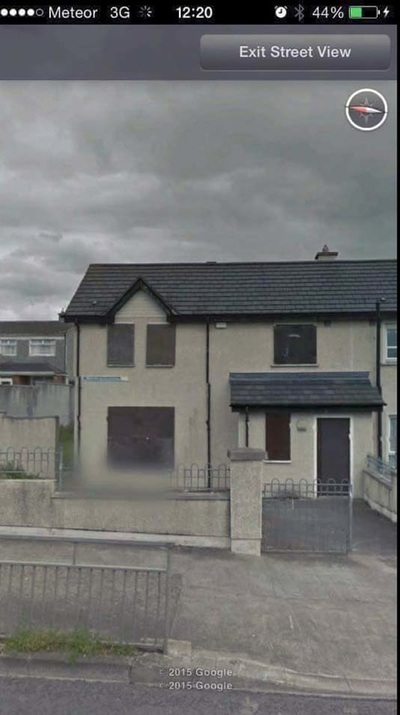 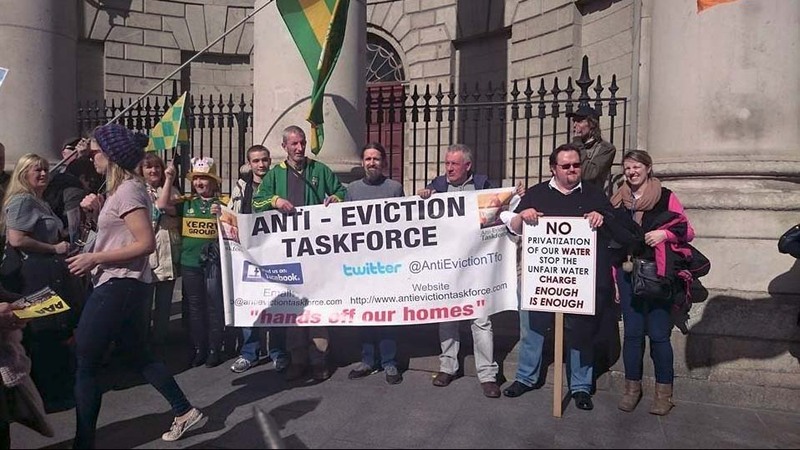 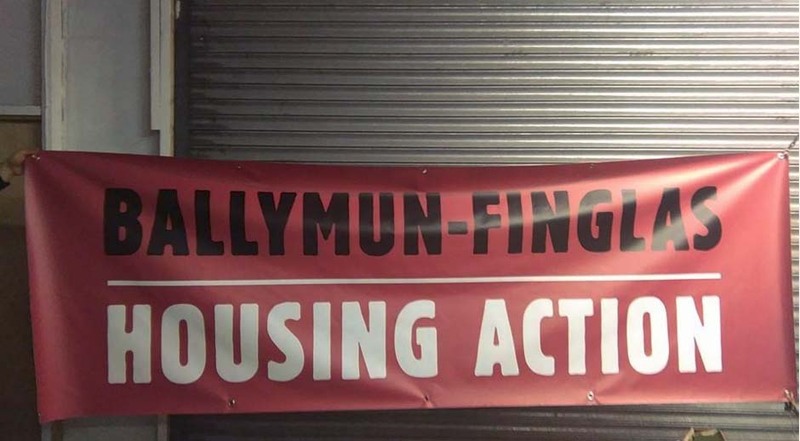 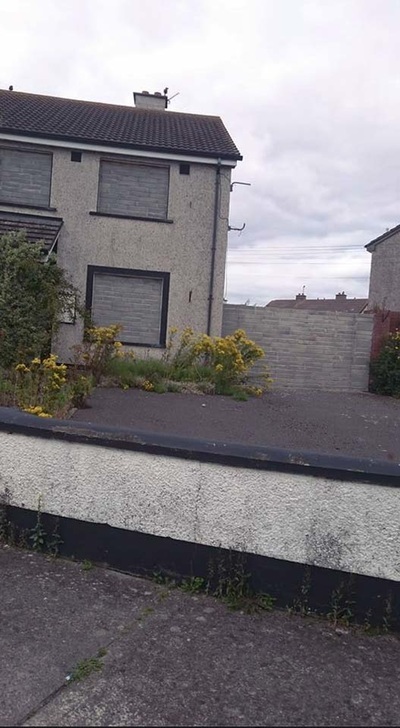 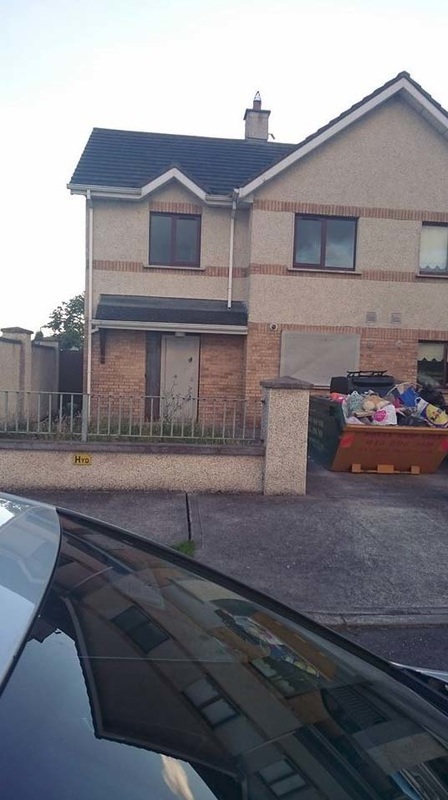 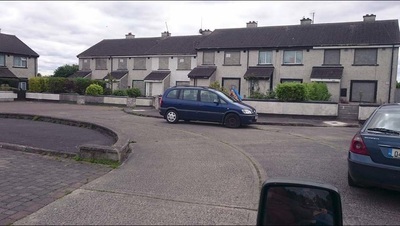 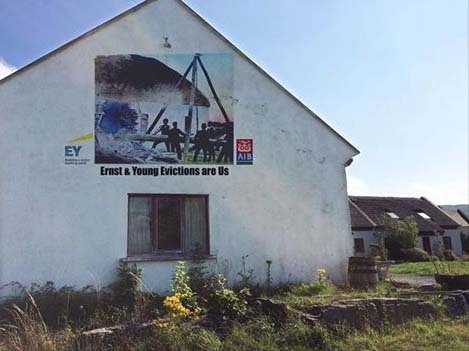 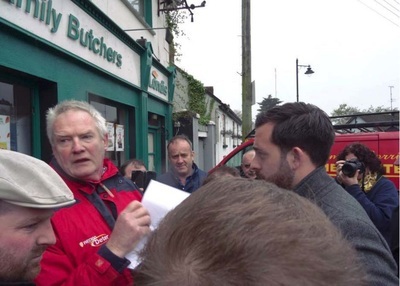 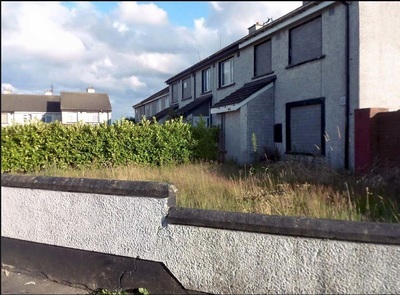 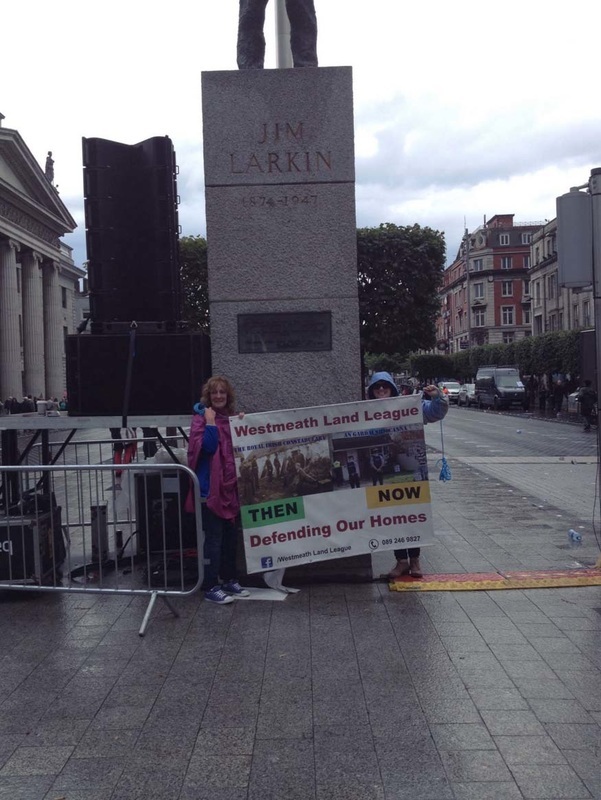 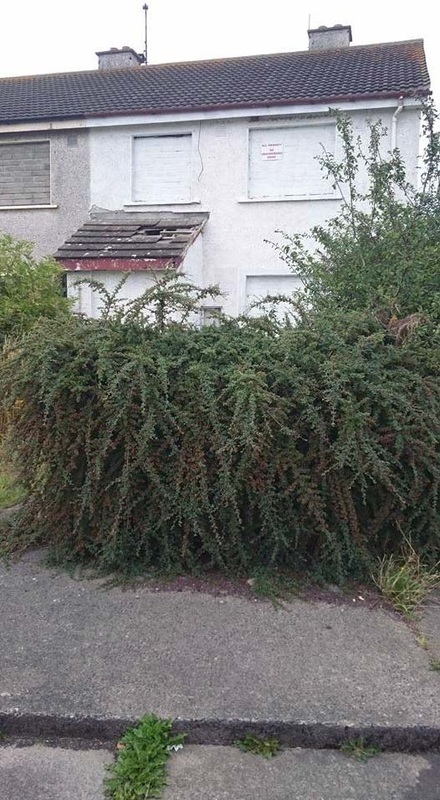 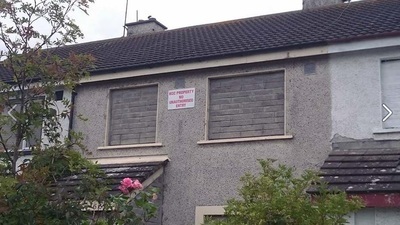 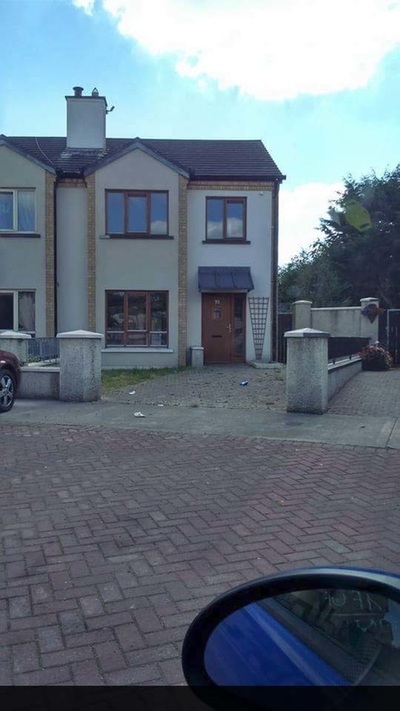 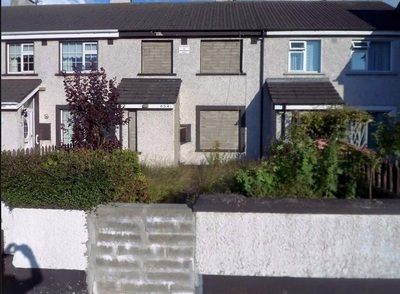 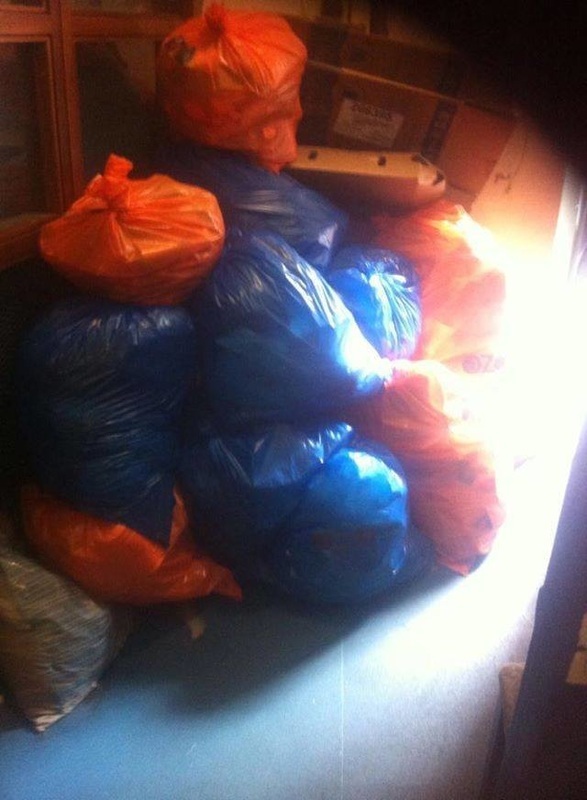 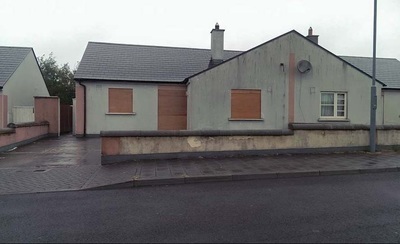 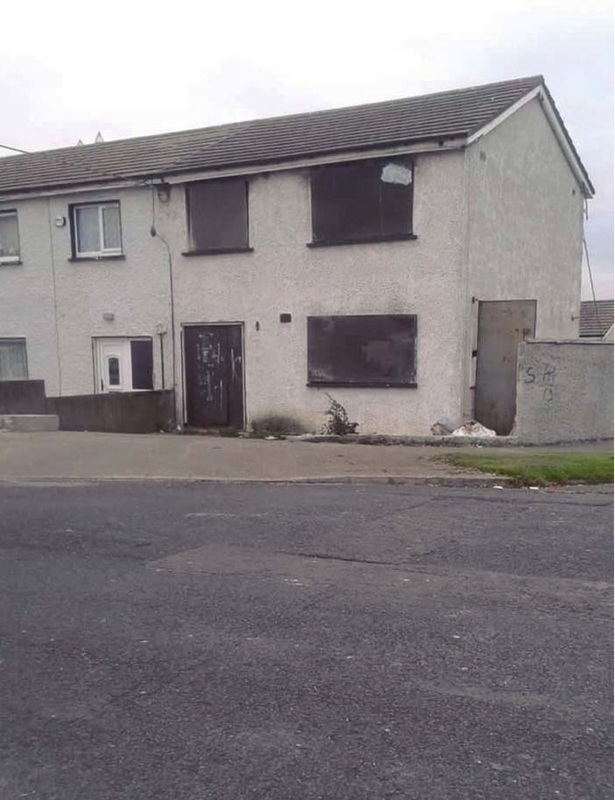 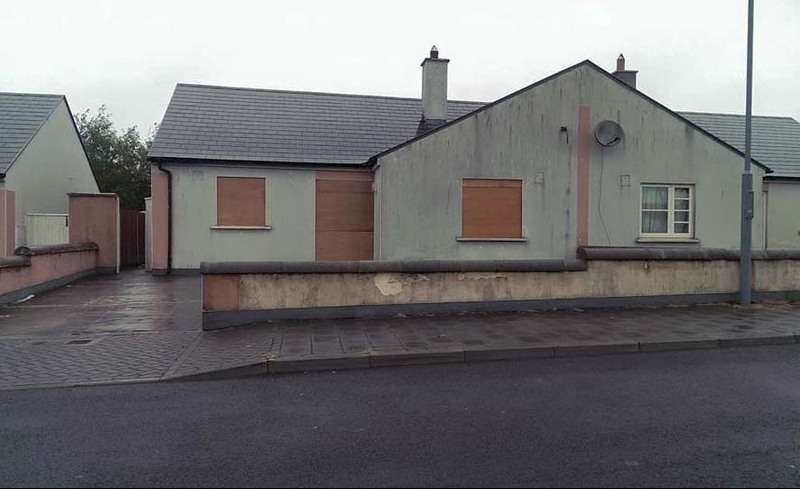 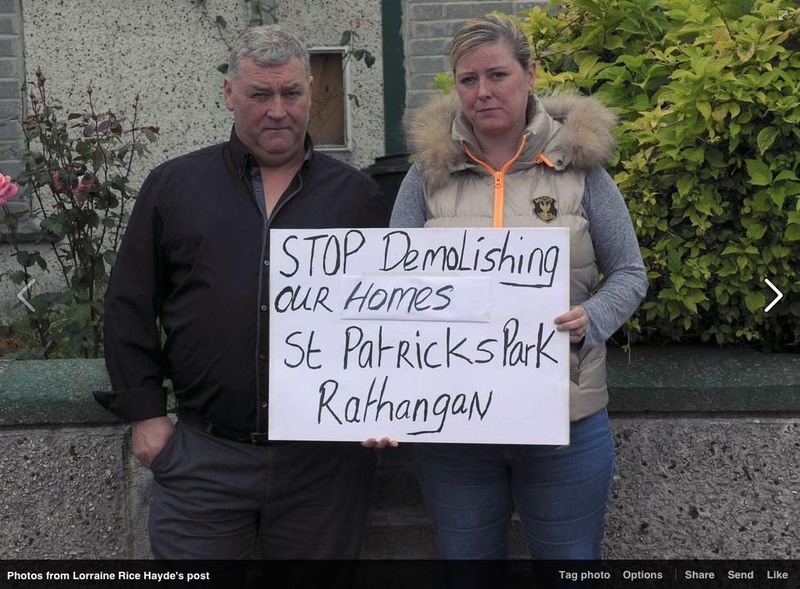 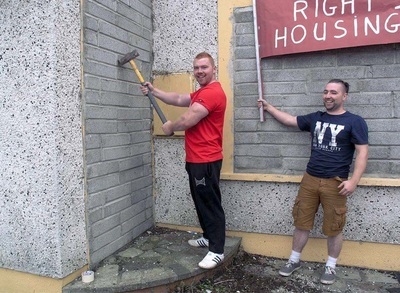 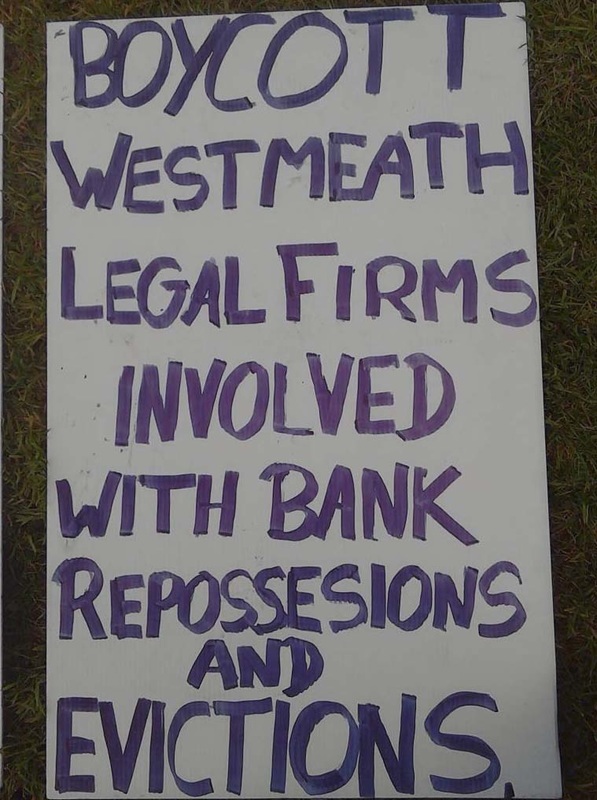 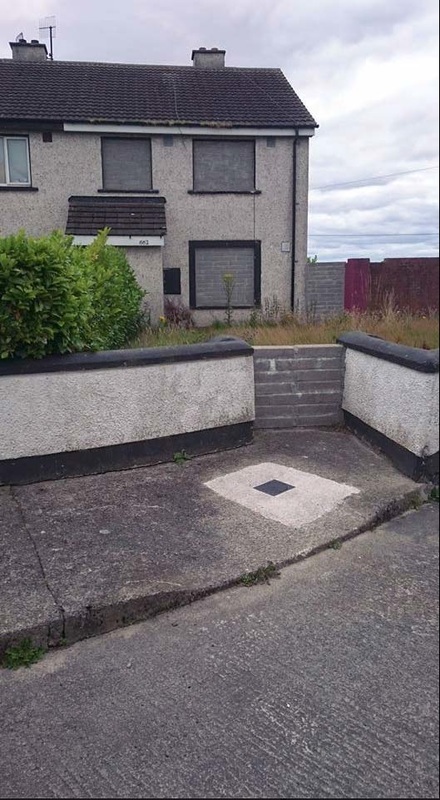 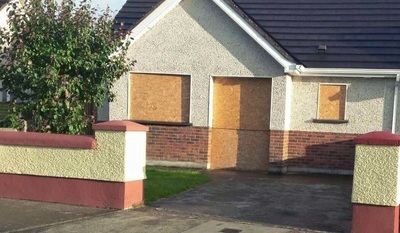 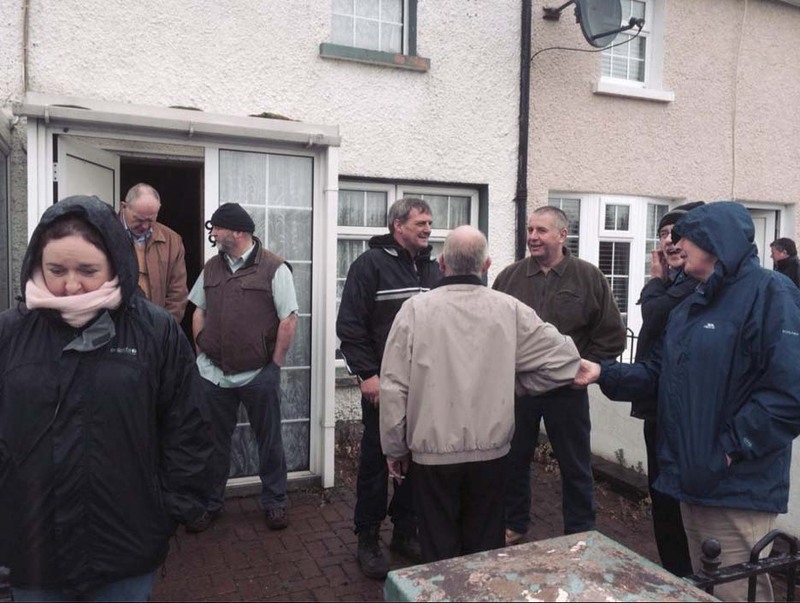 Anti Eviction Ireland - Midlands intends to highlight this double standard and we intend to keep the pressure up until the people of Westmeath know exactly what St. Loman's Grab All Association are facilitating. 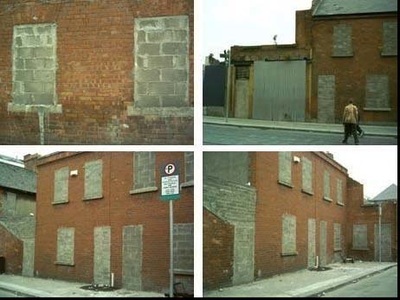 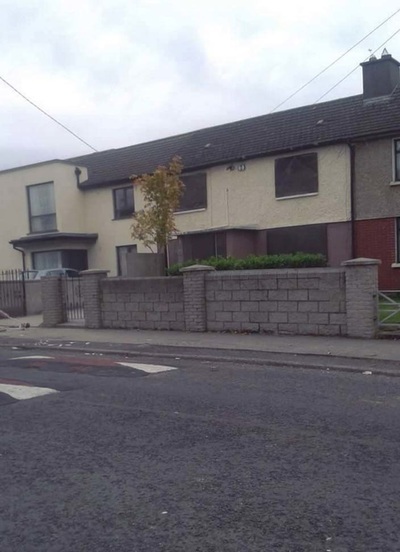 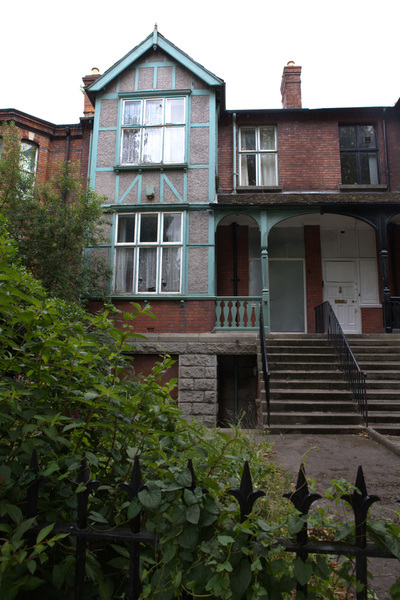 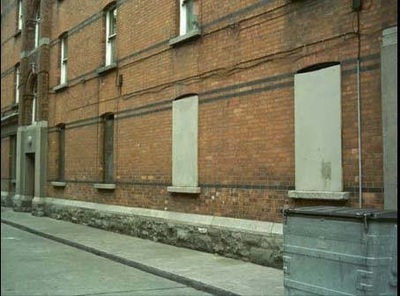 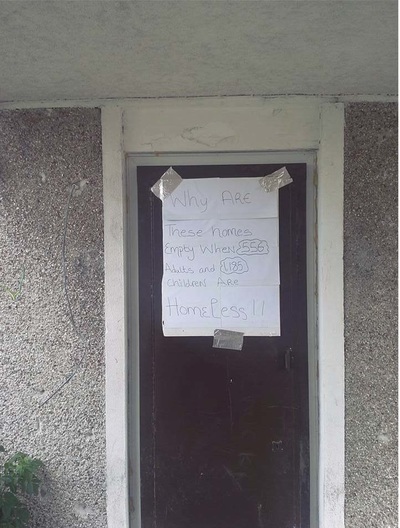 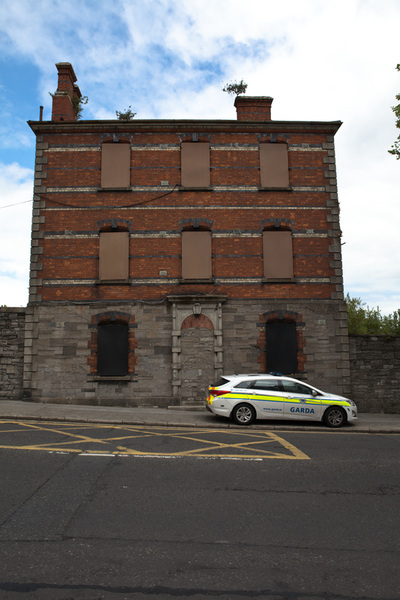 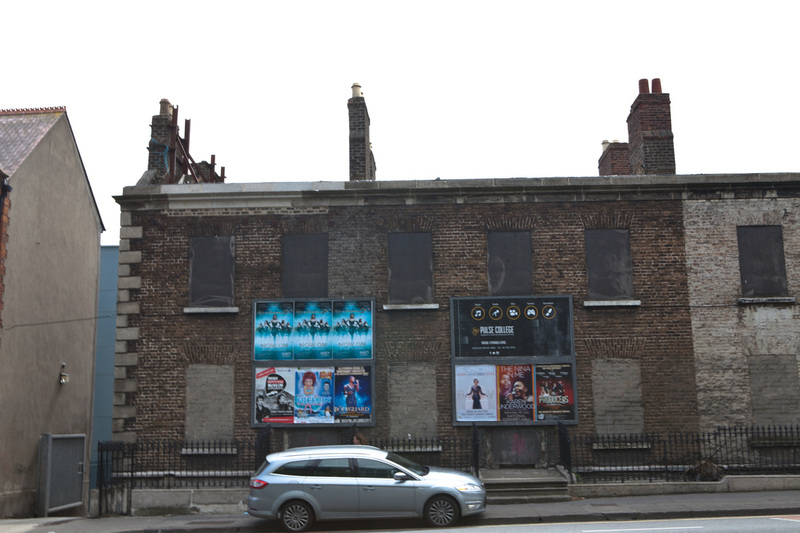 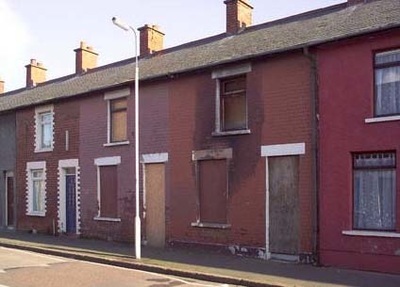 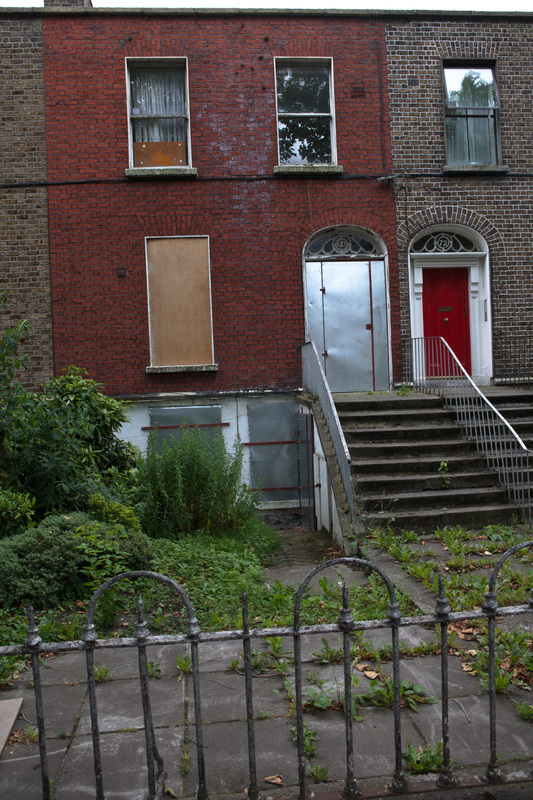 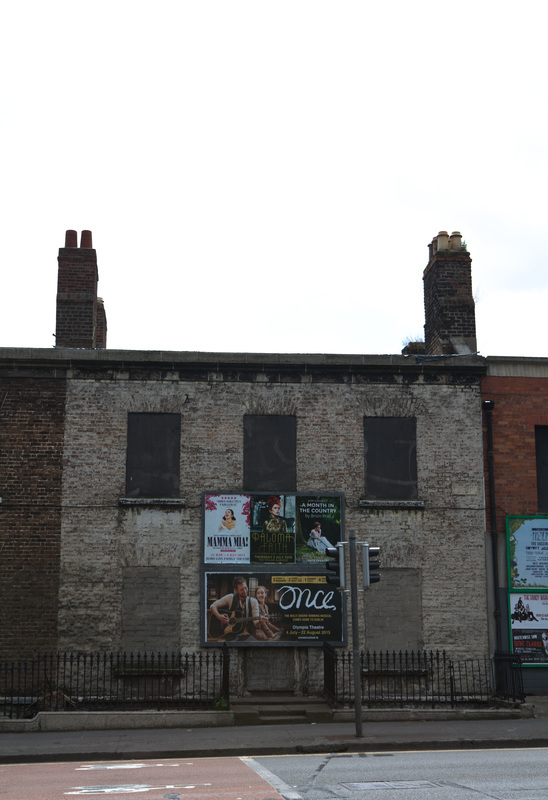 The houses on Benburb Street near Collins Barracks Museum, 100 feet from a homeless hostel. 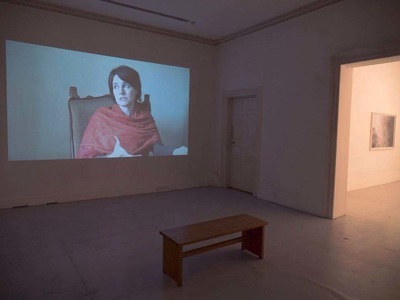 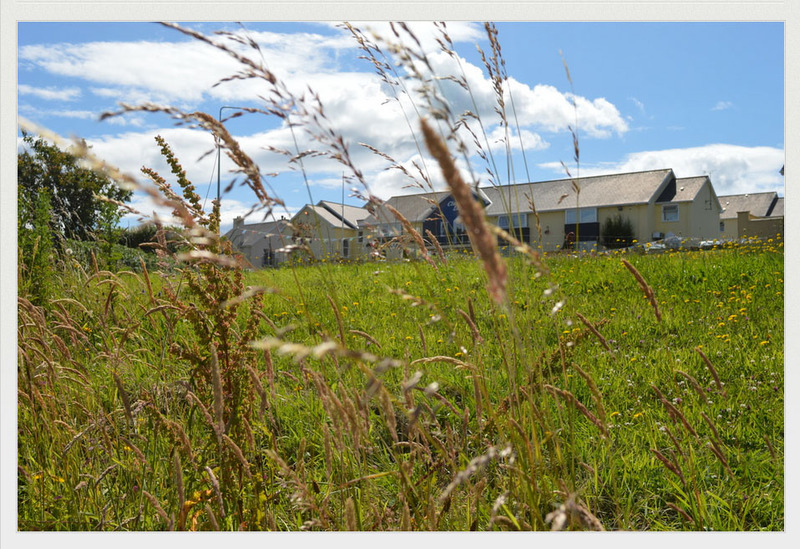 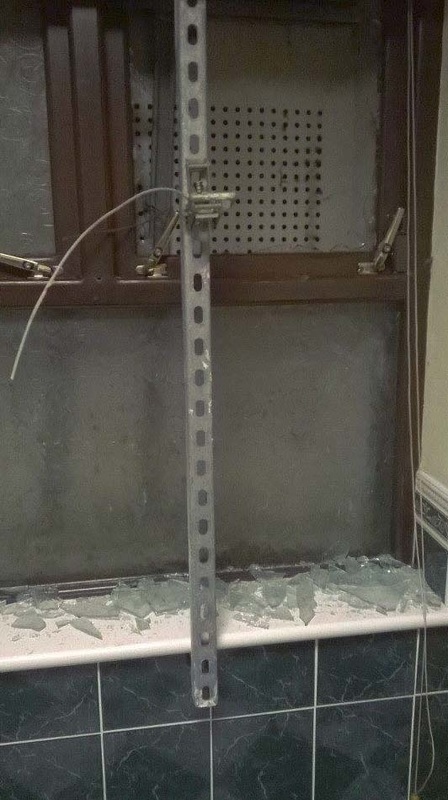 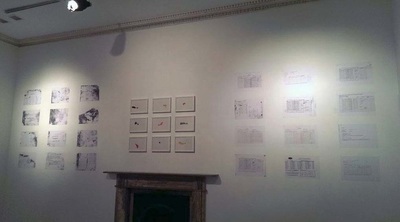 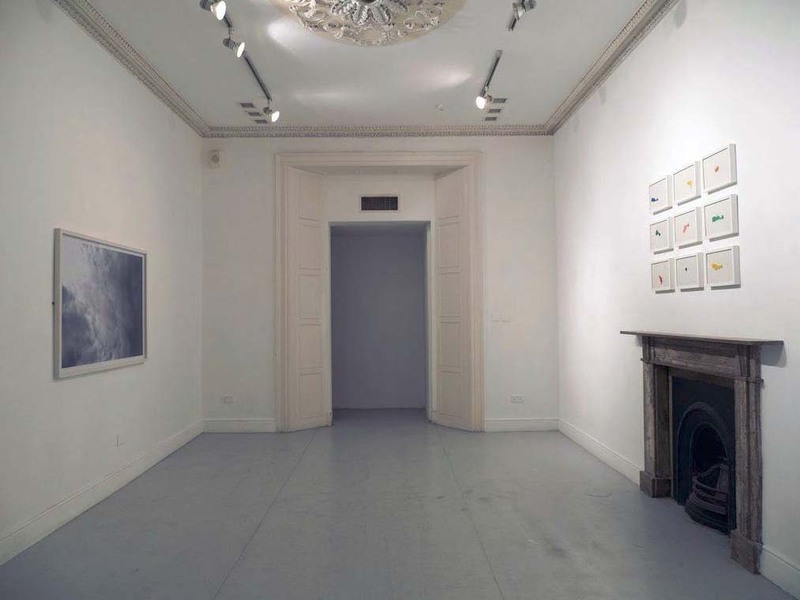 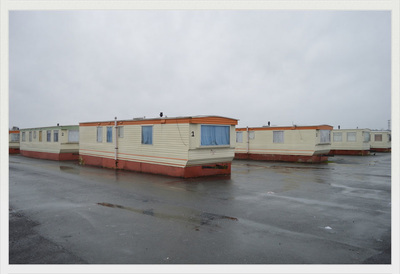 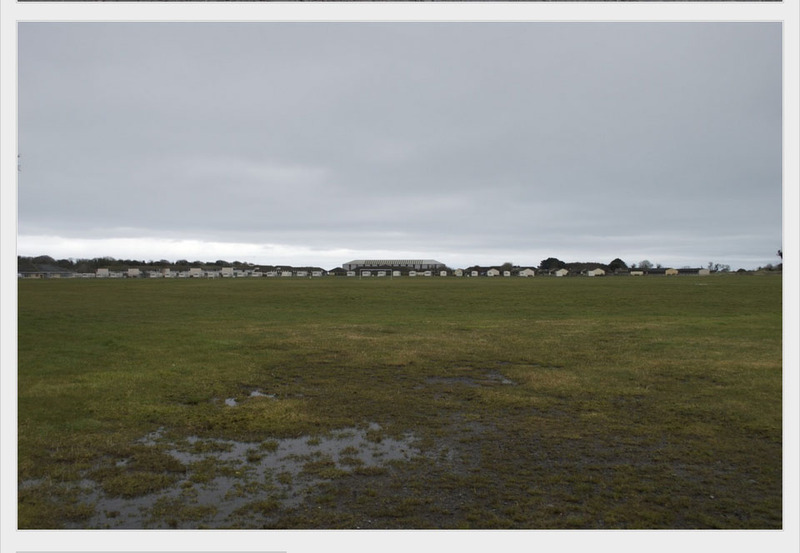 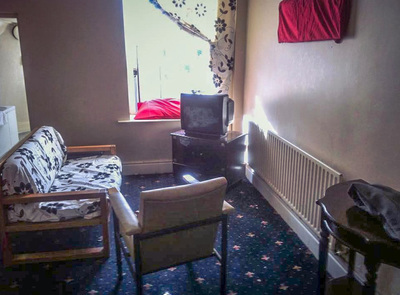 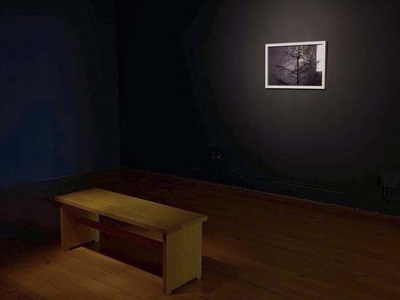 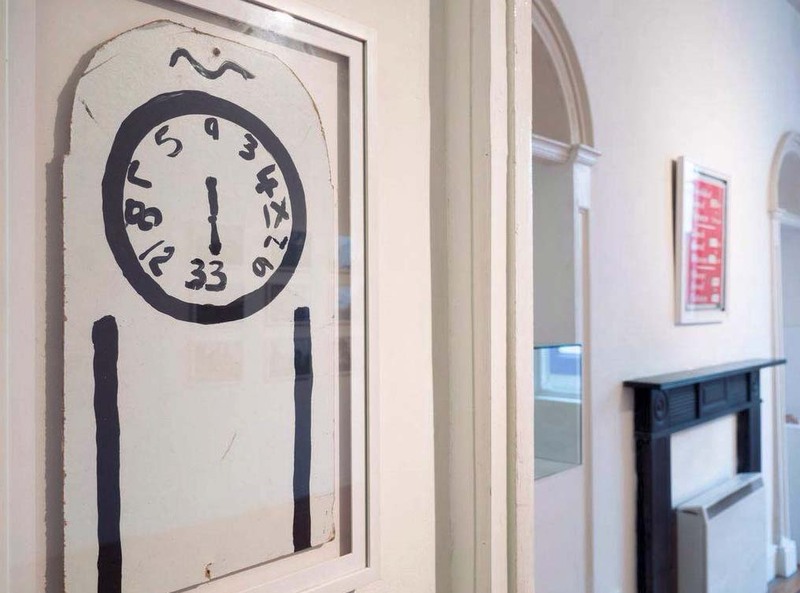 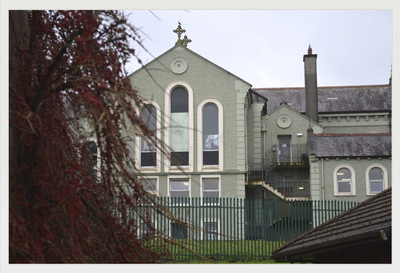 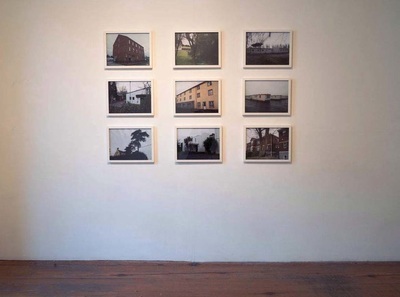 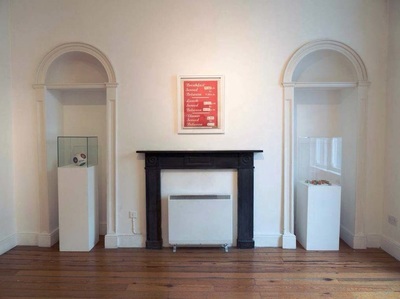 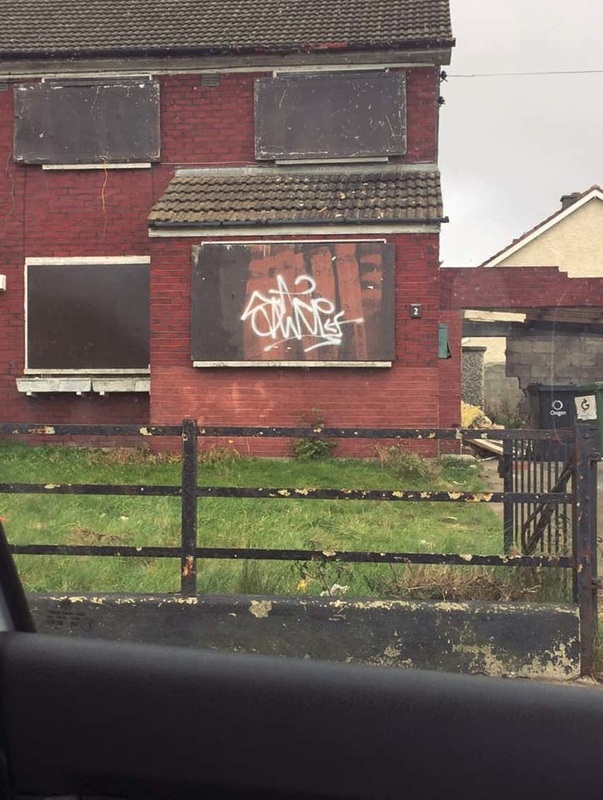 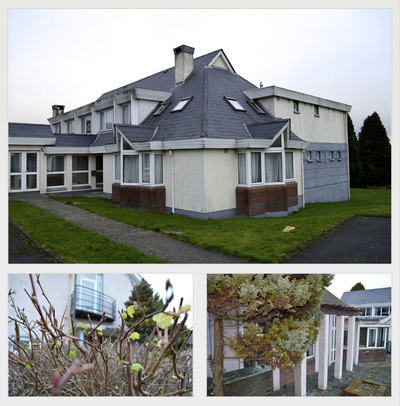 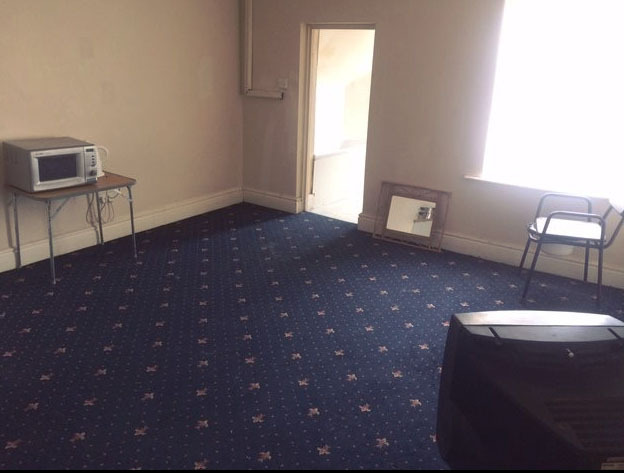 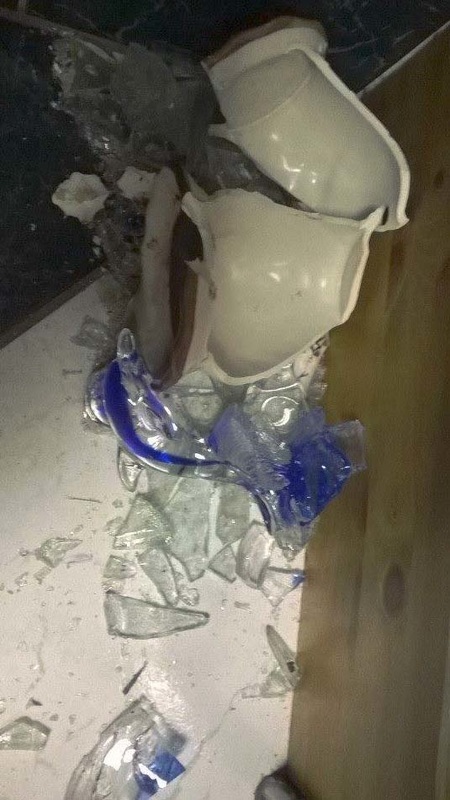 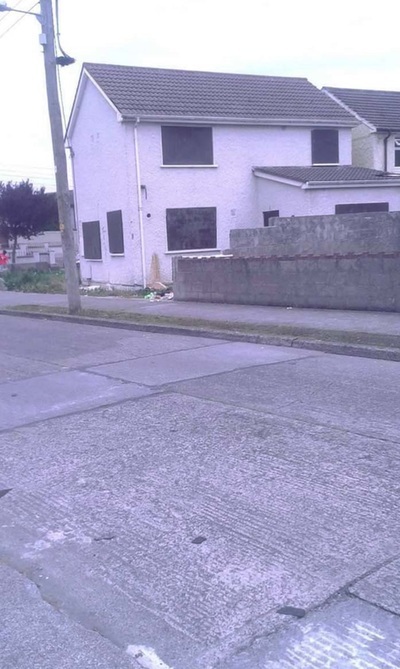 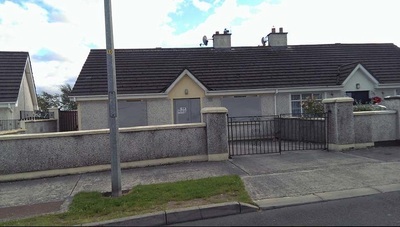 Asylum Archive employs fieldwork research through the process of taking photographs of direct provision centre’s and found discarded or abandoned artefacts; conducting video and audio records with human rights advocates and activists and collecting publications, reports, scholarly essays and newspaper articles related to asylum process. 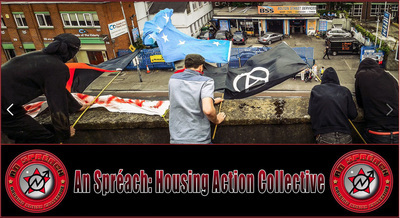 Asylum Archive’s objective is to collaborate with asylum seekers, artists, academics,sociologists, philosophers, human rights workers, activists, theorists, immigration lawyers, in the process of creating a national and international platform that deals with issues of exile and asylum, displacement, trauma and memory, transnational migration and immigration policy.Asylum Archive has an essential visual, informative and educational perspective. 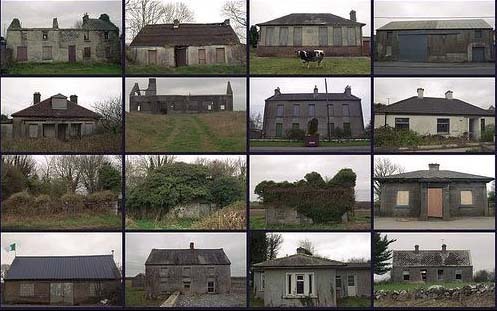 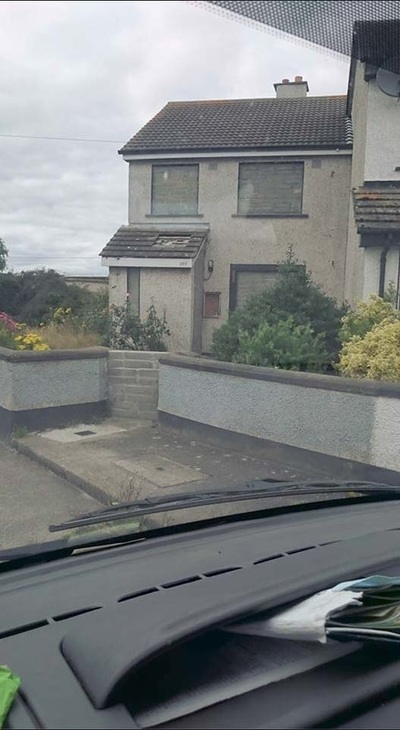 A selection of houses on the drive to Galway. 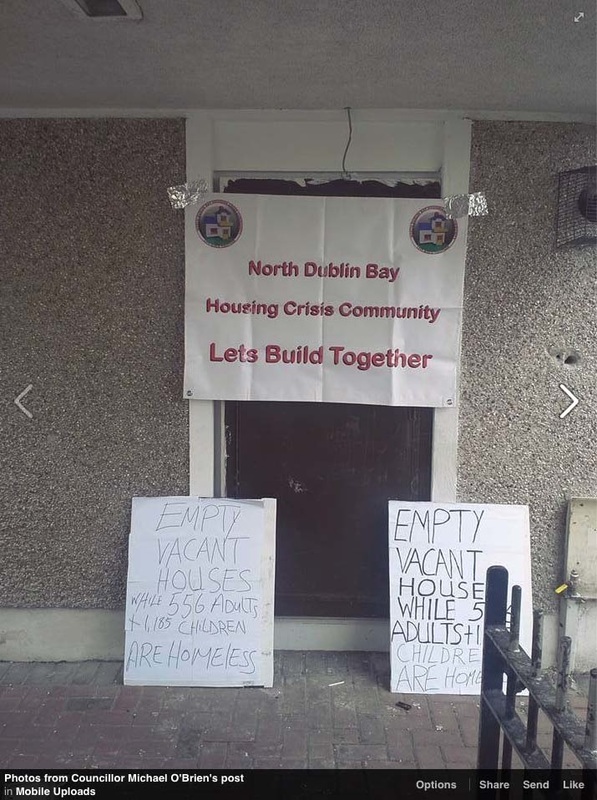 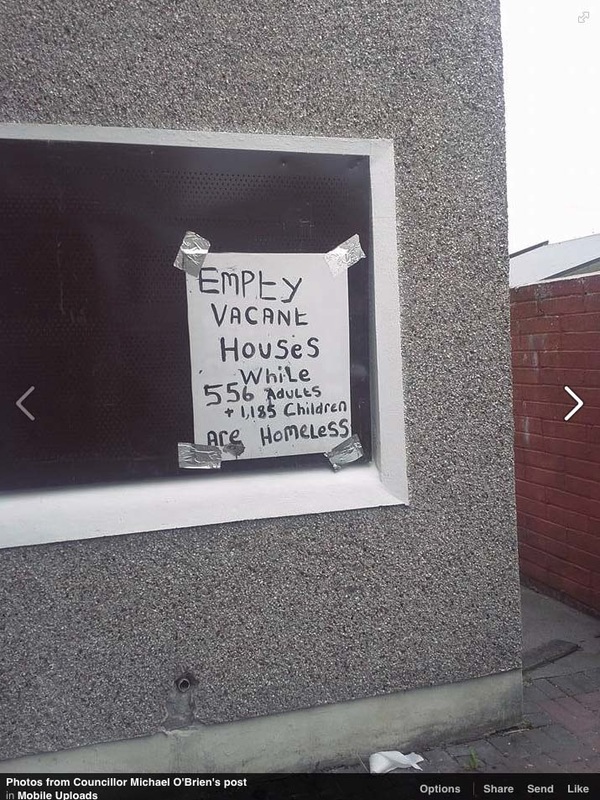 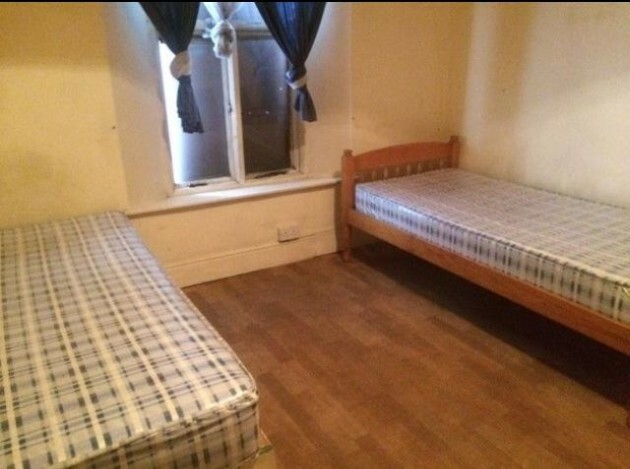 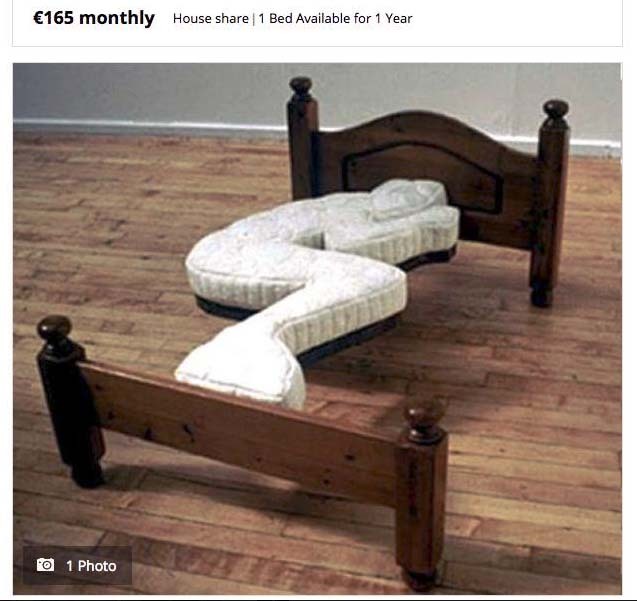 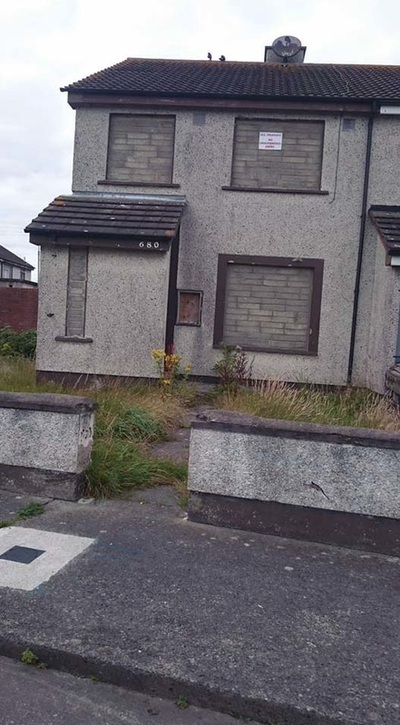 Perfectly reasonable for there to be anger when you see this all over the country and we're told you have to be homeless or pay huge rents because there are no homes available. I belive the response to that is bloody lies! 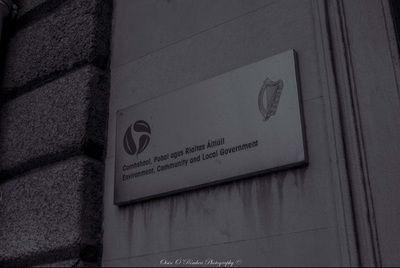 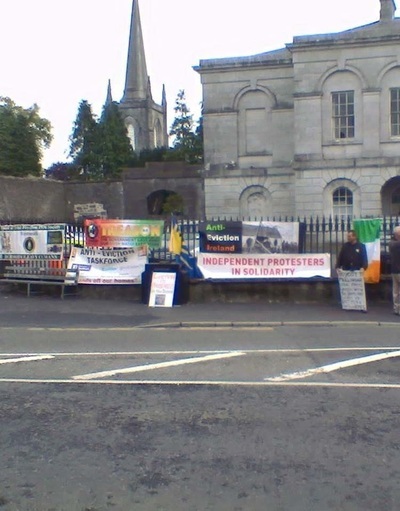 Brand new signage outside Castlebar Court House.